Non-Candy Easter Basket Ideas as seen on The Jason Show! 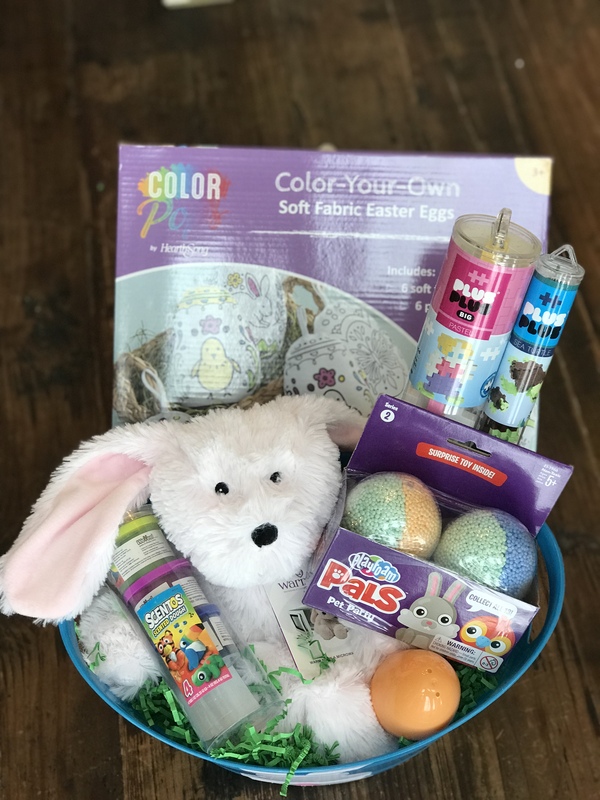 Easter is right around the corner, and if you’re like us, you have a love-hate relationship with Easter baskets…we LOVE the opportunity to gift our kids with fun, spring-time items…but we hate the thought of another round of sugar-induced crazies (didn’t we JUST have Valentine’s Day??). Have no fear! 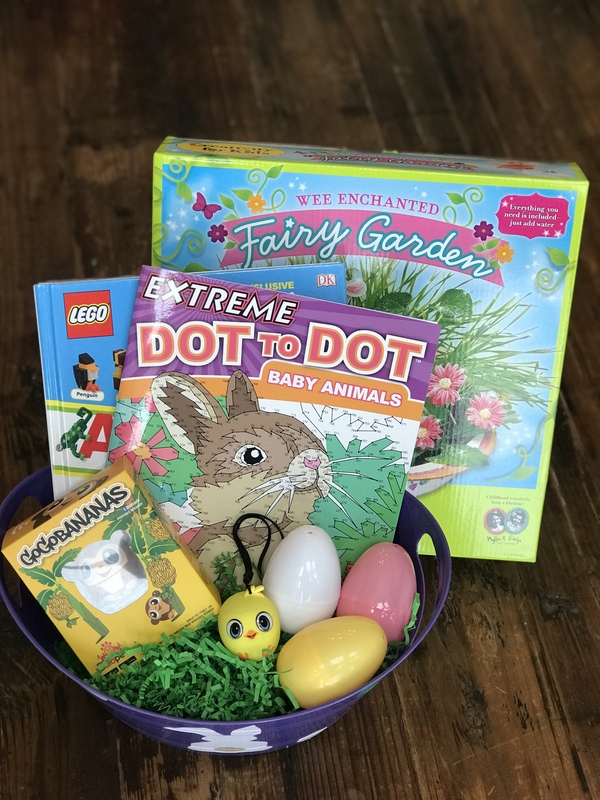 We’ve scoured the toy stores and searched the internet to put together baskets for your littles, middles, and teens. The best part is: none of these gifts will cause a sugar crash! We LOVE this basked, 100% curated from ABC Toy Zone in Chanhassen, MN (they also have a Rochester, MN location). The Plus Plus building bricks are an award-winning toy that will keep your preschoolers/kindergartners busy for hours…try filling your Easter eggs with individual pieces of these bricks, and when your kids are done with their hunt, they’ll have a figure to assemble! Small containers of scented dough, “SCENTOS,” can be stuffed inside jumbo eggs as well. This lavender-scented Warmies bunny can be heated up in the microwave and used as a weighted comfort animal, while the Playfoam Pals encourage fine-motor skill development as your preschooler digs through the foam for the surprise inside! Lastly, these color-your-own fabric Easter Eggs will outlast your dyed eggs, again encouraging creativity and motor skill development. Our basket for “middles,” or elementary school-aged children, is so fun! The TOP hit in this basket is the My Audio Pet bluetooth speaker, one of Oprah’s Favorite Things 2 years in a row. We first found it on Amazon, but they have it at ABC, too! These give you a BIG sound in a speaker the size of a golf ball! With a 4-hour run time when fully charged, the stage will be set for your middle kiddo to engage in creative play. With so many animals to choose from, you’ll want to collect the whole gang–they are SO cute!! We also included the Wee Enchanted Fairy Garden from Michaels. This is also an award winning toy that comes with everything you need to create your own fairy world from the pot, to the paint, to the glitter, fairy, toadstools, seeds and soil! All you need to do is decorate it and add water. Lastly, a Lego Animal book (build your own lego animals!!) and an Extreme Dot to Dot (both available at ABC Toy Zone) round out this basket. Ahhh teens. They need everything at this age: clothing and accessories often topping the list! Treat them to bath bombs from Da Bomb and throw in the matching book–it’ll teach them a thing or two about entrepreneurship! Wireless earbuds are always on a teen’s list, and wild-patterned socks from Express and Old Navy are a huge hit with teenage boys right now. Toss in a pair of flip-flops, and he’ll be good to go. 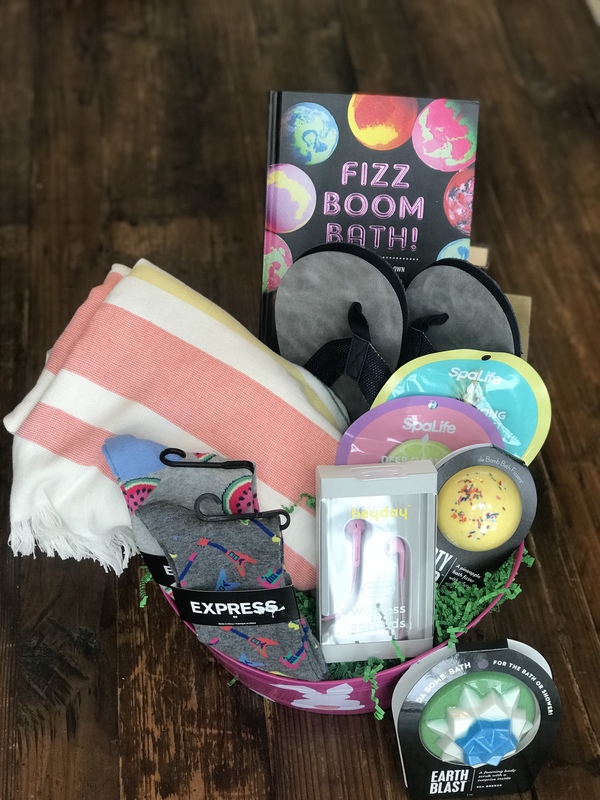 Your teenage daughter will LOVE this bath towel from OpalHouse at Target, and a few face masks will keep her skin glowy for spring. Of course, we can’t ignore the fact that SOME Easter Candy is a fun and necessary part of childhood…we recommend Reese’s Eggs. They’ve got a great peanut butter to chocolate ratio. Might as well buy an extra bag for yourself!! 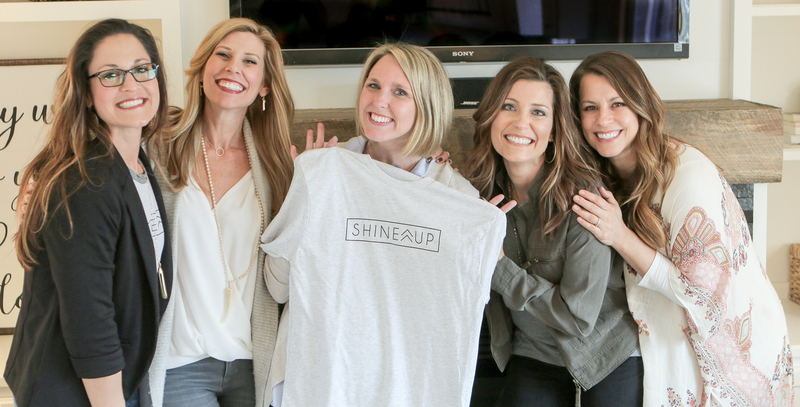 They're moms inspiring other moms to live a life that "shines." Jen and Amy from Shineup Living share their ideas on gifts for your girlfriends. 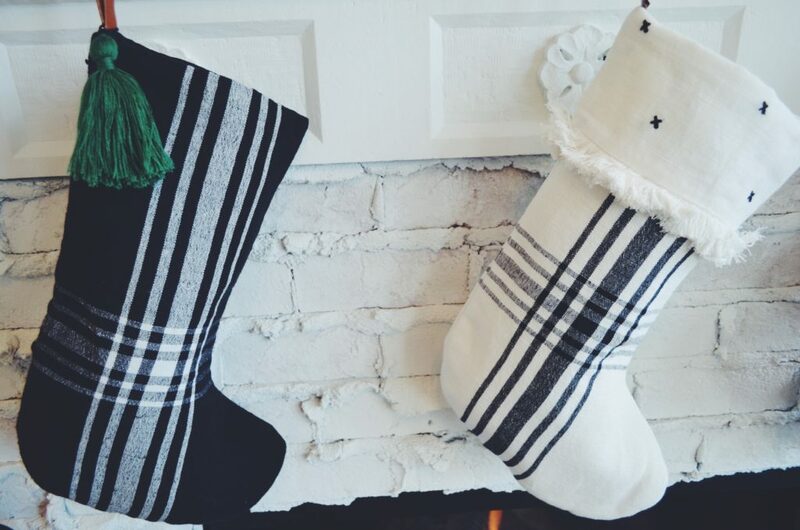 These are one of our absolute favorite gifts to give. Who wouldn’t want a hug for their feet, especially when it’s cold outside? We love these because they’re not only pretty but very practical. You know people will actually use them on a daily basis. We particularly love these because they allow us to give the gift of a luxury item, without luxury price. 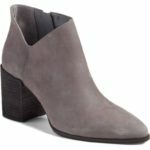 Ugg boots can be upwards of $200, so maybe you can’t gift someone a pair of Uggs, but you can give them a pair of these for under $50. They still have the super soft plush lining Ugg is known for. They are machine washable and we love that they are one size fits all so you don’t have to guess on size. We found this little gem at Old Navy at the beginning of the season, and we’ve ended up gifting it a couple of times already!! 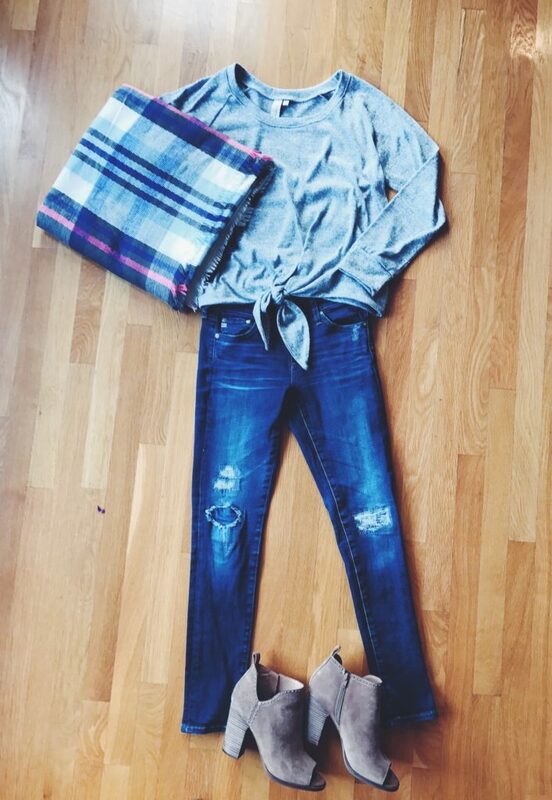 It’s a flannel blanket scarf…Soft, cozy, again, the name of the game this year is COZY. It’s the perfect combination of colors, subtle but super cute. Looks great with any jacket or sweater. 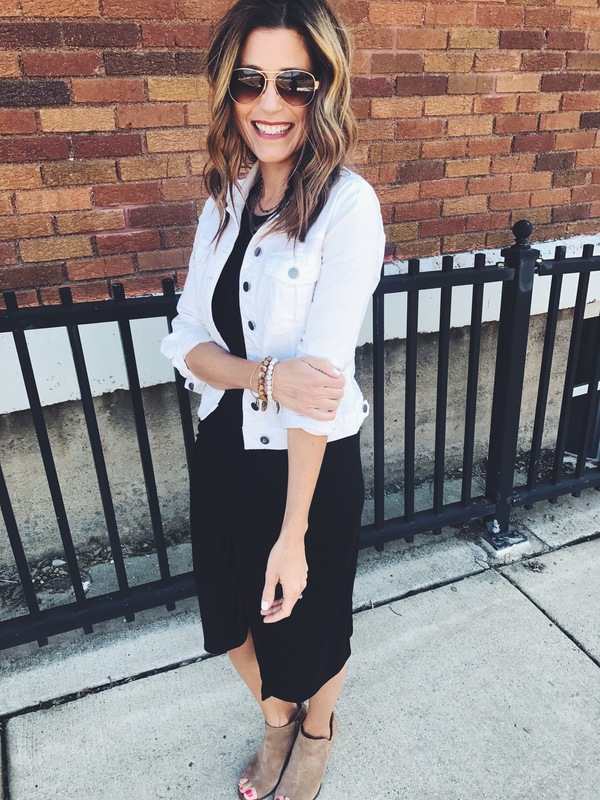 Ivory and grey, all the neutrals are really hot this season, and at $15 it’s a steal!! Don’t wait on this one, it WILL sell out!! 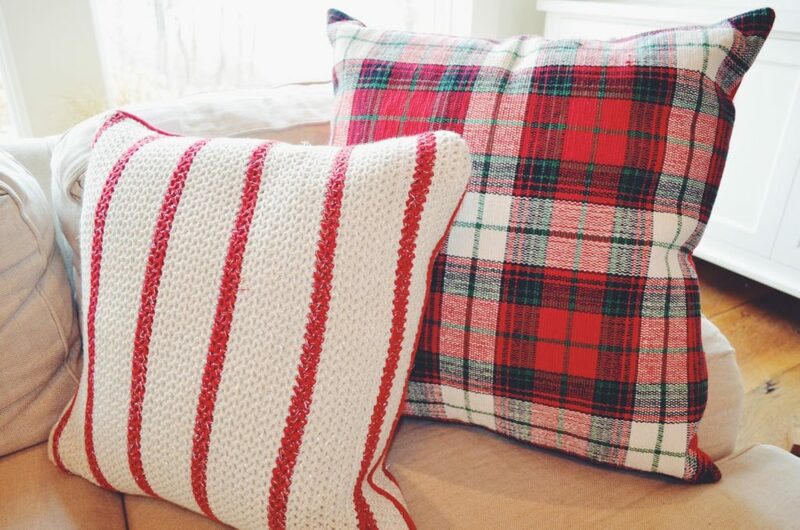 So this time of year is all about the comforts of home. 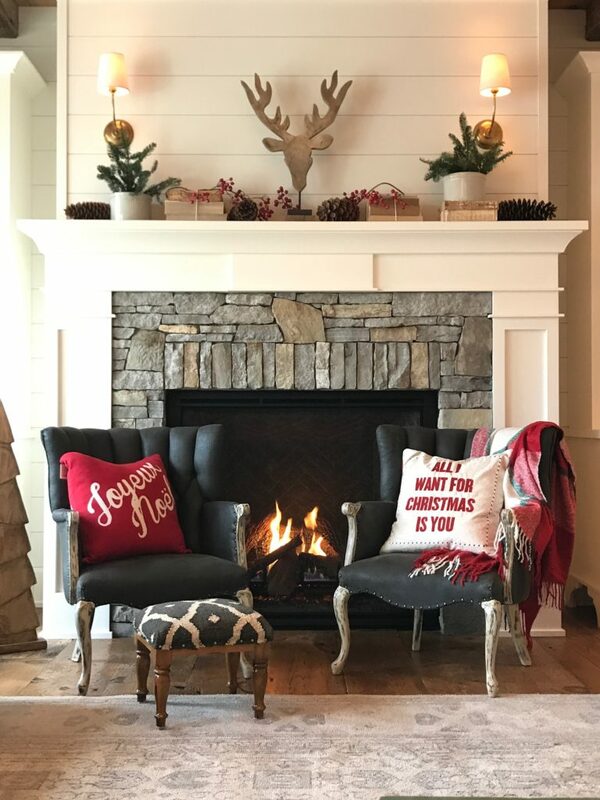 As moms and women, we’re all interested in creating warm and inviting spaces that are welcoming for the holidays and that our family and friends want to be in. 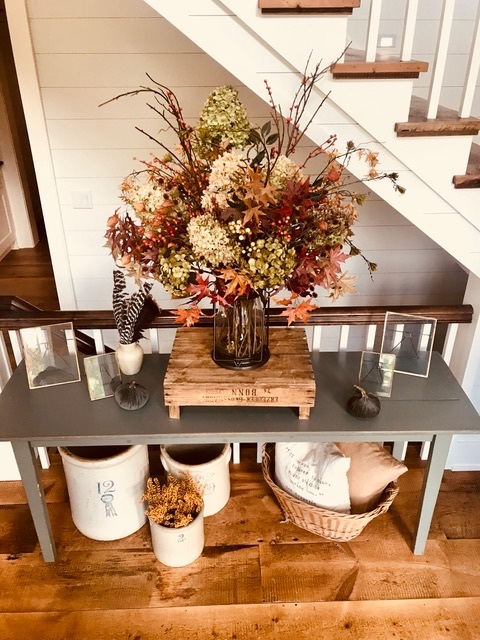 And who does welcoming spaces better than Joanna Gaines? 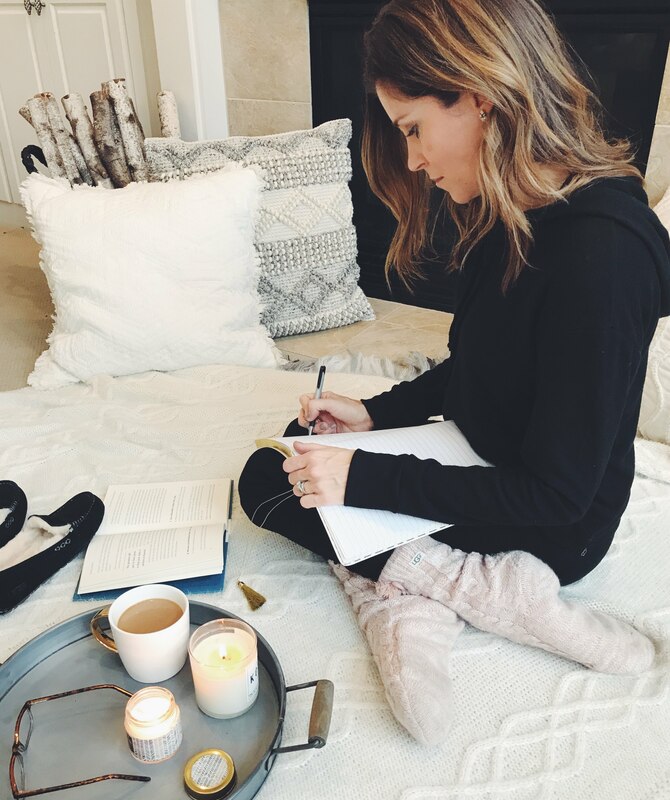 Joanna’s book, Homebody- “creating spaces you never want to leave” walks us through how to create a home that reflects our own personal stories and personalities. 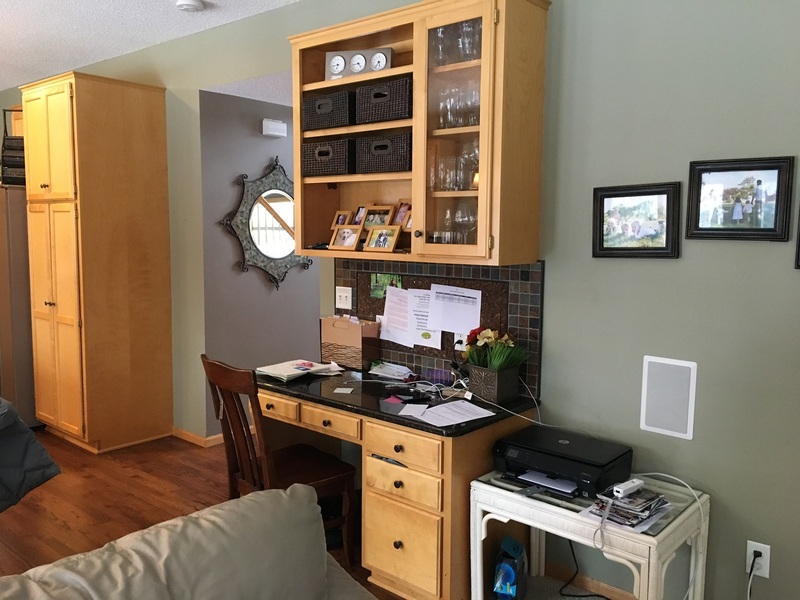 She shares a lot of her own personal commentary in creating her own home. We love that it’s a book that you can really dive into and take your time with. And hey, the holidays are a great time to slow down, and soak in a good book- so that’s why we put it on our top five list. We just discovered this T-shirt company called “The Bee & the Fox” and we are obsessed!! Not only do they have SUPER CUTE t-shirt designs (and cute graphic tees can be hard to find), but they’re SO affordable!! Graphic tees in local boutiques can cost upwards of $60-$80, but this one is a steal at $28!! 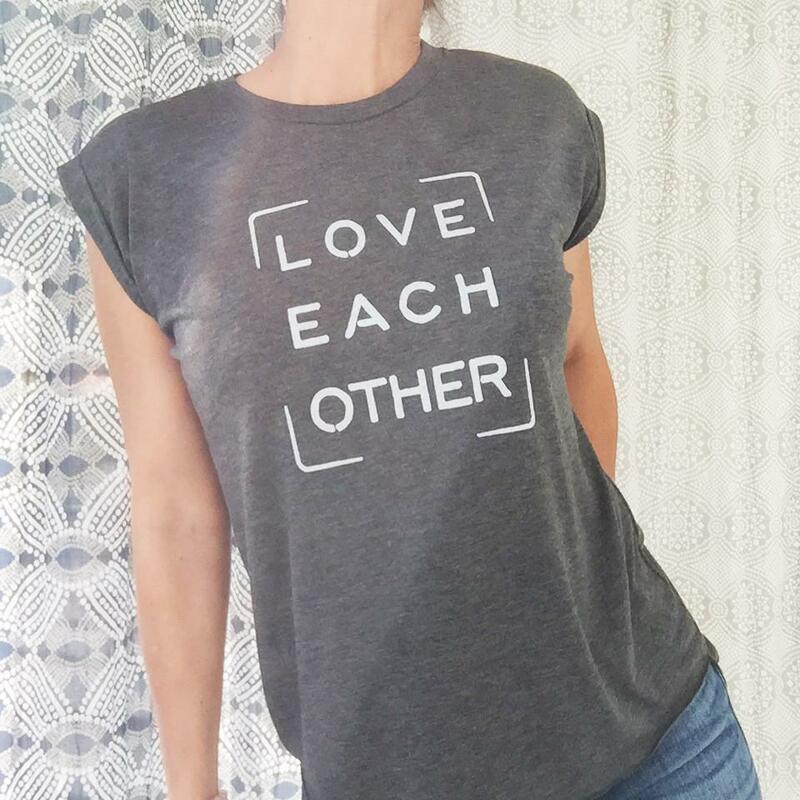 It’s a lightweight slub textured tee, and the font is great, it’s that trending ivory and black color combo, and looks great year round, both under a cozy cardigan or a denim jacket. Perfect little gem for any mom on your list, check out their full assortment at thebeeandthefox.com. We are obsessed with this Sherpa!! Sherpa is all the rage right now and sweatshirts like this can be pretty expensive, but this one by Thread and Supply is currently on sale for $49.90. It’s like wearing a cloud and you’ll NEVER want to take off. 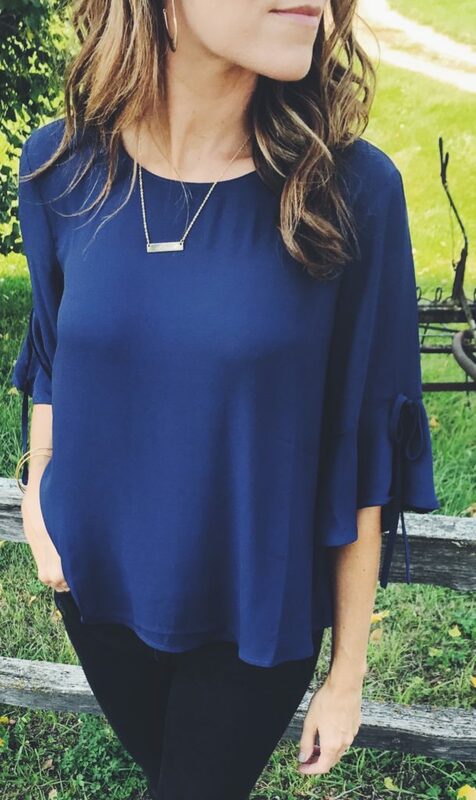 We actually own this top in different colors, and it’s hands down the softest top you’ll ever own. Perfect for cold winter days. Runs true to size, and is a great gift for anyone on your list!! Normally $78, it’s on sale right now for just under $50! 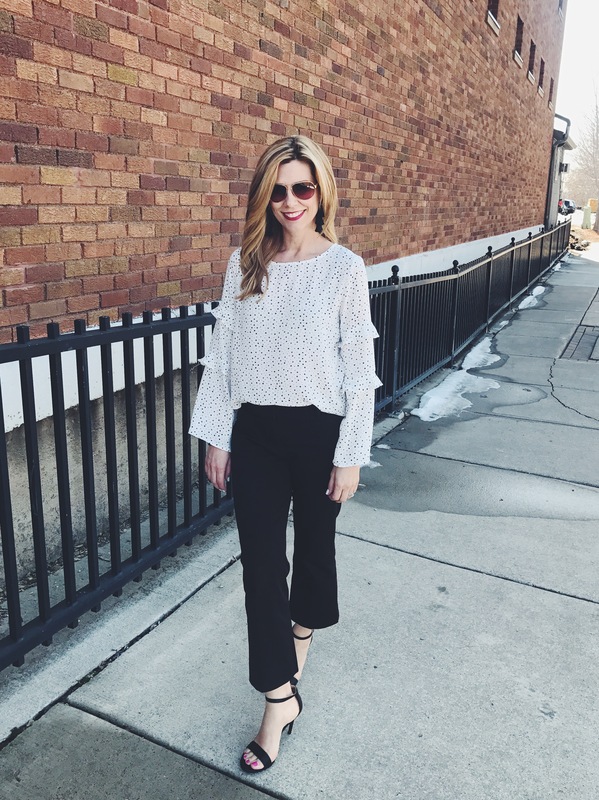 Best In White Denim: As Seen On Twin Cities Live! 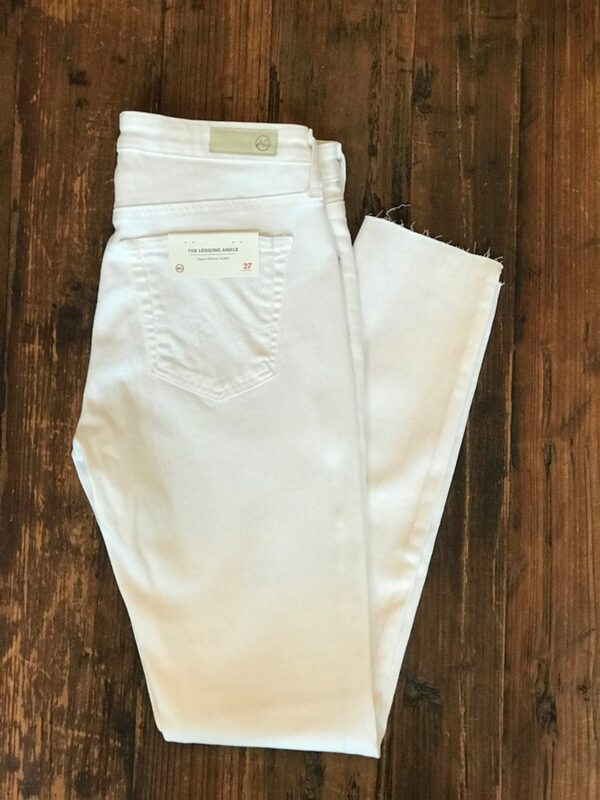 If you’re looking to invest in one classic pair of white denim that make you feel great, these are it! 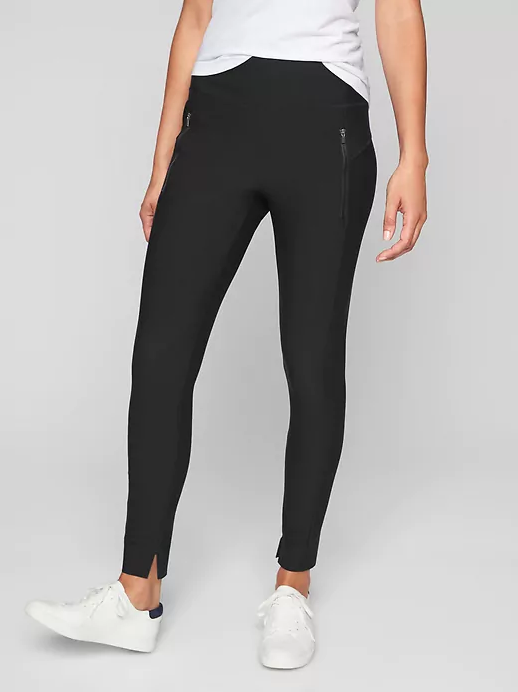 These are the AG Legging Ankle and they have long been our go-to. They are a higher price point at $188, but the fit and quality is amazing. They have a bit of stretch to them, so they are really comfortable too. 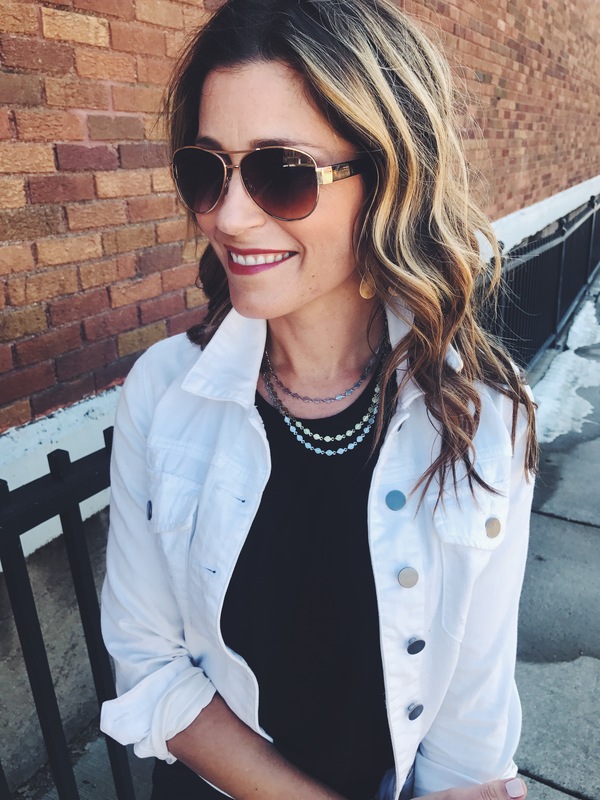 With a classic grey top and simple jewelry, this is a great wear-to-work style. This next pair is our pick for best relaxed style. 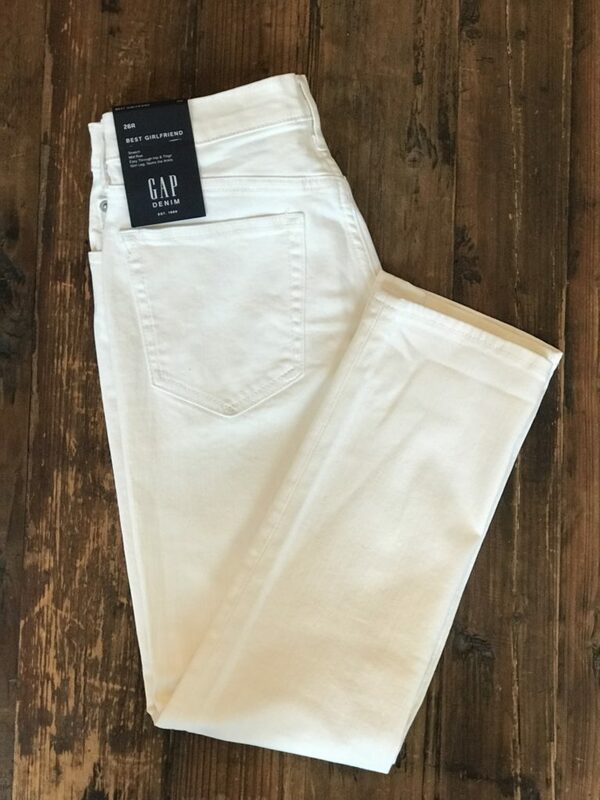 They are the “best girlfriend jean” from the Gap, and when we tried these on we just couldn’t resist buying a pair—they are THAT comfortable. We also love the price point at just under $70. They are mid-rise, relaxed through the hip and thigh, and have great pocket placement that’s really flattering to the backside. These are really great for all body types, especially those of us with curves. 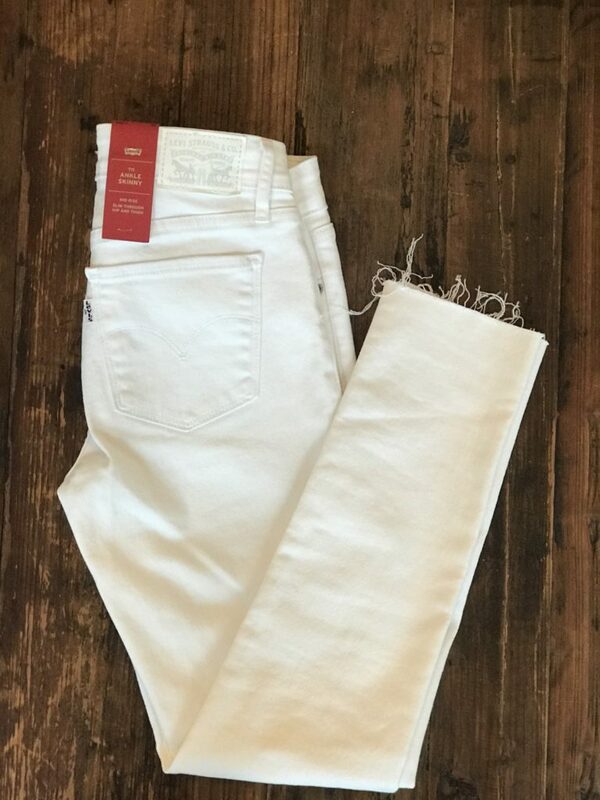 As a general rule, when you’re buying white denim, you go up a size, and that is the case with these jeans if you want them to be a little slouchy. 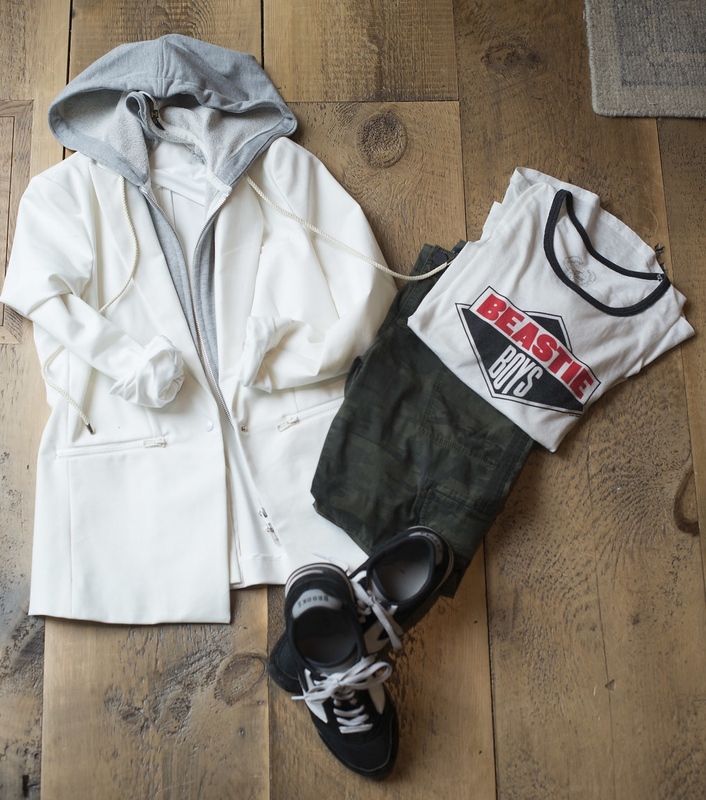 We styled these for a casual, running around, gettin’ it done look. These are our pick for best distressed style, which has been really on trend the past few seasons. The denim has a bit of a heavier weight, with just the right amount of stretch, and it gives a really smooth look to the denim. Levi’s are really making a comeback in a lot of higher end boutiques! They’ve updated their styles, and these in particular have rave reviews online; in fact, in one fashion poll, these rank even higher than all of the expensive, designer brands. We styled these with a really pretty, floral top from one of our favorite boutiques, Willa June. We love pairing distressed denim with something really feminine. It’s a great juxtaposition, perfect for date night or a night out on the town with girlfriends. That’s it, friends! White denim is a GO for spring, and we couldn’t be happier about it. Happy May Day!! Spring has arrived and there is a definite shift in the atmosphere! Do you feel it? We do too! After a very looooong winter, new life is starting to flourish and we couldn’t be happier to welcome a new sense of hope for dormant things to spring to life. It’s amazing how much our lives imitate nature. Recently, we had a great excuse to break out of the sweats we’ve been wearing all winter, get all dressed up, and head to a beautiful event held by the National Charity League: an amazing organization that supports mothers and daughters who are serving their communities through volunteering together. What a beautiful picture of how moms can change the world by passing on a legacy of demonstrating love. Love shows up, right? So, we asked ourselves: what are we doing here? What is the unique purpose we were made for? Same goes for you, what were YOU meant to inject into the world? What is your purpose, beyond child rearing or your day job? If you don’t know, that’s ok, but perhaps it’s worth digging into a bit. We started with simple questions like: what do we love to do? What did we enjoy doing as children? When do we feel the most alive? What makes us unique? Sometimes, when we’re uncovering our purpose, we find that it’s been there all along—little glimpses are woven throughout the fabric of our lives. 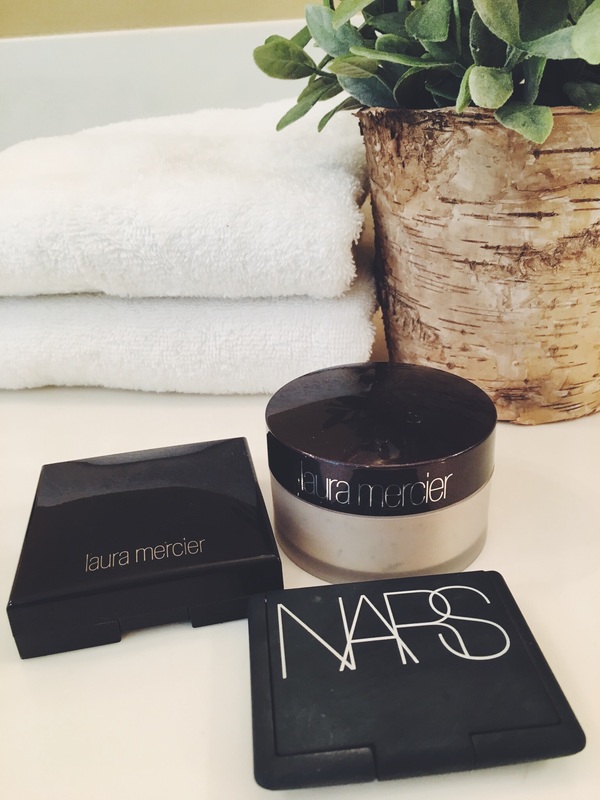 For the two of us: we are beauty builders. Storytellers. Encouragers. And that informs everything we do as we pursue the passion of helping moms discover their true beauty. It also sets us free from feeling shame over what we’re not, because comparison kills, and none of us has time for that. So, if you’re in the midst of piles of dirty laundry, jelly-stained furniture and eating grilled cheese crust for lunch, we wanna tell you this: it’s okay to pay some attention to the things that stir your heart. Even if they’re not meant for right now, there will be a time for cultivating your purpose. Your family needs you, yes; but the world needs you, too! Your uniqueness, your gifts. However insignificant you might think they are – maybe you love to bake, maybe you love animals, maybe singing sets you on fire…there is great meaning behind the things you’re passionate about. Pay attention to those things, and don’t lose sight of them. We’ve said it before, and we’ll say it again: you, dear one, were born to shine! Phew. The holidays are over. Not gonna lie to you, friends: this year, the season was hard for me. Maybe it was the unseasonably cold weather in Minnesota. Maybe it was the first year celebrating Thanksgiving and Christmas without my parents around (they moved South in mid-November and didn’t come home for the holidays). Maybe it was just the general holiday blahs that, despite decorations and presents and parties, tend to creep in uninvited. Or maybe it was more than that. I’ve been pushing it hard this year. Stretching myself way beyond comfort, and spreading myself way too thin. Wake up, coffee, laundry, kids to school, work, kids from school, drive to and from practices, dinner, laundry, homework, bedtime routine, work, laundry, bed. Falling onto my pillow at night exhausted, and waking up even more so. Carving out time for friends? Too busy. Date night with my hubs? Nope. Kids need us. Sit down and watch a movie? There’s just too much to do. The holiday proclamations of “peace & joy” rang hollow for me. Any peace I’d felt earlier in the year had fled long before the temperature dropped in November. And really, I have no one to blame but myself. I did this to me. 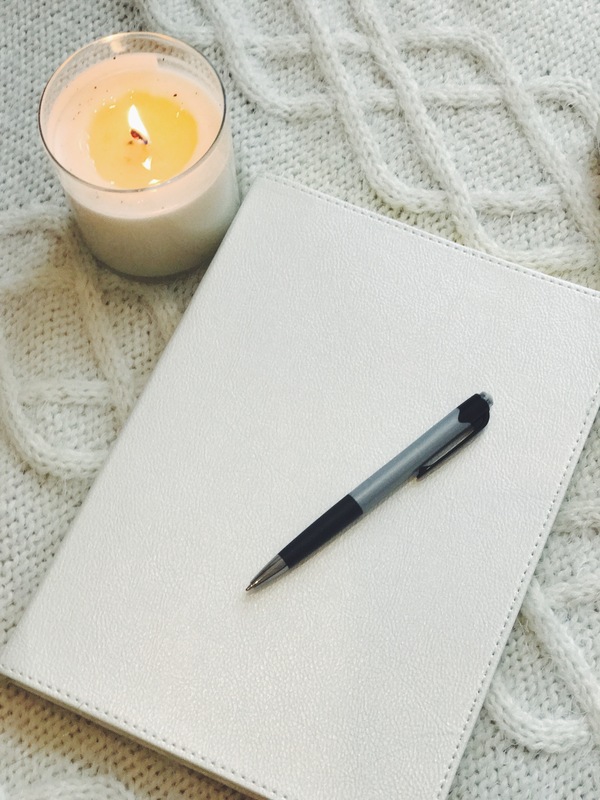 I filled my calendar with tasks and to-dos and didn’t schedule in any time for myself or self care, because who actually does that? Multi-tasking is the norm in our world. I remember when the term “multi-tasking” became a thing, and I remember writing it proudly on resumes as a young 20-something fresh out of college. Yes, I could multi-task. I could toggle between web pages and Photoshop and take phone calls from clients and field questions from co-workers, and play solitaire in the background of my 1999 desktop computer. It was a skill all of us young Gen-Xers were proud of. Our world was expanding, and with it, our need for mental capacity and flexibility. The Internet was exploding with e-commerce, and dot-coms were sprouting up around every corner. Multi-tasking was a necessary skill if you were to survive in the brand new 21st century. When I had kids, multi-tasking became handy and necessary to my survival. 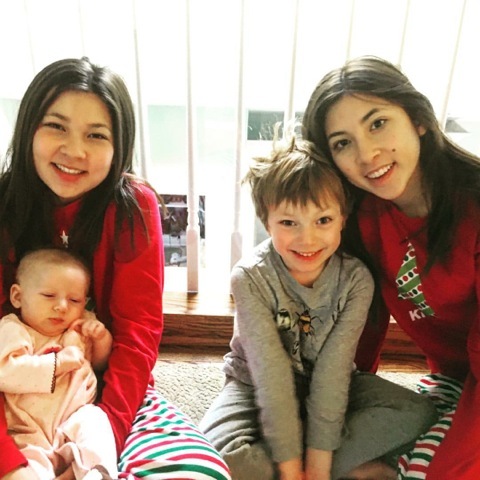 My first two babies were 16 months apart, which meant two sets of diapers to change, two sets of bottles to prep, two sets of pacifiers…moms, you get it. It was a messy, busy time. Rest was a rare luxury. Adding two more kids to that mix over the next few years, and I found myself creating habits of work, work, work, sleep, with little to no time for rest scheduled in. But somewhere in the last 20 years, I lost my peace; I don’t really remember how to rest. 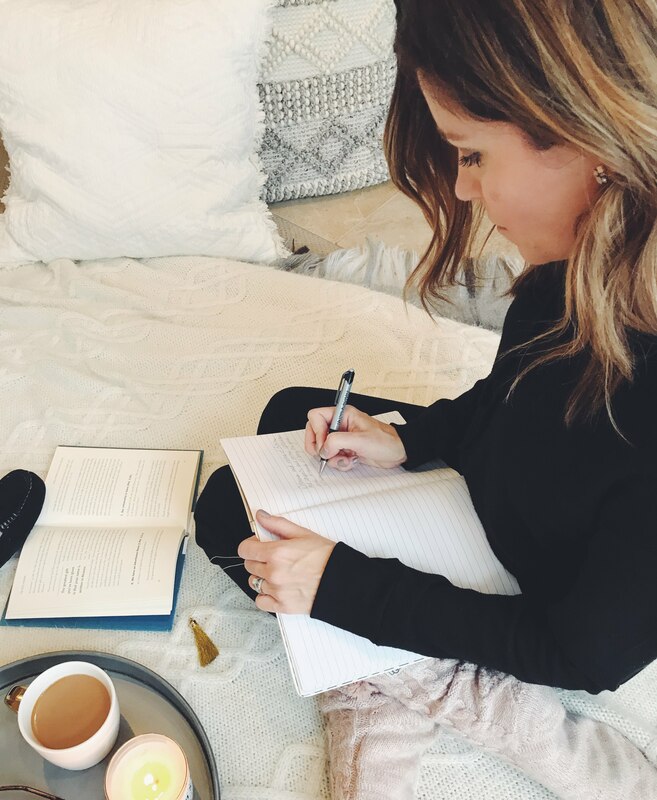 Years of multi-tasking have made sitting on the couch and doing nothing feel weird, and it is SO hard to slow down. And when I multi-task and split myself so many different ways, I don’t do anything well, I’m just checking things off and moving on to the next item out of sheer necessity. Mealtime+laundry+helping with homework+carpooling=rushed dinners/wrinkled clothing/absent-minded answers/checking my phone for texts while driving kids to practice. The worst thing about all of it is that my kids are watching me. They’re developing their sense of “normal” while watching me spin and spin and spin until I fall down. What am I teaching them by having a never-ending to-do list? When I’m crabby (because I’m tired) and snippy (because I don’t rest) I’m teaching them that doing is higher priority than being. The truth is, if you’re a mom (or dad) the to-do list never really does end. As long as I’m blessed with breath in these lungs and kids in this house, there will always be laundry and meals and work to do. I’m racing towards a finish line that is perpetually out of reach. And for me, it has to stop. I have to CREATE space for it to stop. And so, this year, I am making a promise to myself to find time for rest. To wear comfy clothes. To sit in front of the fire and read and journal. To say NO to doing the dishes and laundry right now so I can play a game with my kids instead. To sit with my husband and connect daily (a rarity in the last few years, honestly) and enjoy each other and just be. Mostly, it’ll look like putting tasks and chores on the back burner for awhile, or at least until I make time to rest every day. Not every day will be perfect–there is still a fair amount of multi-tasking that honestly needs to be done (clothes and dishes don’t wash themselves, folks). But I know that when I prioritize rest over tasks, I’ll find my peace again. And that is something worthy of working towards. Snuggle Up! 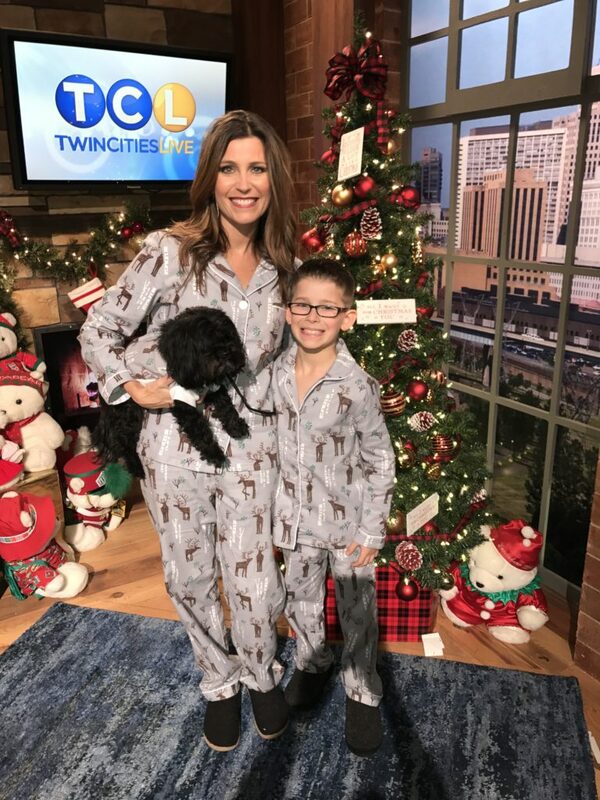 Family Jammies: As Seen on Twin Cities Live! To me, these scream Christmas! I love the classic, tartan plaid pattern on these. If you’d like, you can even get some for your dog! They have a loose fit and are made from 100% cotton. 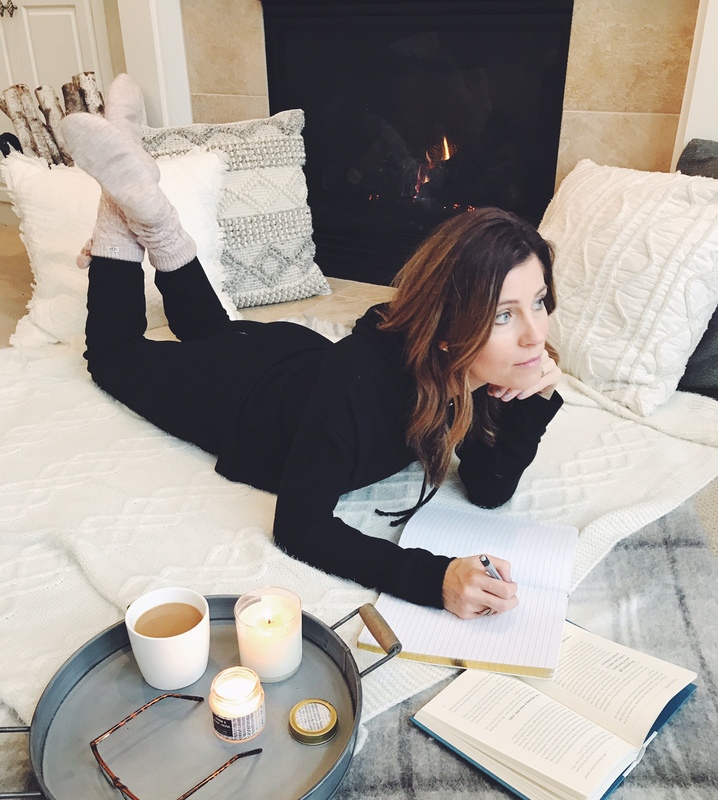 If you’re looking for Jammies that are appropriate for the Holidays, yet can be worn all winter long, these are it!! I love the neutral color palette along with nature-inspired design. These are totally gender neutral so even the men in your crew will feel comfortable wearing them. They run true to size, so DO NOT size up like most of us do with pajamas. You all will be swimming! 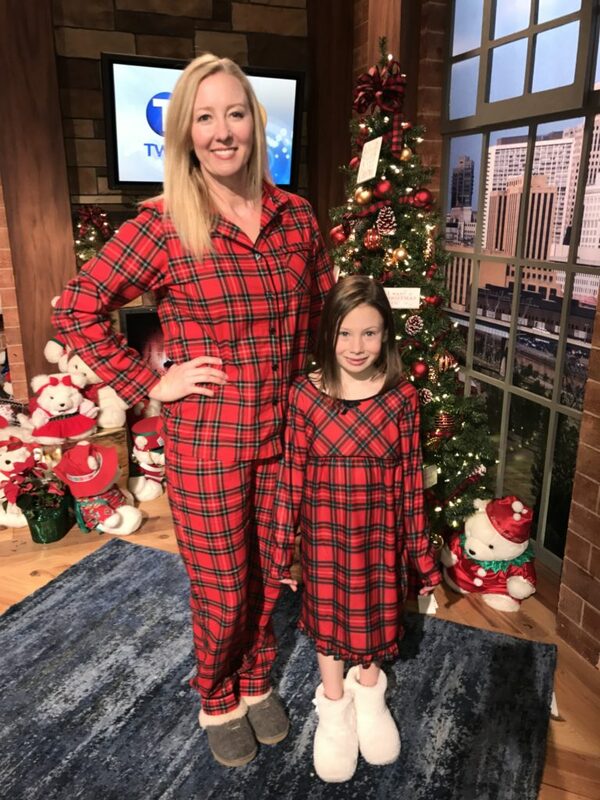 If matching pajamas aren’t your thing, and you want a more modern take on the family pajama tradition, not a problem, you just need to coordinate a bit. Here we went with a black and white theme, with just a nod to the holidays. I love this set that Abbie is wearing from the Simply Vera line by Vera Wang. If you don’t know about Vera Wang pajamas consider yourself in the know! (Until now, it’s been my little secret.) They are so luxurious and very fashion forward. I love the jogger bottoms on these and the set comes complete with the knit hat!! So cute. Here’s to making lots of memories this holiday season, friends! Hope you and yours have lots of time to snuggle up! We love shopping for friends and family, but let’s face it: sometimes the barrage of marketing this time of year can be SO overwhelming. Pressure and stress creep in, and before you know it, you’re clicking away madly on Amazon Prime, hoping that the two-day shipping actually makes it in time for the big day. Well, in the spirit of helping each other out this holiday season, we’re sharing our favorite picks for gifts that guarantee a smile. 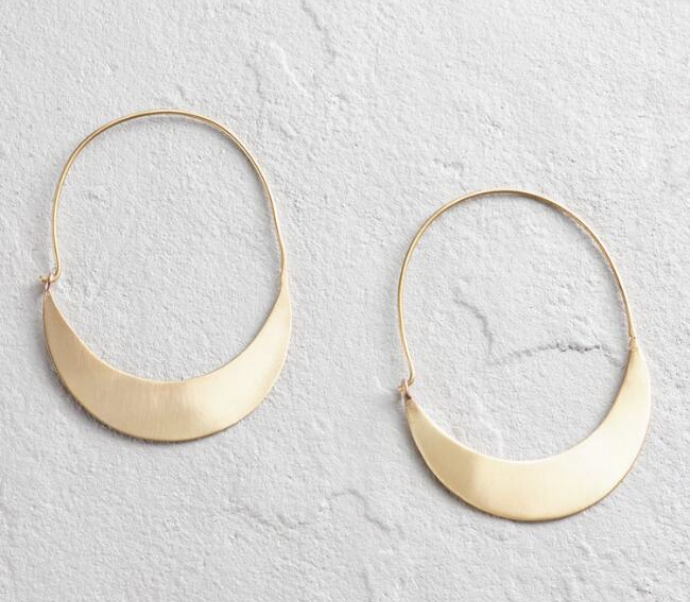 From jewelry to jammies, we’ve got you covered with this simple, easy-to-shop guide. Enjoy! 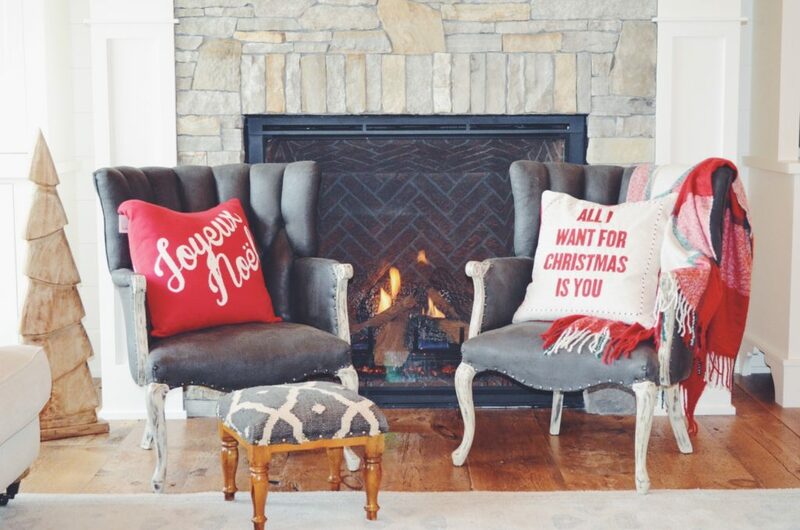 The holidays are a great time for making memories, while creating a warm and cozy atmosphere in your home. 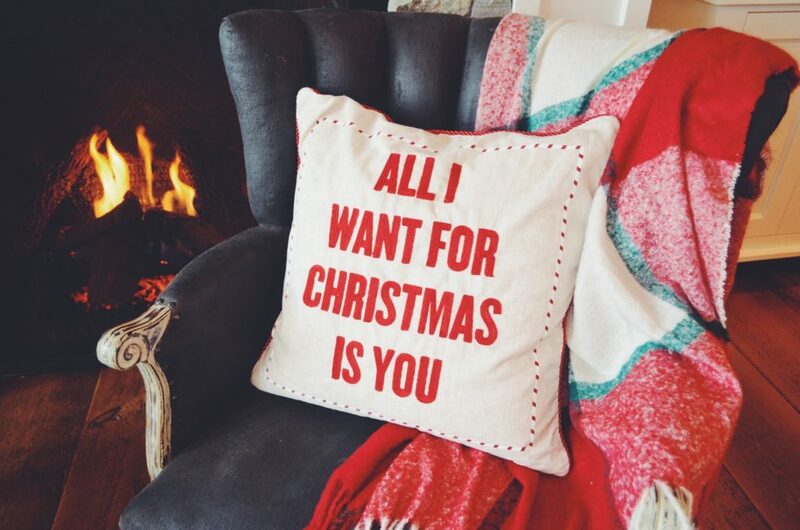 But let’s be honest, sometimes our old Christmas decor could use a modern update. Case in point: Christmas Villages. 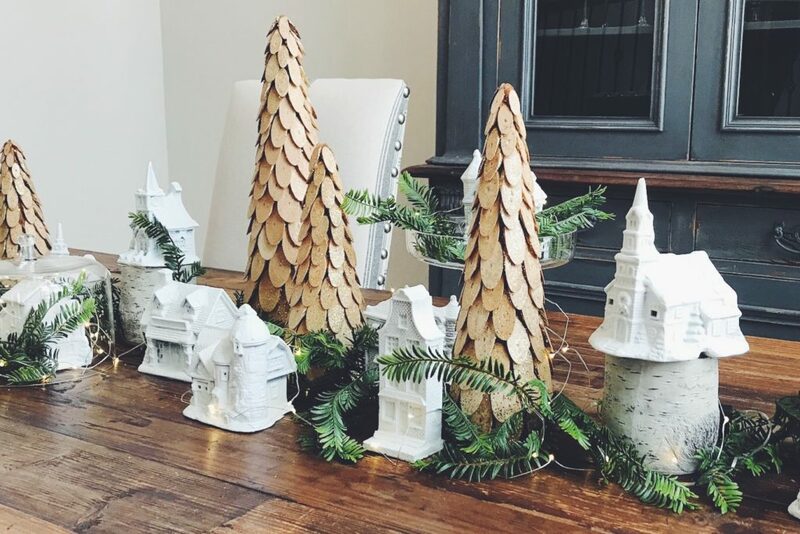 Porcelain Christmas Villages have been with us for decades! 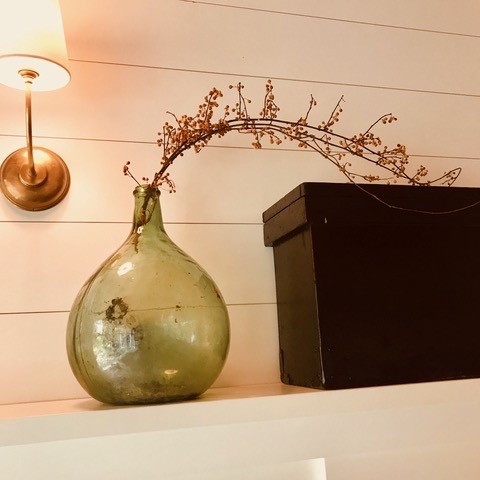 To some they hold cherished memories and to others they are outside of the realm of their décor aesthetic and are nothing more than a stored hand-me-down. Fear not my friends- whichever camp you fall into we have a fantastic way you can upscale this holiday staple and make it your own without making your mother mad! 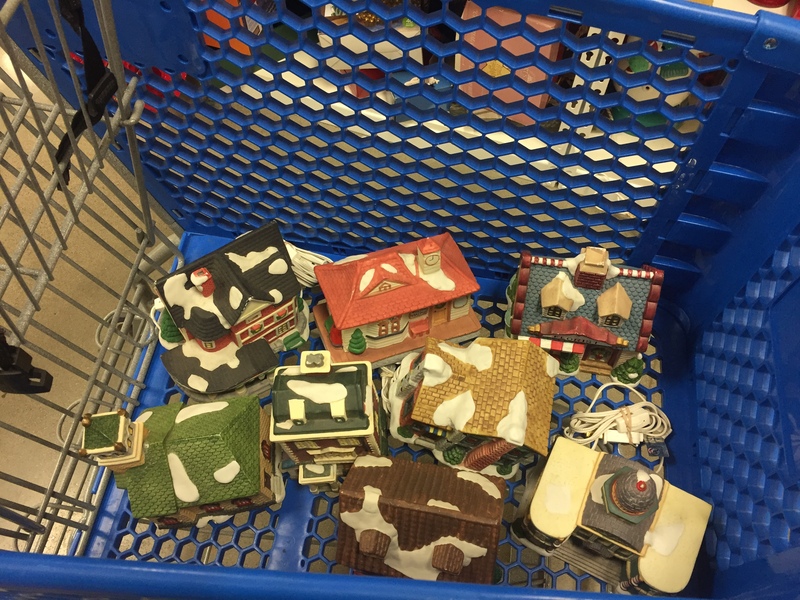 If you don’t happen to own a Christmas village, consider a quick trip to your local thrift store and peruse those shelves. In fact, we found these for 99 cents a piece! Score! Step #1- Use Primer- We picked up the brand “Kilz” in a can from Home Depot. DON’T SKIP THIS!! It is imperative to this transformation. This product is unlike other primers and bonds to non-porous surfaces like nobody’s business. Once this coat of Kilz has dried your village is ready to receive a coat of paint. Step #2- Chalk Paint- We used Rustoleum Chalk spray paint. This product leaves you with a beautiful matte, yet texture appreciative finish. Those of you who are familiar with chalk paint will fall in love with this product…. Two words: Spray. Paint. 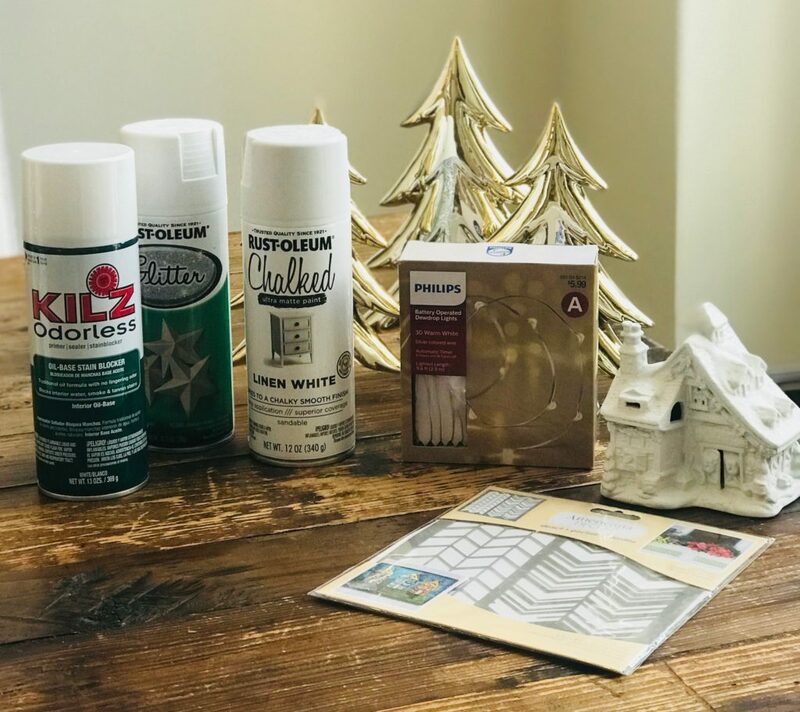 Step #3- Glitter Spray- This step is completely optional, but we used white Glitter spray paint on top of the dried chalk paint. We added this layer so the houses so we would have a little extra bling to catch the light, give some movement, and add a bit of whimsy. Step #4- Display- We gathered last year’s Christmas trees from Target (Fear not- they have these Willow Wood Trees this year! ). Then we collected sprigs of greenery and these battery-operated twinkle lights, also from Target. Another tip: grab your glass punch bowl/cake stand that you received as a wedding gift, and use it to create a beautiful vignette for your village. Talk about adding whimsy! It creates an ethereal, snowglobe-like effect. 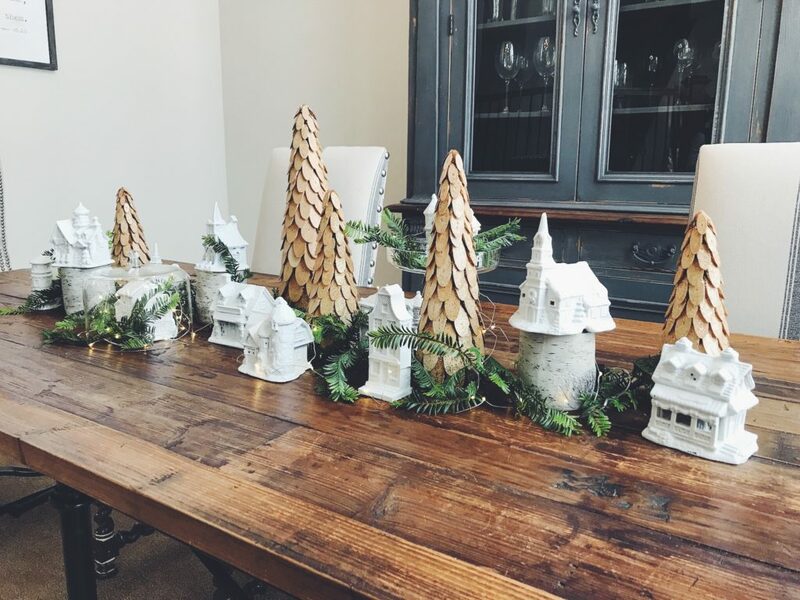 As you can see, this creates a stunning table scape and the best part about it is…it took a total of two hours, including shopping, painting and set up. PLUS, it was super cheap! Our costs came in under $100. You cannot get a custom Christmas village for that price, my friends. So, feel very, very free to take your own village and usher it in to the 21st century with these simple steps! We can’t guarantee your mother won’t be mad, but we assure you she’ll be in awe and you will feel like a Holiday BOSS! For more on this idea along with more great ideas to update tired decor, visit our Facebook page to watch our live video on #Holidayhacks. Men’s Skincare Gifts for the Holidays: As seen on Twin Cities Live! Every year, I have the hardest time figuring out what to get my husband. Anyone else feel the same way? You can only wrap so many weed whippers and tool sets, and let’s face it–they quickly start taking over valuable real estate in your garage and start to seemingly multiply when your back is turned. This year, as my husband and I have found ourselves in the solid 40-somethings club, we decided (okay, I decided) to start helping him take care of his skin. He has never really had a face washing routine, but this is his year! He’s gonna do it! With a teensy push from me, and the help of some great products, you too can have a husband with soft, younger looking skin. Here are my top 3 favorite skincare gifts that ANY man in your life will appreciate!! It’s no secret that we LOVE Paula’s Choice here at ShineUP Living. This brilliant line has created so many award-winning products, and we love them all! 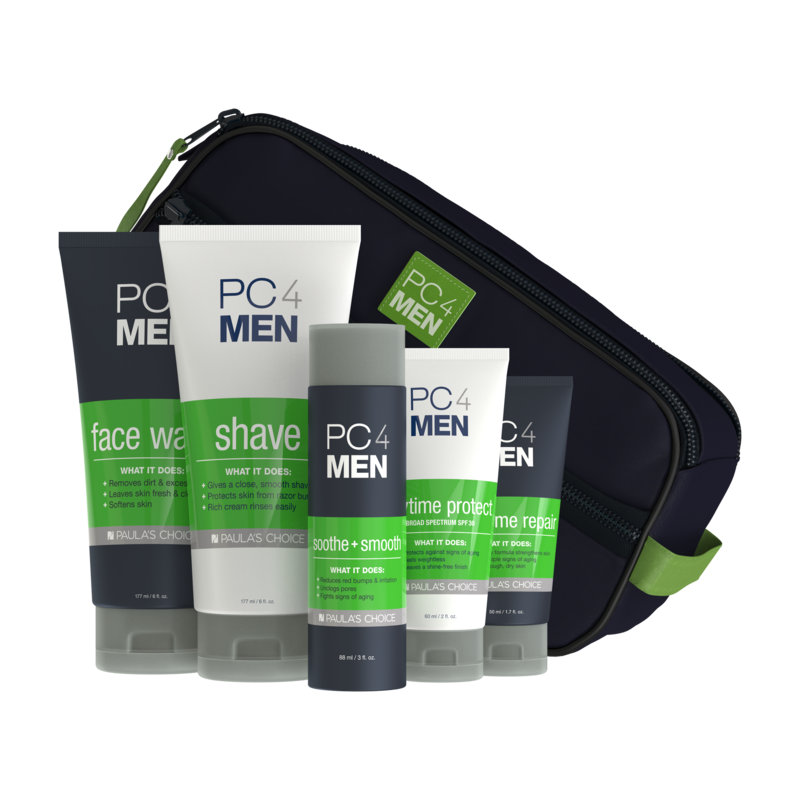 Their PC4MEN line is specifically formulated for men’s skin, addressing enlarged pores, dry skin, and moisture for after-shaving. My husband specifically loves the “soothe & smooth”–this gentle BHA exfoliant calms redness, minimizes pores, and soothes irritated skin. 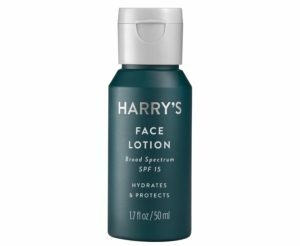 The daytime moisturizer has an SPF, which keeps his skin protected from the winter sun, while the nighttime moisture repairs cold-weather dryness. A perfect starter set! 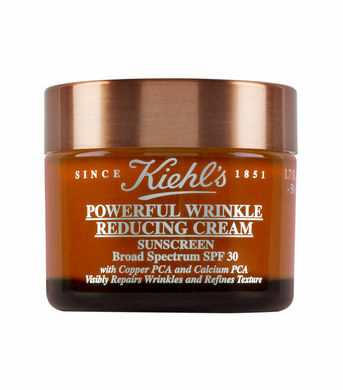 Let us shout it from the mountaintops: We LOVE Kiehl’s!!! Their men’s line delivers just as well as their women’s products, and this season, they’ve partnered with Disney to offer this festive, playful gift set for men. Playing on the fact that it’s Mickey’s 90th birthday (!!!) adds a little bit of fun to this set, and the products are AMAZing. The Energizing Scrub is our favorite over here—it leaves your man’s face clean, soft and smooth. Also have to mention their amazing Age Defender Eye Repair for Men: it works wonders on his tired puffy eyes, and moisturizes to reduce fine lines. A must-have product with visible results! If you want to take care of your man, but are on a limited budget, we’ve gotcha covered! 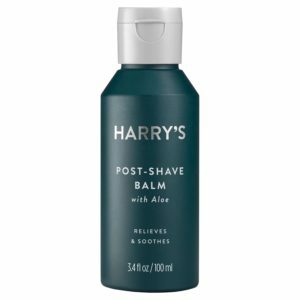 Target has really upped their men’s skincare game, and these products from Harry’s are some of our faves. 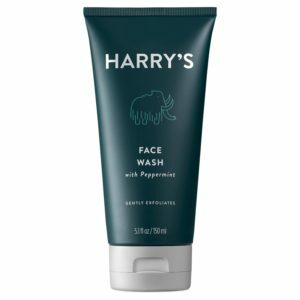 They use peppermint in the men’s cleanser to invigorate, and aloe in the after-shave to soothe. Great for a first-time introduction to men’s skin care, and works great as a last-minute stocking stuffer! It’s amazing how swiftly things transition from fall to Christmas. The Fall chill hits the air, the Thanksgiving leftovers are still in the fridge, and the next thing you know you’re buying Costco-sized packages of tape to wrap presents! Here at ShineUP, we love the Christmas season with all our hearts. This time of year is indeed a memory maker. Most of us have fond memories of Christmas traditions that still conjure up emotions and feelings associated with childhood innocence, when belief was easy, and everything was magical. Memories and imaginations are powerful and endearing and that’s precisely why Christmas decorating is genuinely worth the effort! 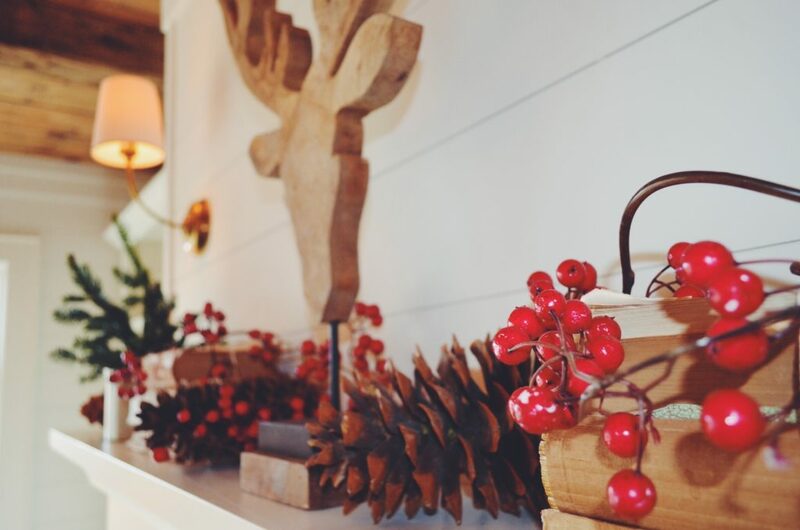 There’s a tremendous amount of freedom when it comes to sprucing the house up for this precious time of year. 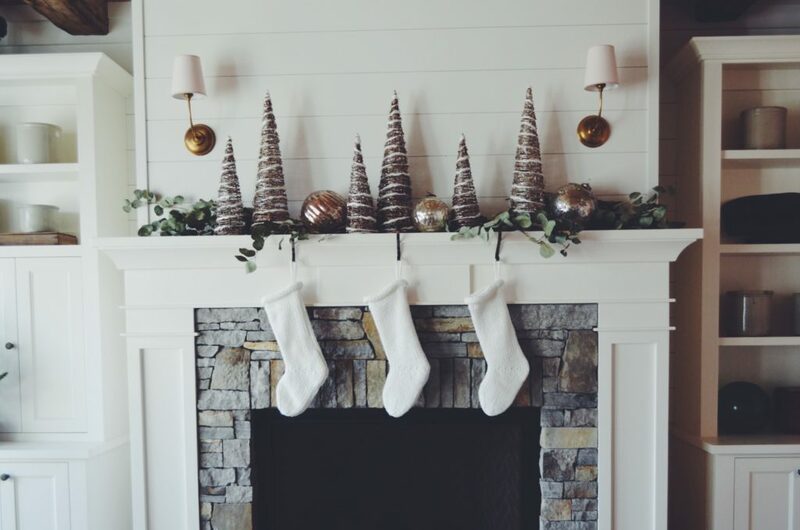 Today, we’re sharing THREE different ways to decorate your mantel for Christmas—do what feels right for you and your family! 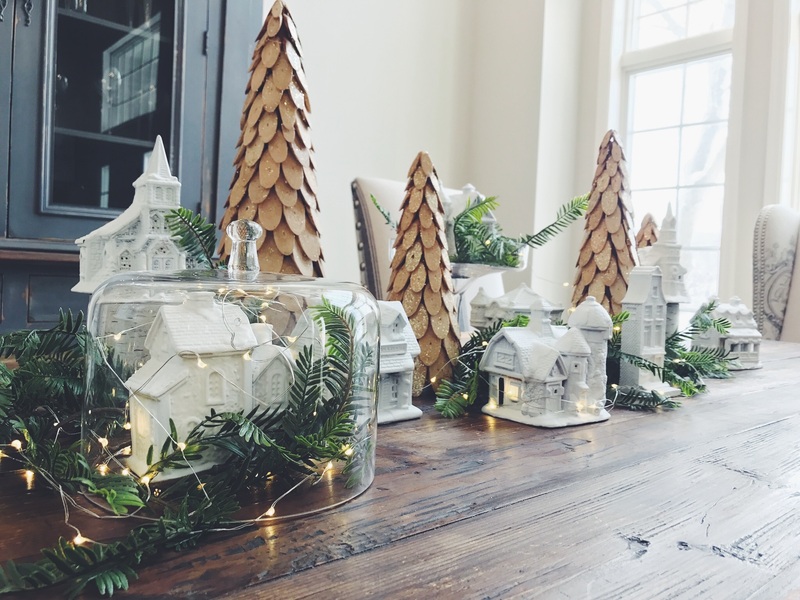 When thinking about Christmas decor style, we landed on three inspiration photos that capture the essence of the season. 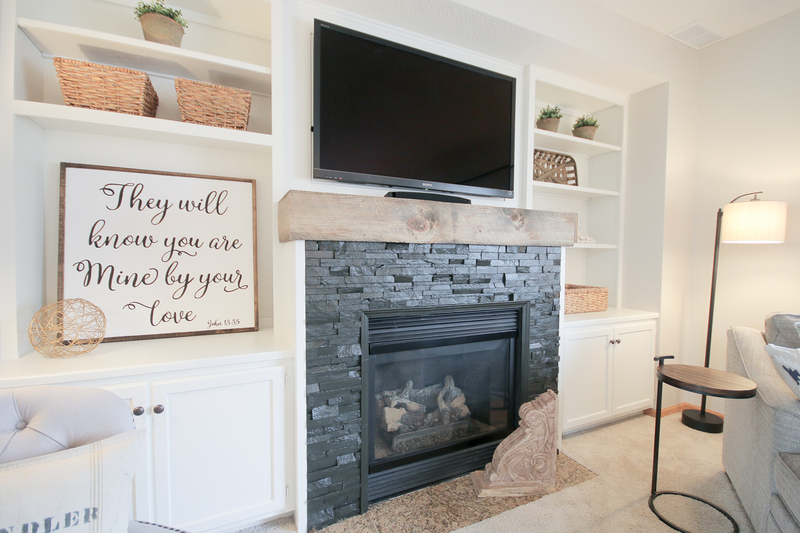 Then, we styled the mantels of our beloved team member, Jessie, to give you a few examples of our take on the styles! 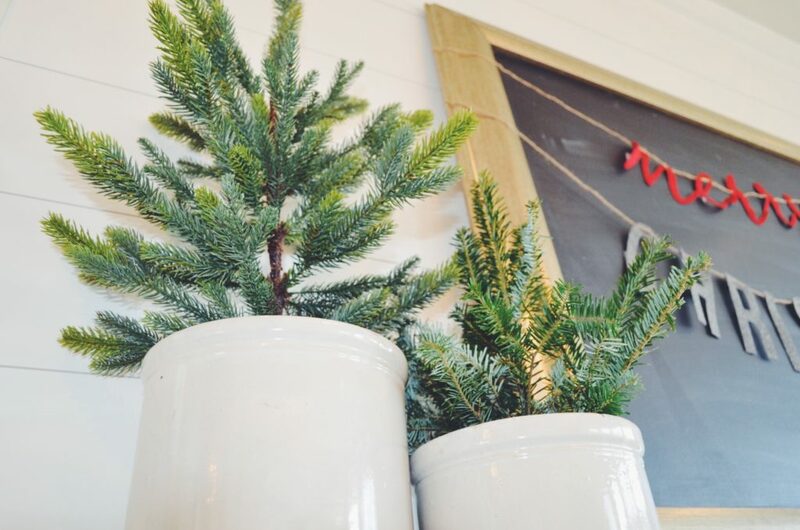 This simple, natural vibe translates Christmas just fine. The use of natural elements and simplicity can read both modern and transitional, but above all, easy elegance. 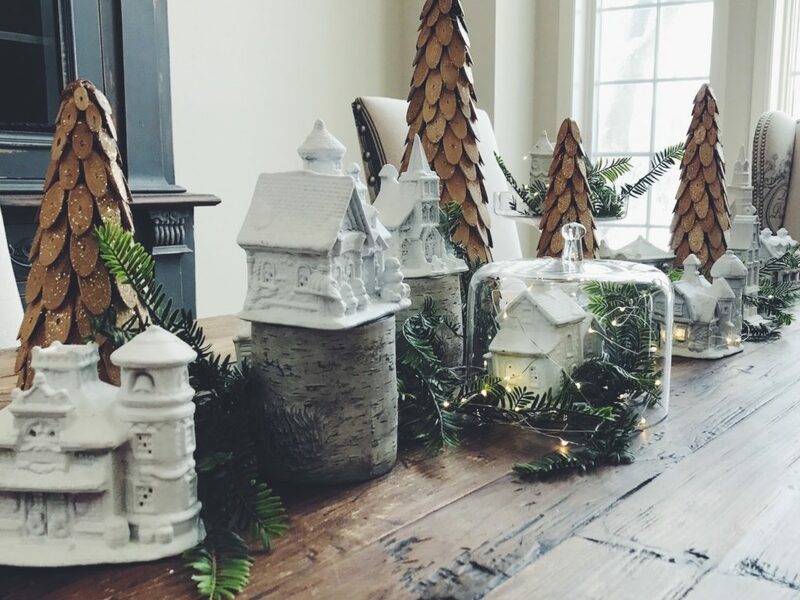 Sometimes, less is more, especially with Christmas decor. 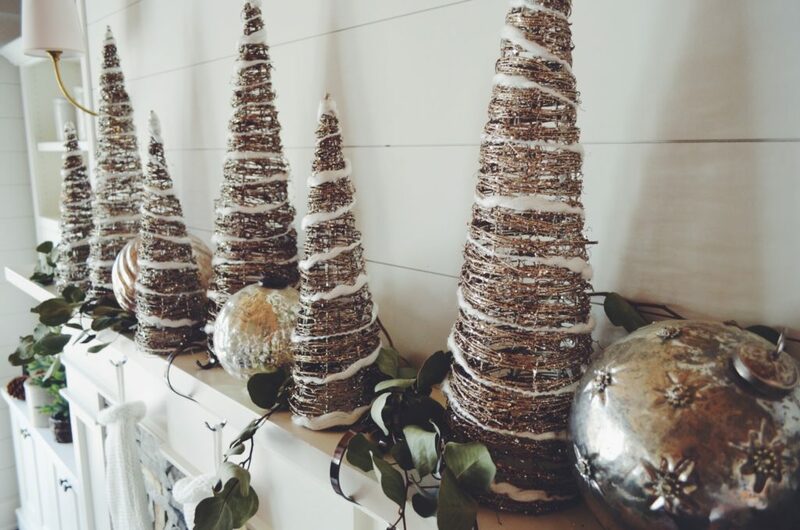 Here we used these natural vine, light up trees from World Market, along with some real eucalyptus branches and oversized mercury ornaments from Jessie’s own collection. 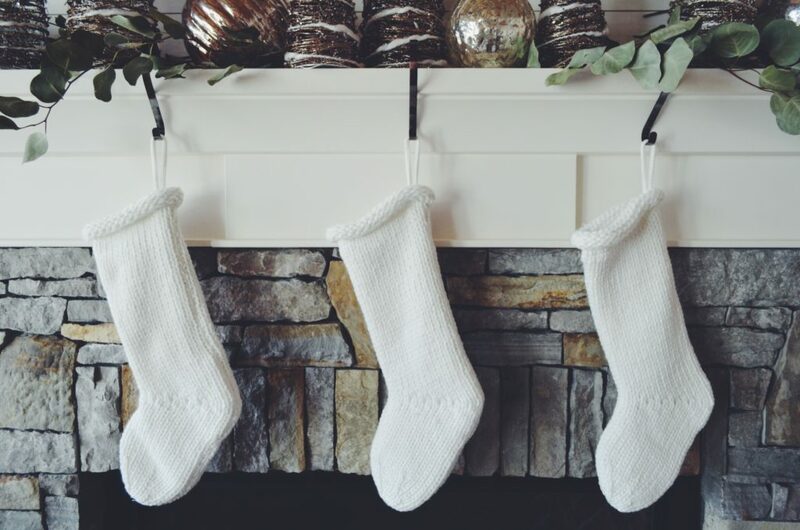 These chunky knit, white stockings from Target are elegant and affordable at just $13 each! Love, love, love how the white pops off of all the natural elements. The brushed nickel stocking hooks are also from Target. 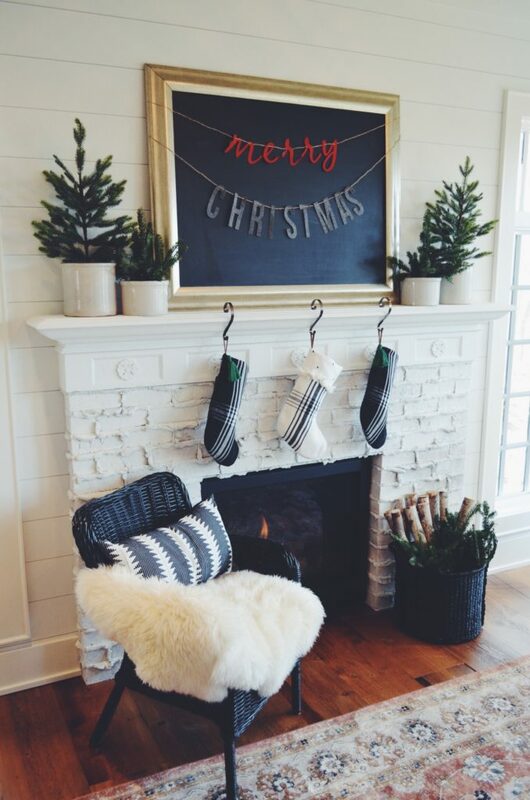 We’re total suckers for black and white mantels. Crisp, clean, and fresh. 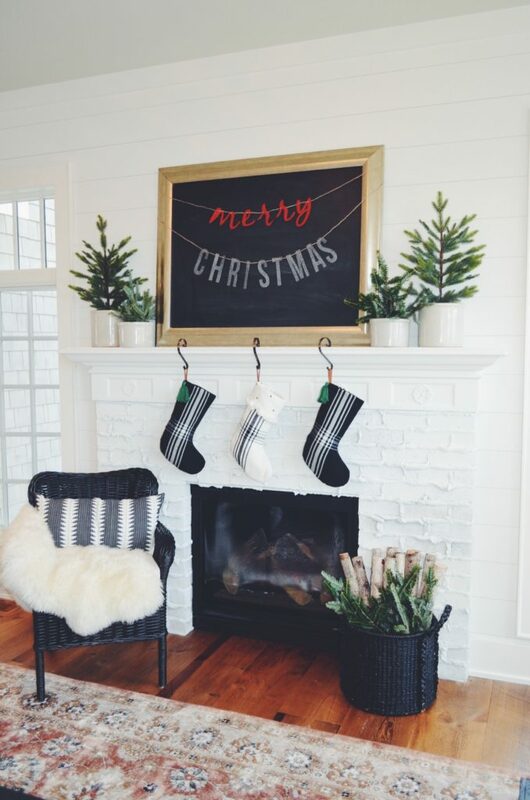 When the holidays are over, replace the “Merry Christmas” with a simple, winter saying, and remove the stockings and countdown to Christmas sign, and voila! You’re ready for the rest of winter. Magnolia’s Hearth & Hand line is going strong at Target, and we could not be happier!! 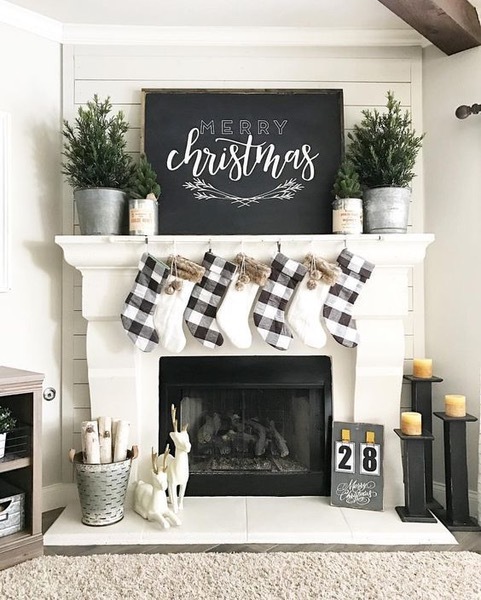 These plaid stockings give off a crisp, classic vibe, and the hooks from Target work in any decor scheme. We also added these cute trees, again from Target Threshold, and popped them into vintage crocks. 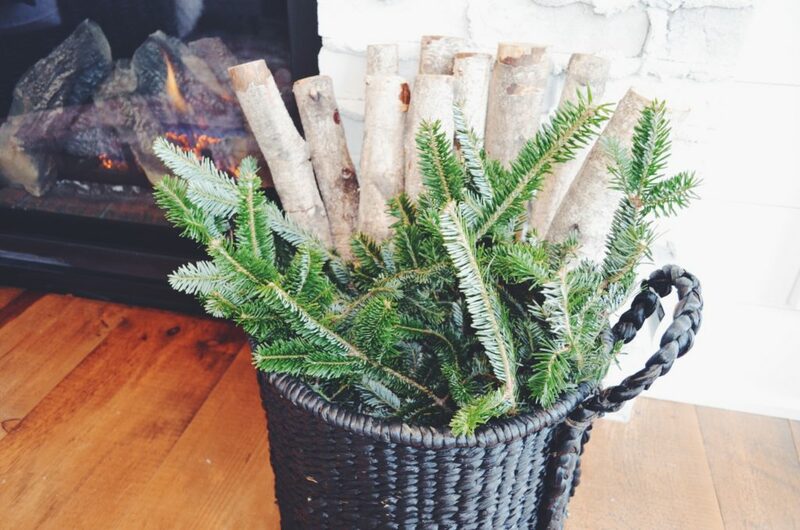 Adding birch wood and spruce tips from our local market to this black, woven basket from Target lends a casual vibe. 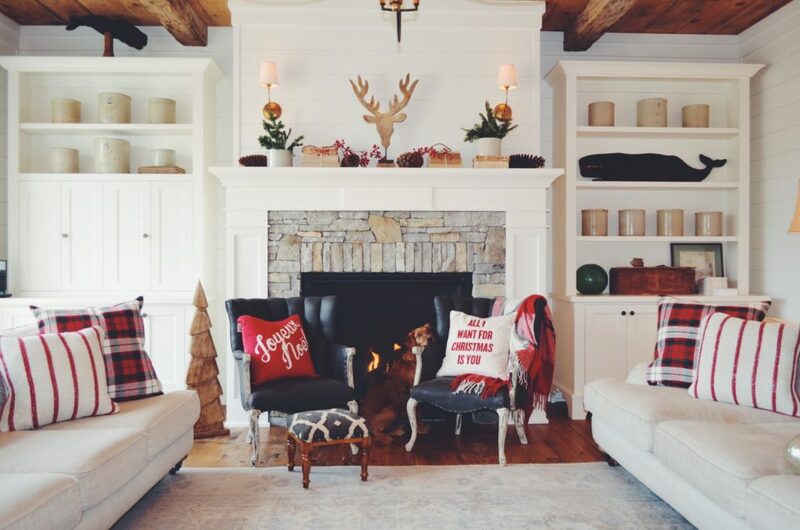 For those of us inclined towards traditional decor, red is always right, and it can be your default, no matter what color scheme you have going on in your home! 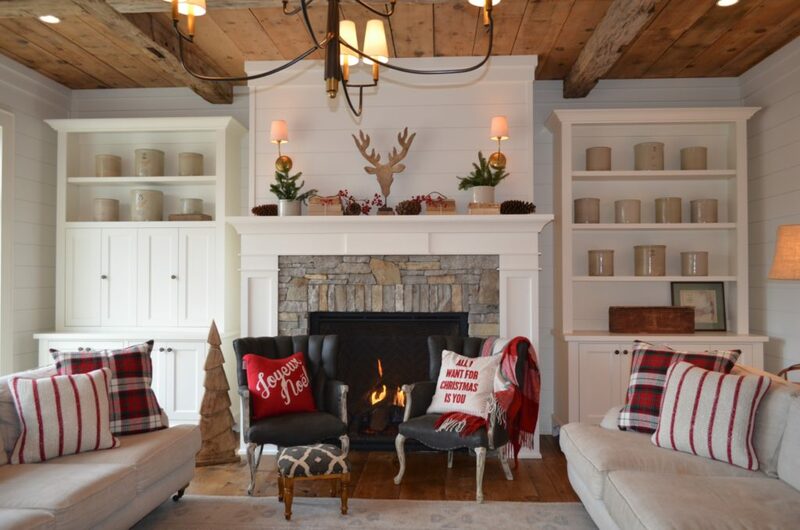 Red speaks to the tradition of the season, and infusing your space with red is always a win, when done right. This last look was sourced primarily from one of our favorite stores: HomeGoods. It’s amazing how infusing a neutral space with color really livens things up! Don’t be afraid to mix patterns!! There you have it, friends! 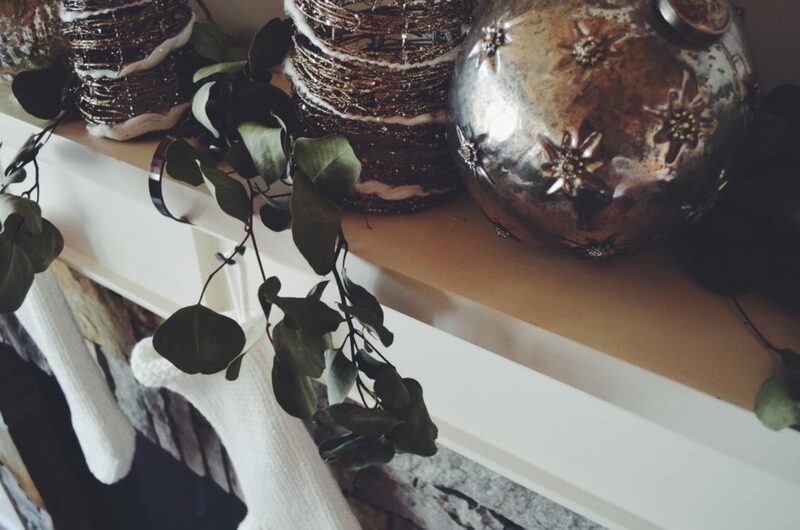 Three easy ways to style your mantel, and indeed, your whole home, for the holidays. Hoping you’re enjoying the beginnings of the season! We’ve all heard it before… “there’s no place like home,” but never before has it held such meaning since we met these two beauties. 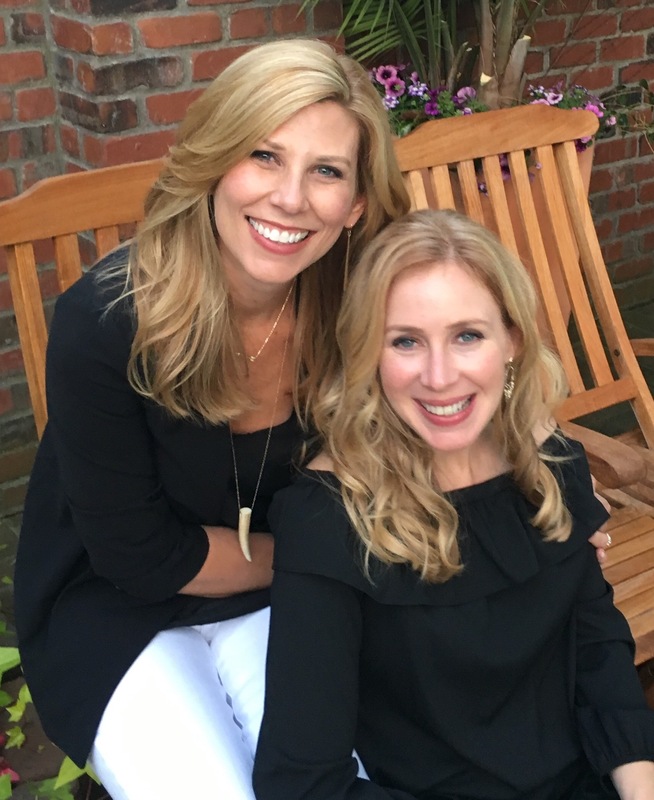 When we first heard of Kelly and her 12 year old daughter Kendall, they were in the hospital. In fact, they were in the intensive care unit at Children’s Hospital. Kendall’s health was failing and she needed several surgeries to correct problems with her heart and lungs. As a way to stay positive, they would talk of going home. 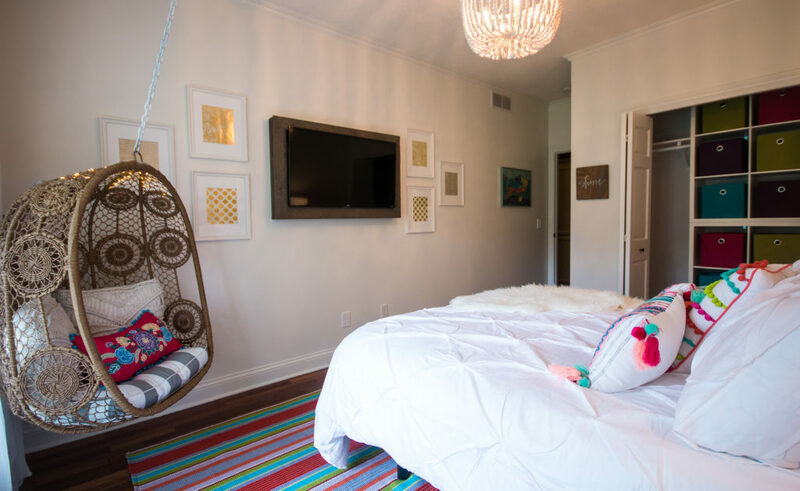 Yet, they needed to create a new room for Kendall so that she could be close to mom and dad. That’s where our ShineUP makeover crew jumped in to help! Watch the full episode of Kelly’s ShineUP makeover story here. Now, to the design details! White. Oh yes we did. We used it…in a kiddo’s bedroom…everywhere! First things first: do not be afraid of whites with children in mind!!! Buy washable, durable fabric and paint with a sheen that can easily be washed. And away you go! 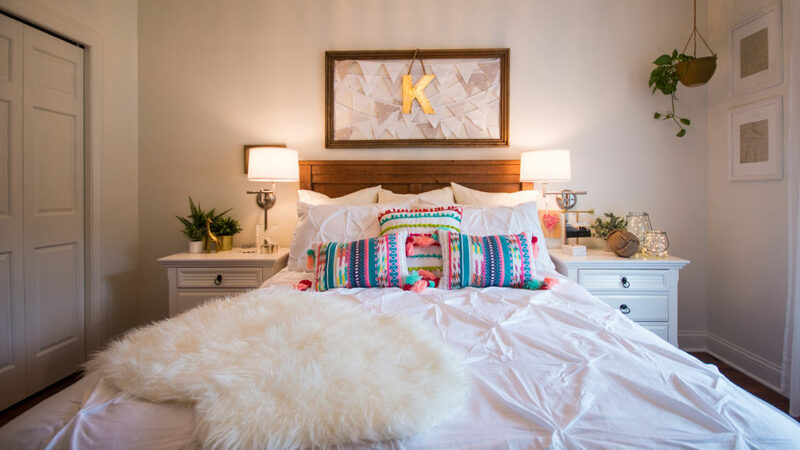 Kendall’s mom requested a beautiful space for her daughter, but also one that would transition well to a guest bedroom once her health was more stable and she could return to her original bedroom downstairs. The use of a white palette packed with punches of color through decor will make that transition an absolute cinch! We also selected a colorful rug by Dash and Albert that is indoor/outdoor and requires none other than a hose to clean it. 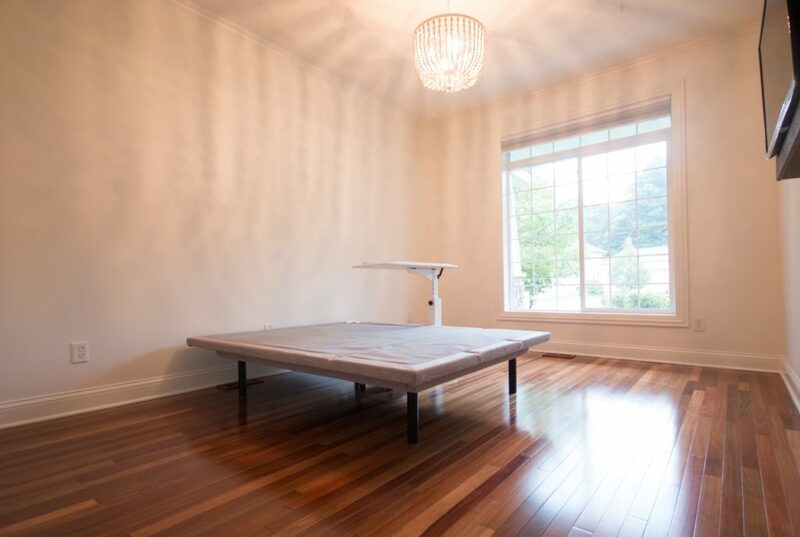 That is thoughtful durability with a built in pretty factor for a child’s bedroom. Since Kendall is going to be spending lots of time in her room as she heals, Kelly requested a television in the room. 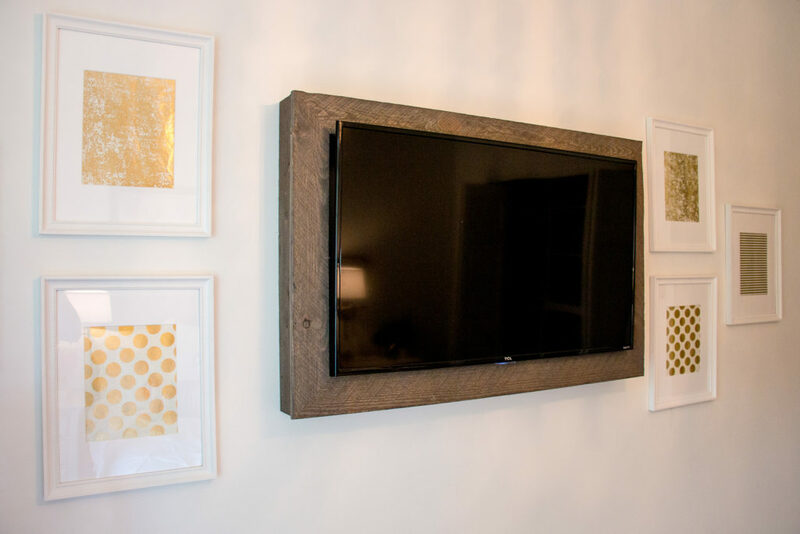 Since televisions aren’t always the most attractive accessory, we framed this one in faux barnwood from Home Depot. To give the room some sparkle, we added twinkle lights and gold accessories. 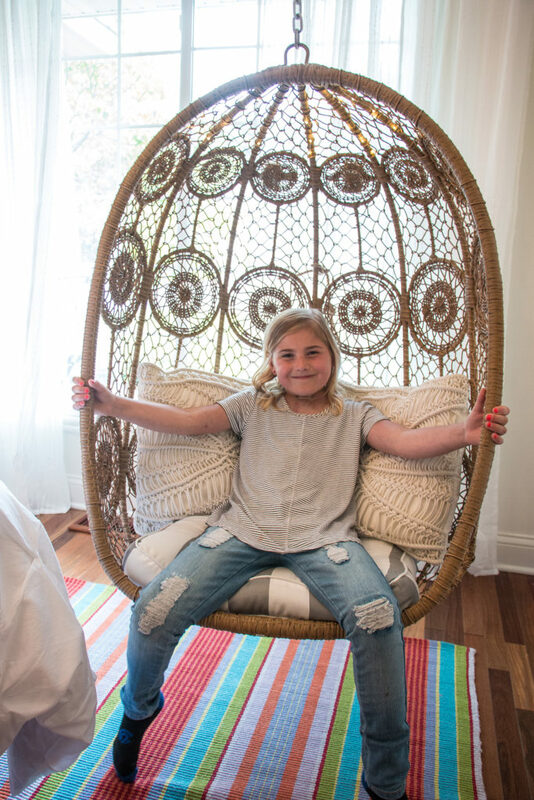 For our biggest surprise, we added a swinging chair! 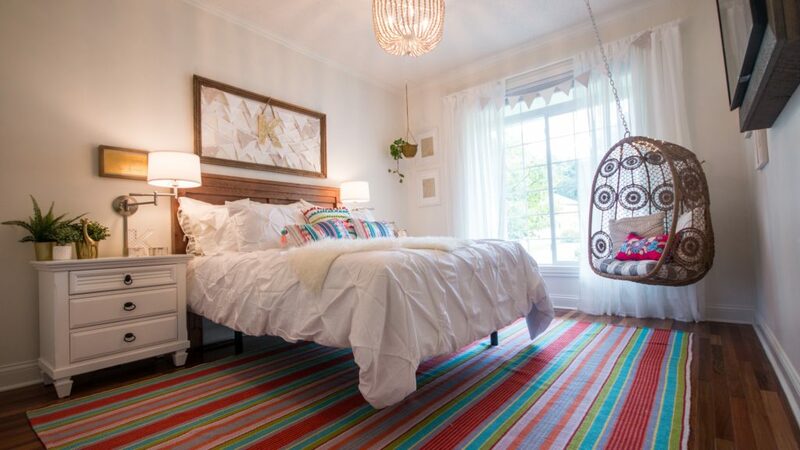 Kendall had always dreamed of having a swing in her room. Judging by this smile, we think it was a success. A neighbor of Kelly’s sewed us these sweet pendant flags. In an effort to think outside the box, we decided to hang them in an antique frame and swag them over the curtain rod. It created a whimsical touch. We used intentional neutrals with deliberately placed punches of color for what turned out to be one of our favorite interior design overhauls yet! Kelly and Kendall, you’ve captured our hearts. 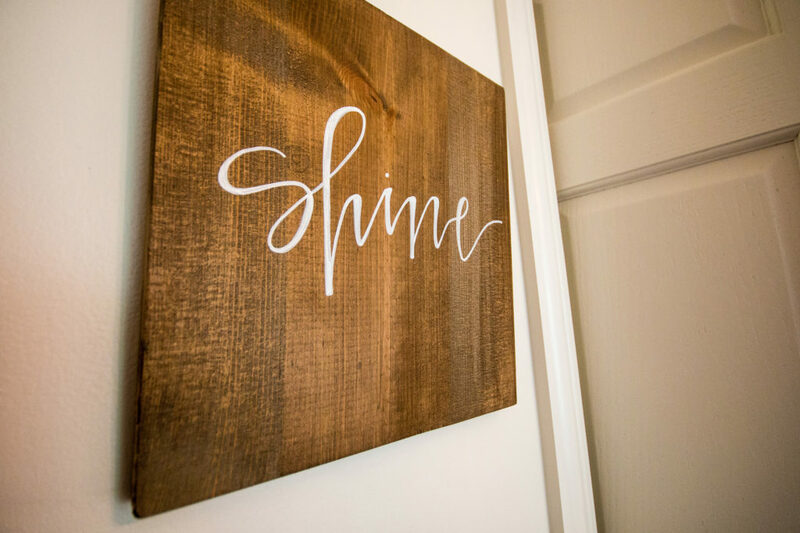 We’re honored to give you the design of your dreams along with a beautiful room to heal and of course…SHINE. 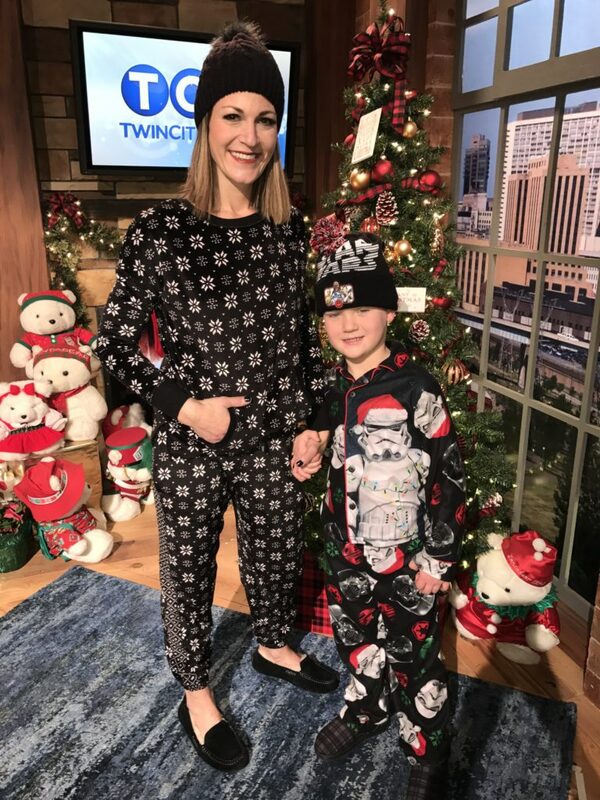 Sweater Season: Our Best Picks, as seen on Twin Cities Live! Although we’re always a little sad to see summer go, there is something that’s really appealing about cooler temperatures. For us, it’s sweater season! Who’s with us? 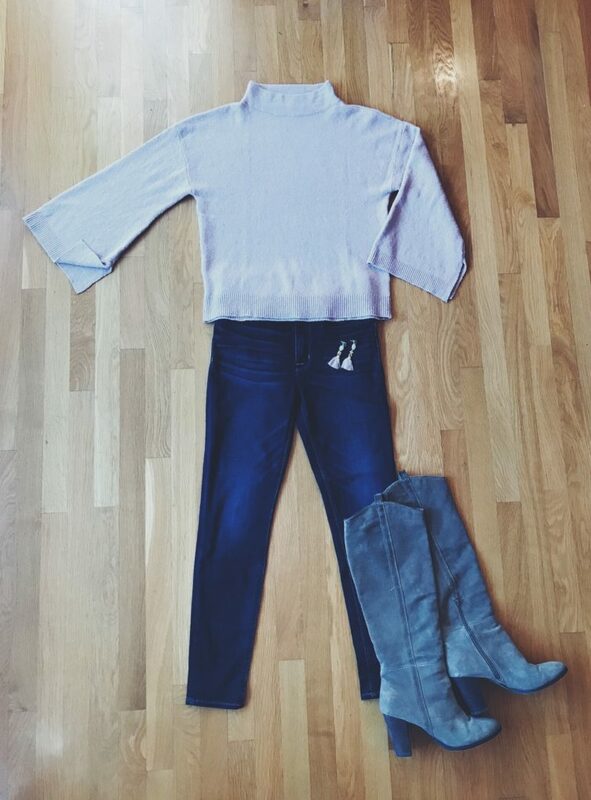 Our favorite outfits usually involve an oversized cardigan, a graphic tee, a great pair of denim and boots. That’s just how we roll. It’s effortless, chic, and oh so comfy. If you’re ready to step up your sweater game, get ready! We’ve scoured the shops to find the best picks for sweater season. Let’s start with soft and cozy. This Target Chenille Open Cardigan sweater is EVERYTHING! Ultra soft, oversized and at $29.99, very affordable. The neutral color and lush texture are yummy! What can we say? We’re in love! 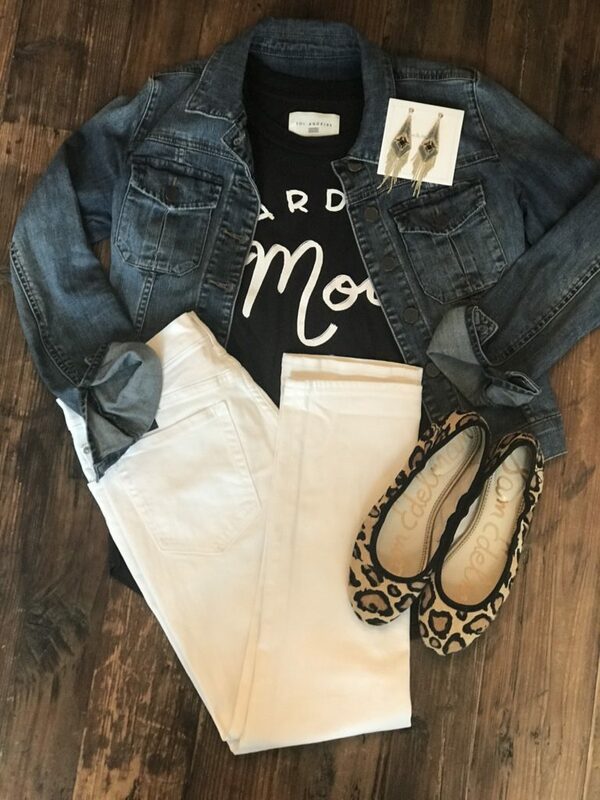 Here, we are pairing it with a fun, graphic tee (also from Target), statement earrings , black booties and this great pair of coated denim from Evereve. This next pick screams easy elegance. 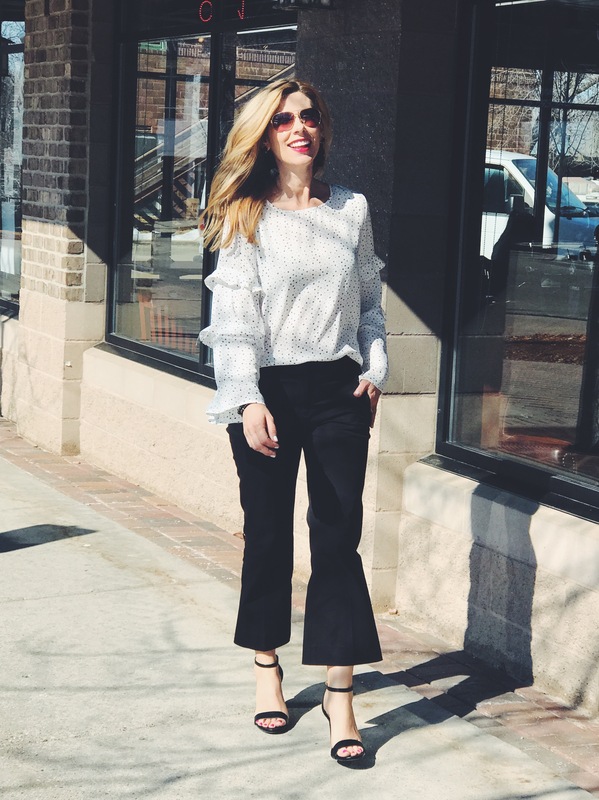 This season it’s all about the sleeve and this Nordstrom BP Dolman Sleeve Sweater has just the right amount of drama. We also love the color, blush pink, which is one of the hottest hues this season. If you’re not into pink, not to worry. It also comes in a dark gray and black. 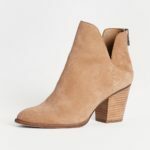 We’re pairing it with the Barbara High Rise by Hudson ankle skinny jeans, knee high boots (last season, similar ) and some fun statement earrings. For those days when you need to get up and get out the door, this is your sweater! It’s a great throw on option that requires very little styling effort. Just add denim and a scarf and you are ready to launch into your day with flair. It’s the Evereve Allison Joy Tie Front Sweater and it’s kind of like a dressed up sweatshirt. It’s also great for layering under a vest or jacket. The tie front waist is super flattering on all body types. It blouses out in the middle and what mom doesn’t love that? We’re pairing it with a blanket scarf (similar) , distressed jeans( similar ) and the Lucky Lotisha Booties. 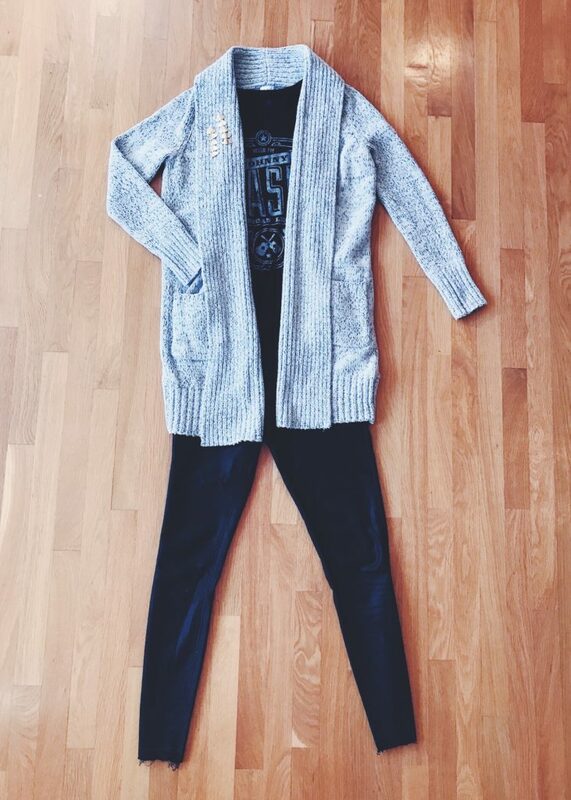 Last but not least is this sweater from one of our favorite, new brands! If you’ve never heard of “Cupcakes and Cashmere“, you need to know about this clothing line. Recently founded by fashion blogger, Emily Schuman, this brand is all about aspirational yet attainable style. We discovered her pieces at one of our favorite local boutiques, Willa June. 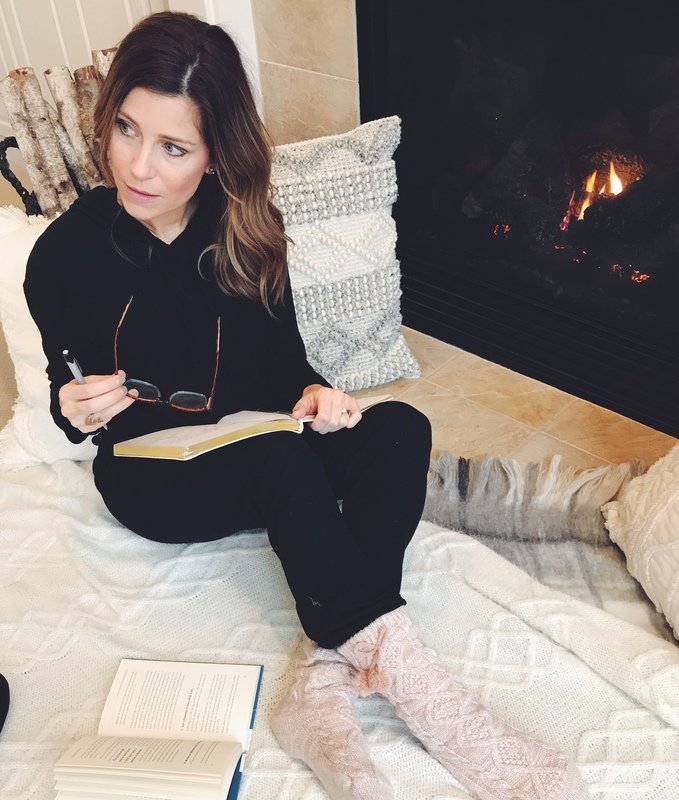 Trust us, we drool over just about every option we see, including this Randy Turtleneck Sweater that sold out at Willa June, but is now on MAJOR sale at Nordstrom! We’re pairing it with black denim, drop earrings and leopard pumps ( similar ). There you have it, friends! Our best pics to kickoff a cozy sweater season. Cheers! 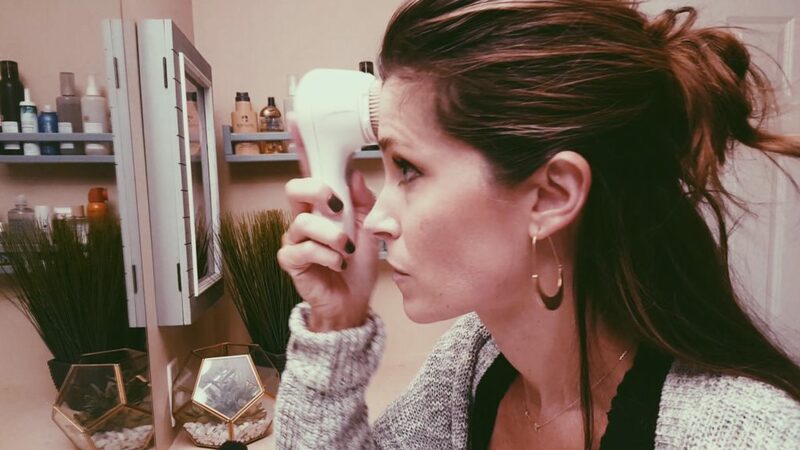 Winter Skincare: As seen on Twin Cities Live! As the temperatures drop, we need to kick things up a notch in the skincare department! This time of year, the air is so dry, so we need to adjust our routines so that we don’t end up with tight, dry skin on our face. Here are a few simple ways I combat the winter skin blues. As we age, our skin cells don’t turn over as rapidly as they used to, and we need to help it along to keep our skin looking smooth and fresh. 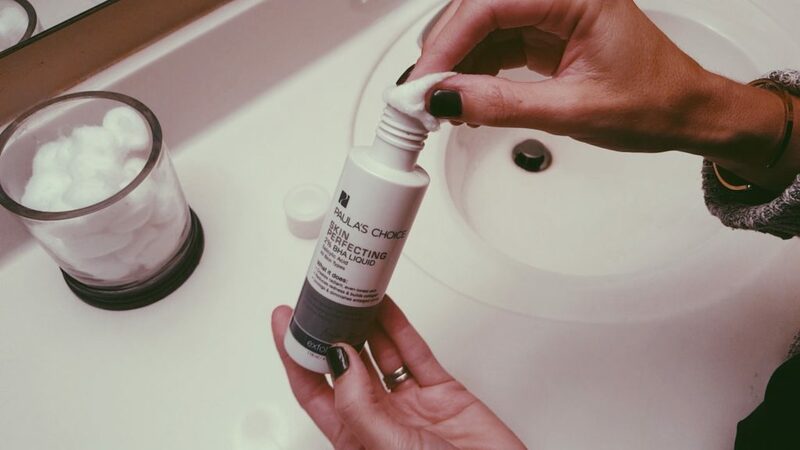 This liquid Exfoliant by PC (Paula’s Choice 2% BHA Liquid Exfoliant is my number one skincare product that I cannot live without. It literally takes a layer of skin off your face, and it leaves it feeling baby soft and silky. No stinging, no harsh drying, just gentle exfoliation, resulting in healthy, glowing skin. This product is great for all skin types, and it is seriously like a mini-facial in a bottle, at a fraction of the cost! Tip #3 – Moisturize, including your lips!! Our lips are often the most under-cared for part of our face. And you know, when our lips are dry, we don’t have a good foundation for our lipstick and gloss! I cannot recommend this lip mask by Laniege highly enough. I don’t know about you, but my lips can be so dry in the morning. You apply this lip mask at night, and it works while you sleep to reveal softer, more supple lips in the morning. Plus, it smells amazing! First, start with a 20-minute bath soak: this relieves tension, and it does amazing things for your mental health–PLUS it prepares your skin for moisture. I love AHAVA Dead Sea Mineral Bath Salts with Muscle soothing Eucalyptus: Mineral salts are THE best way to treat yourself…this bath salt is infused with Eucalyptus and it is an AWESOME destresser. Eucalyptus is known for it’s relaxing properties, actually proven to relax muscles and release tension. Next, while you’re still in the tub, exfoliate your body with Herbivore Coco Rose Body Polish– My favorite way to wash the cares of the day away…relax in the tub and use this body polish to slough off the stress of the day. Coconut oil has been used for centuries in many cultures as a beauty balm, and of course, now we’re seeing a massive influx of coconut-oil inspired products—and for good reason! The natural anti-oxidants in coconut oil are great for our skin, and the moisturizing properties are gentle and effective. Well, it’s official: the leaves are off the trees, summer flip-flops are tucked away in bins, and fireplaces are being flicked on. It’s fall, ya’ll! Time for boots, coats, sweaters, and scarves. 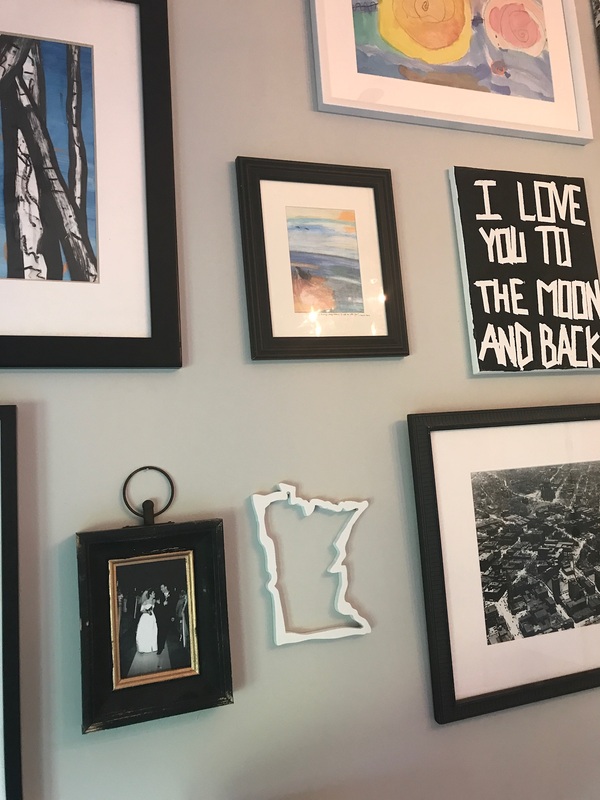 We LOVE fall around these parts…here in Minnesota, we experience seasonal change in a HUGE way, as evidenced by the 80-degree heat last week, and the 30-degree snowstorm today! When the temperature drops, we love finding new favorite pretties to share. 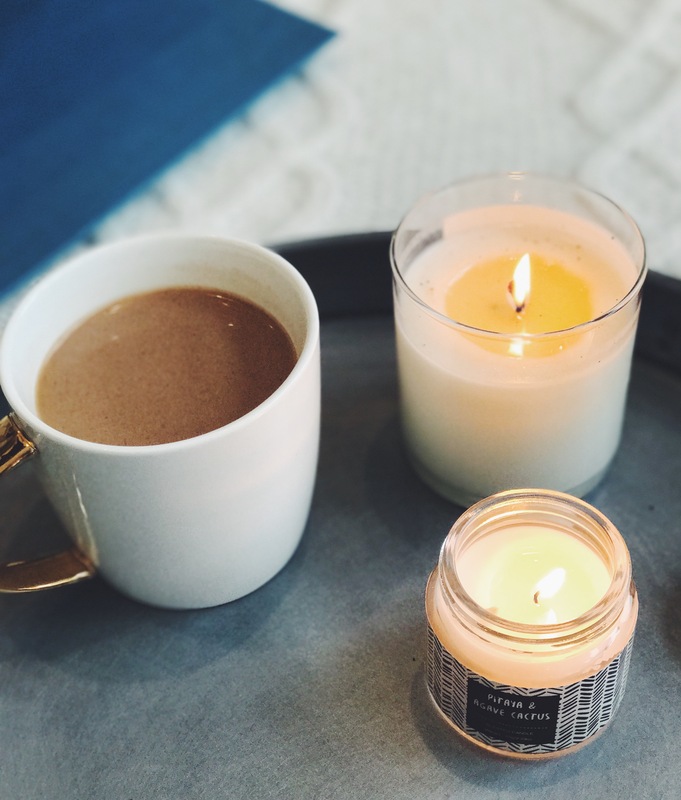 From cozy sweaters to shimmering candles, we’ve got what you need to stay warm and beautiful this fall. For more of our fall favorites, visit the Shop our Favorites page, or catch us LIVE today on ShineUP LIVE on gravylive.com at 11amCST. We’ll have a fun giveaway, and we’re showing you many of our favorite picks below for fall! For now, enjoy this sneak peek of a few of our favorite things. Our fun surprise find this fall, this sweet sweater with a ruffle hem will become a sure favorite. It’s so cute, and under $35! From our FAVORITE t-shirt shop, SuperLoveTees, this one needs no explanation. The perfect graphic to layer under a cardigan, denim jacket, or even a casual black blazer. If you only buy one graphic tee–make it this one. The cute knot in the front of this sweater says “effortless” while the cozy fabric will keep you toasty this fall. 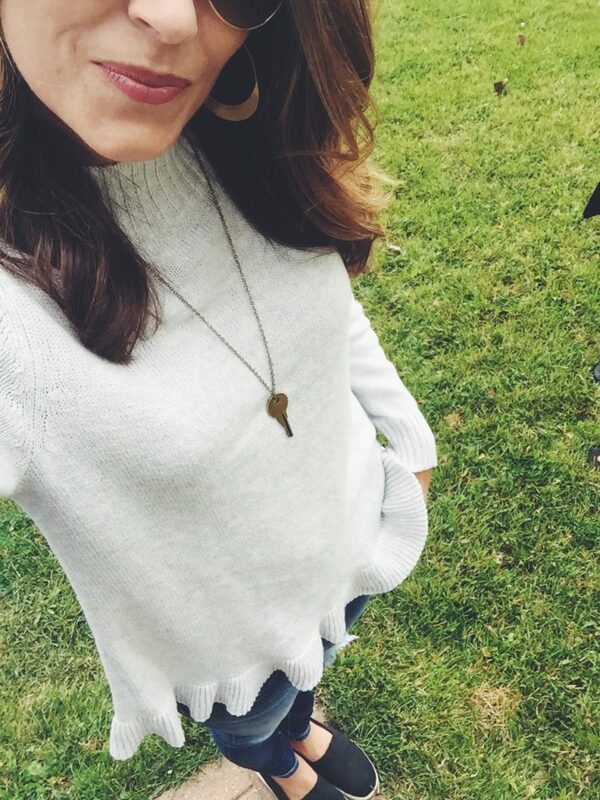 An easy sweater to love! 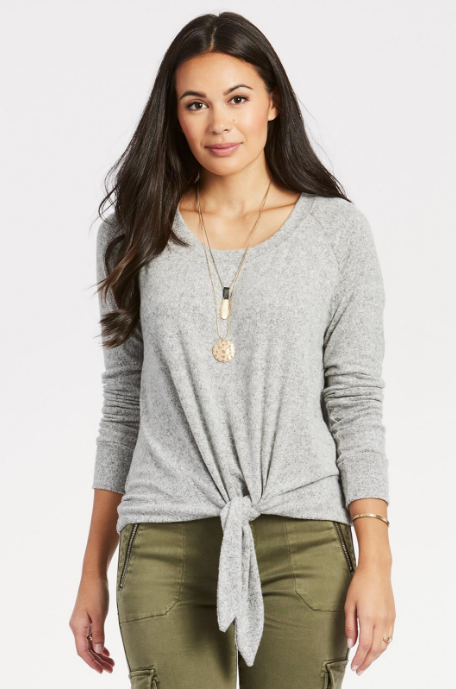 We love the easy pullover style of this slate grey dolman sleeve sweater from Nordstrom. 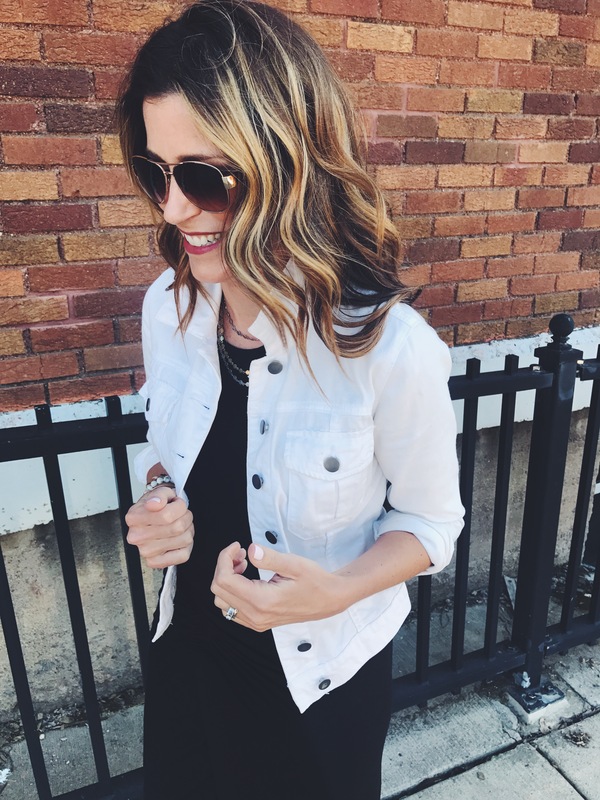 Such a great option to throw on when you don’t feel like thinking about layering, this is one you’ll reach for over and over again. 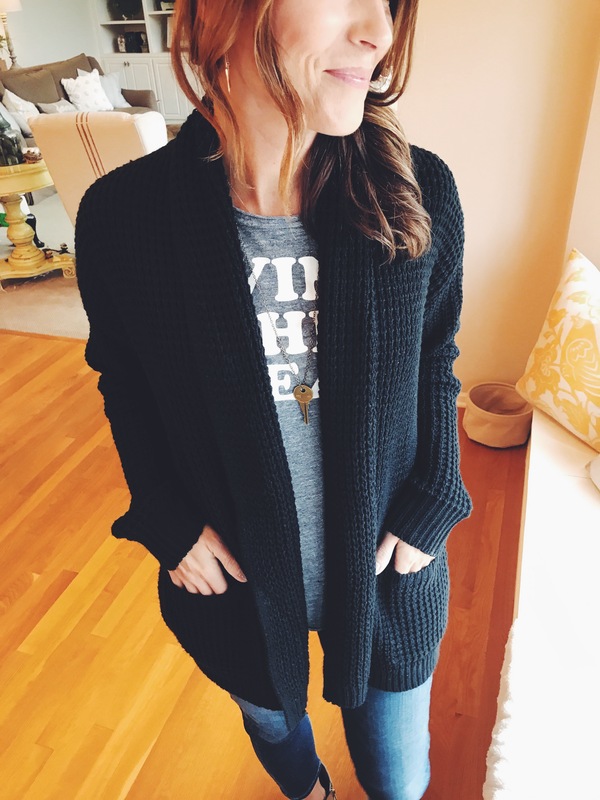 Say hello to your new favorite cardigan! The texture, the coziness, the pricepoint! Run, don’t walk, to your nearest Target and snag this baby before it sells out. 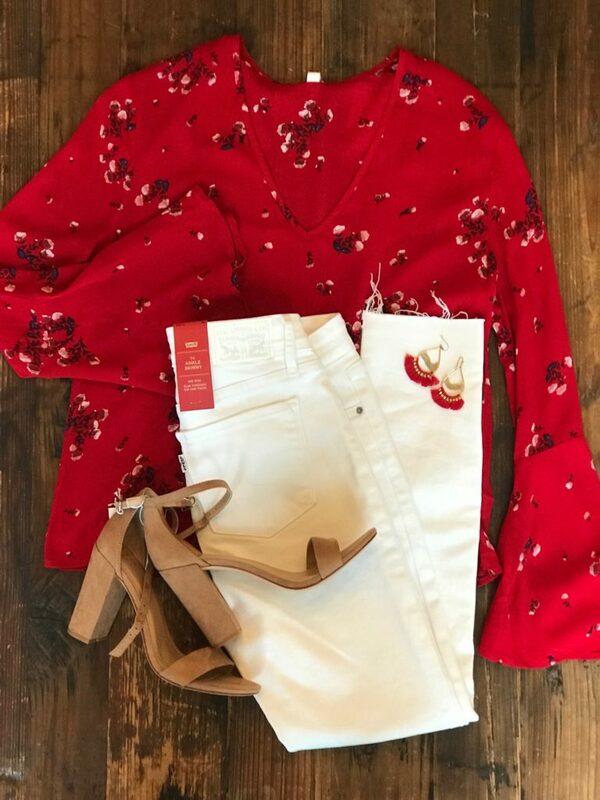 Cute, comfortable, and chic, we love this split ankle denim from Vici, one of our favorite go-to fashion brands. Tip: they run big, so size down! These leggings are awesome! They keep you all tucked in with a high waist and with a smooth material that keeps shirts from bunching up. The material may be a bit thick for a workout, but we love them as a pant for everyday activities. A bit of an investment, but well worth it–you’ll have these leggings on repeat! Leopard print is a neutral! 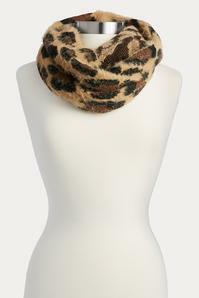 And this scarf will be a go to. It’s soooo soft, keeping you warm this Fall. 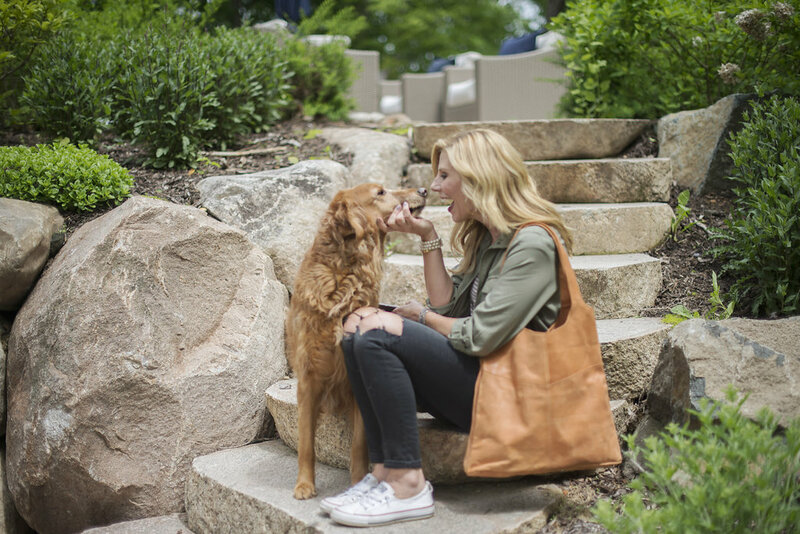 We have a secret to share…these adorable sneakers are from Dr. Scholl’s!! The comfort is unbelievable, and at under $50, the price is just right. 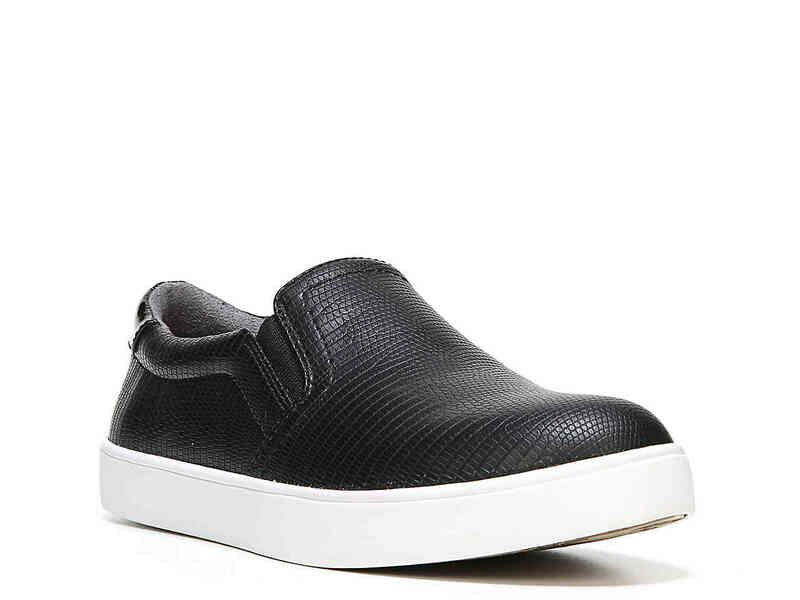 These will be your go-to, everyday kicks, and the snakeskin texture adds a bit of edge. 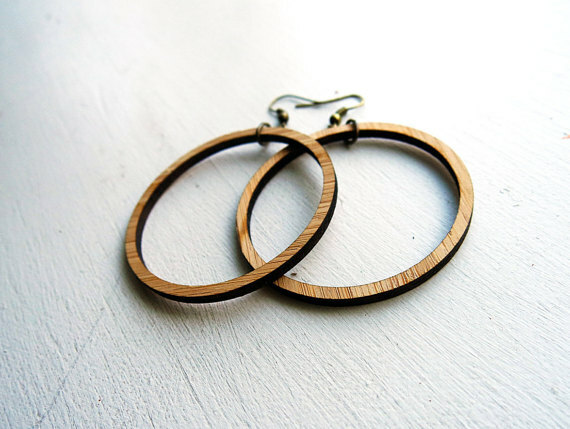 These earrings, inspired by the delightful Joanna Gaines, are just gorgeous, and a great departure from traditional metals. Find them here on etsy. 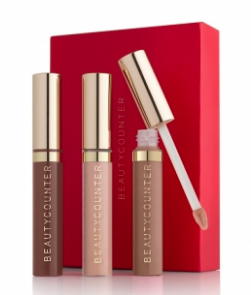 We’re crazy over this lipgloss trio from Beautycounter! All 3 shades are perfectly formulated with a fresh peppermint flavor that we love. This is part of their holiday gift sets, but we couldn’t wait to share it with you. A beauty must-have! 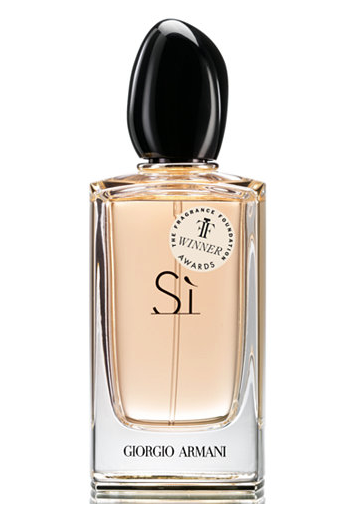 An award-winning fragrance, we seriously cannot.get.enough of this perfume. Woodsy, alluring, and totally addictive, this fragrance is everything we want in a fall scent. You will LOVE it. When the temperature drops, so does the moisture in our skin. Use this double-duty moisturizer for a healthy dose of wrinkle reduction and intense moisture. Let’s face it: the holidays are coming, and we could all use a little stress relief! 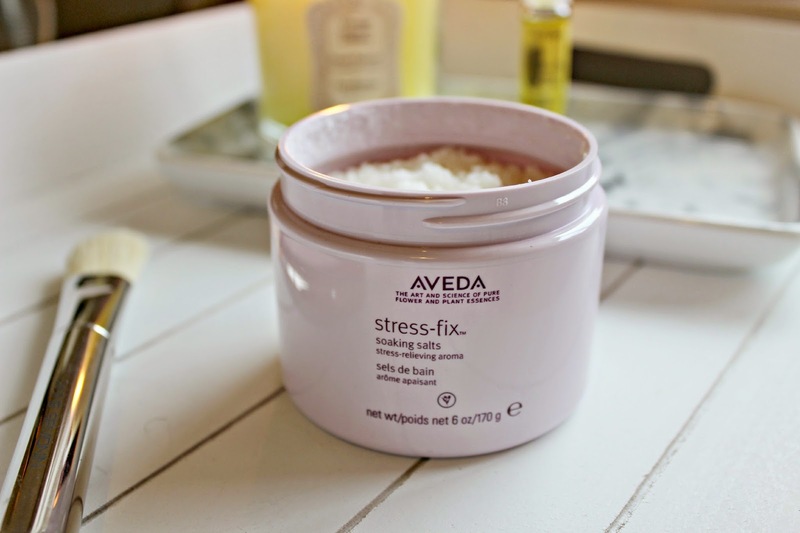 We adore the stress-fix line from Aveda; fragranced with lavender, lavandin, and clary sage, it’s perfect for an end-of-the-day self-care solution. Our favorite? The soaking salts. Who couldn’t use a little more glow in their lives? 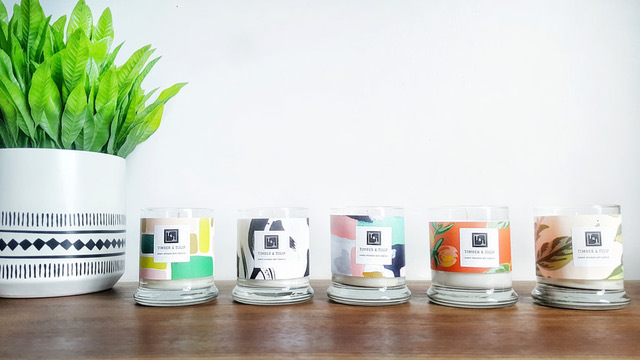 These candles from Timber and Tulip are beautifully fragranced, and also double as an eye-catching decor piece. 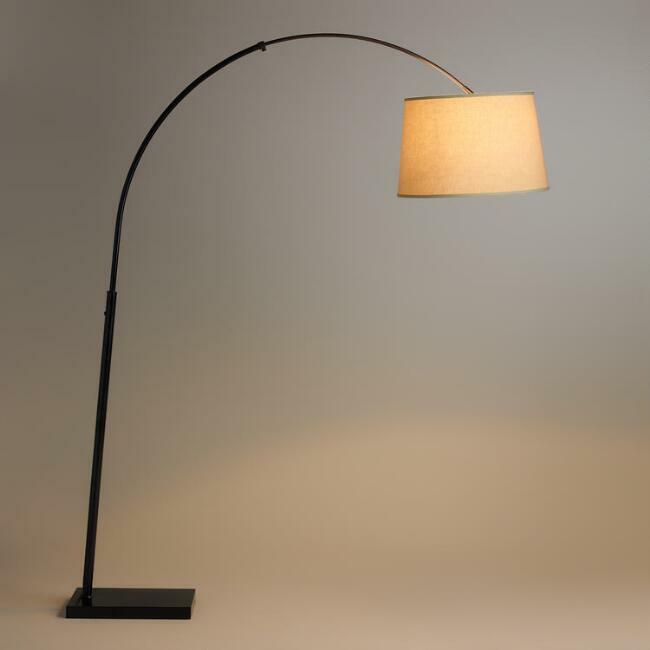 This floor lamp from World Market is a dramatic statement piece when placed over a sofa, and it’s 1/5 of the price of it’s name brand counterpart. We love it…and so will you! 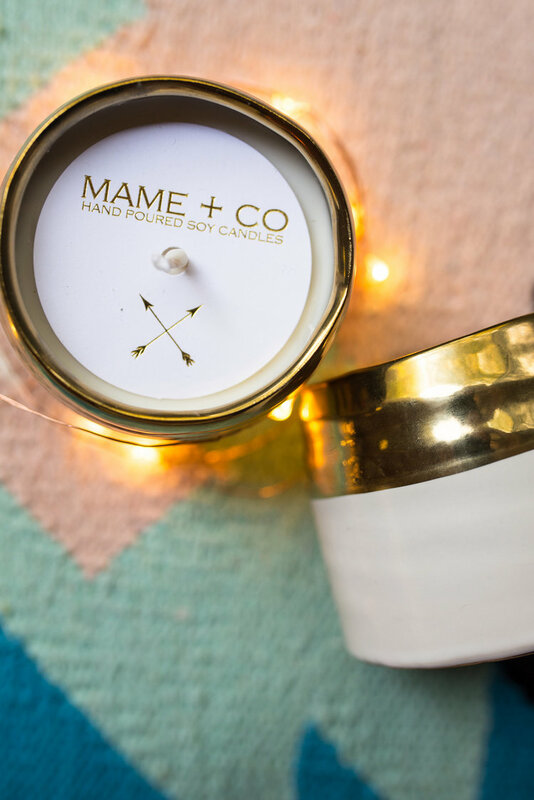 One of our absolute favorite candle lines, these Mame Soy Candles are hand-poured and come in so many amazing fragrances. Their bestseller is this gorgeous Amber, Leather and Teakwood candle–it’s got fall written all over it! Treat yourself to this beauty, and grab one as a gift for a friend–they’ll thank you for it. Well, there you have it friends! Just a few of our favorite items…be sure to check out our Shop our Favorites page for more of our Fall Favorites, and don’t forget to tune into gravylive.com today at 11amCST to catch us LIVE! Have a great week! Fall is upon us! If ever the weather was an indicator of what life is really like, it’d be now! Fall has ushered itself right in with pumpkin everything, just as expected. What we love most about the change in season, is that it serves as a reminder that change is constant, and the more we can adapt to the ebbs and flows of life, the better. In fact, the entire process is beautiful, just like the splendor of fall. 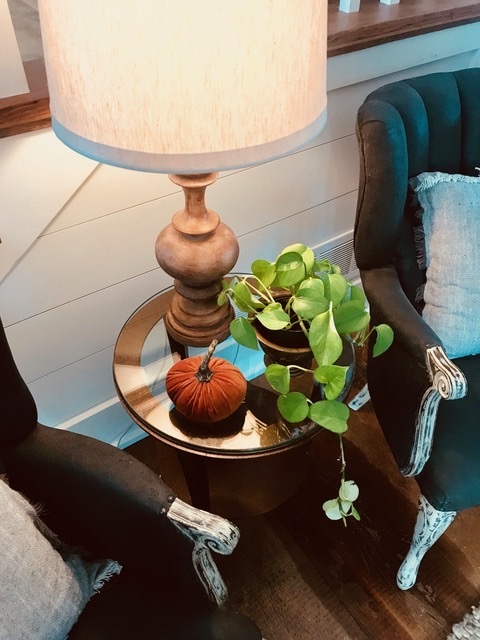 A few ways we’ve have come to love fall and accept its sneaky pipeline to winter is through home décor! We absolutely love to take the slight chill in the air and bring in some foliage to reflect what’s happening outside. Here’s a little peek into what’s going on at Jessie’s house. A few keenly placed, simple items will do the trick. Here, a simple vine is all that’s needed to make a big impact. Add in a few pillows, a cozy throw and perhaps a pumpkin or two, and you’re set. Some people decorate their space and never change a thing. If you’re in that camp, don’t worry, YOU BE YOU! But it you’re like like us, and have learned to embrace seasonal shifts, changing a few key things will give you that mental note that, “Change has come and everything has it’s season”. That is SO the ever flowing motion of life in in all possible categories. 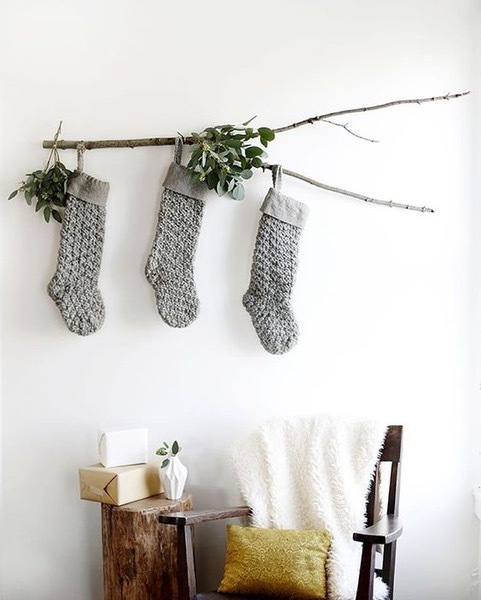 Seasonal décor is not frivolous if you consider it a joy nugget for the soul! 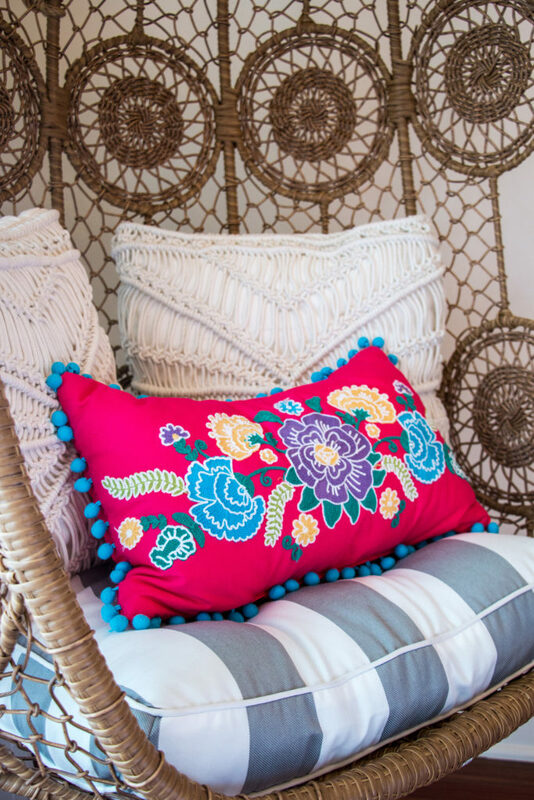 Just go on and love those throw pillows you’ve stashed until it’s time to change again. Keep your accents simple to ward off feeling overwhelmed and to take in the beauty of change and welcome whatever comes next. Hey girls! 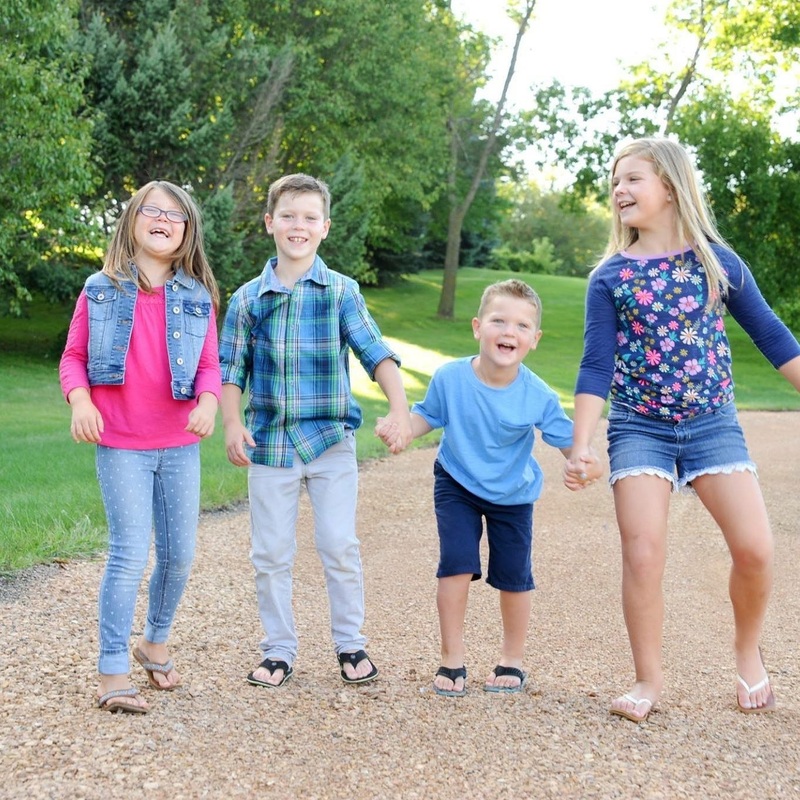 The kids are back in school and we are looking forward to a fantastic fall. One of the best things about this time of year is the fashion! It’s just waaaaay more fun getting dressed when you can layer things up. 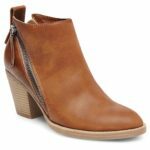 As we make the transition from warm weather to cooler temps, we want to talk about two key pieces every mom should be adding to her wardrobe right now: #1- A great bootie #2- A statement sleeve. 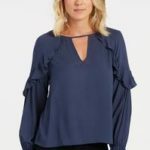 Ruffles, ties, and all things feminine continue to dominate the runway and this season it’s aaaalllll about the statement sleeve. But let’s be honest, big and poufy is hard to pull off for a lot of us. In this case, I think we can all agree that less is more, so look for details that add a hint of drama without going overboard. 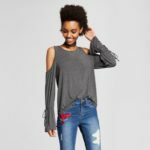 A great way to cut a bit of the sweetness is by pairing up ruffles with a great pair of distressed denim. 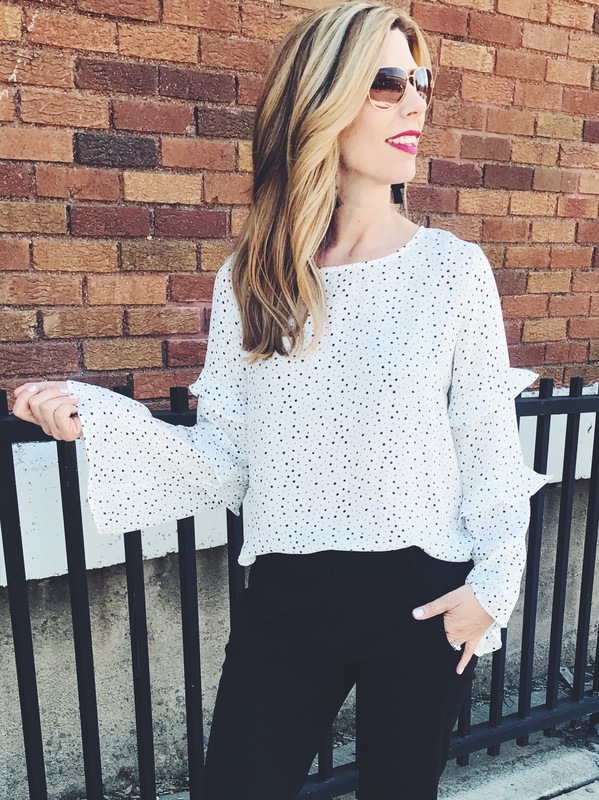 If ruffles feel like too much of a leap for you, try a minimalist approach with a slight bell sleeve and a small tie. 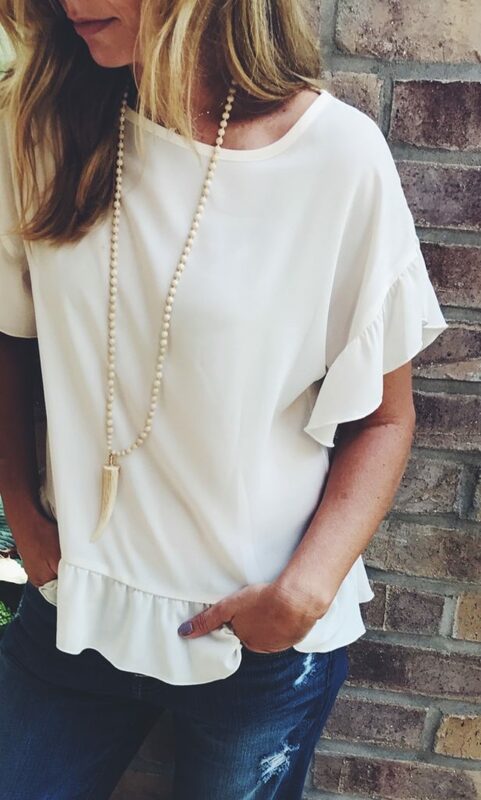 The drapey fabric in the sleeve adds a little interest to this top, and the tie is a sweet detail on an otherwise simple design. Perfect for those who want to gradually ease into the feminine trend! Thank you, friends, for your fierce support and encouragement with ShineUP Episode 2!! 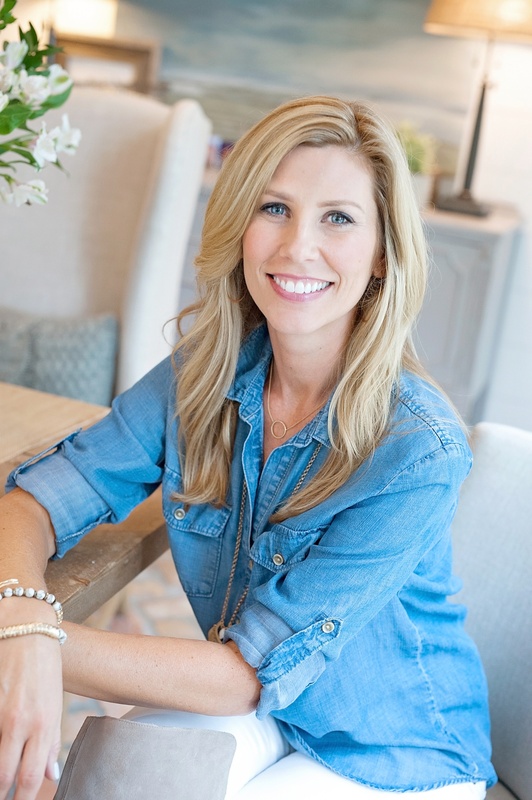 It was a brilliant transformation that brought a tremendous amount of light into Christie’s home, and truly reflected who she is: a compassionate, caring, generous, tender-hearted mom with an ocean-sized heart. The impact of paint, tile, and fabric can NOT be underestimated, and today we wanted to share a few of the design decisions behind her space. 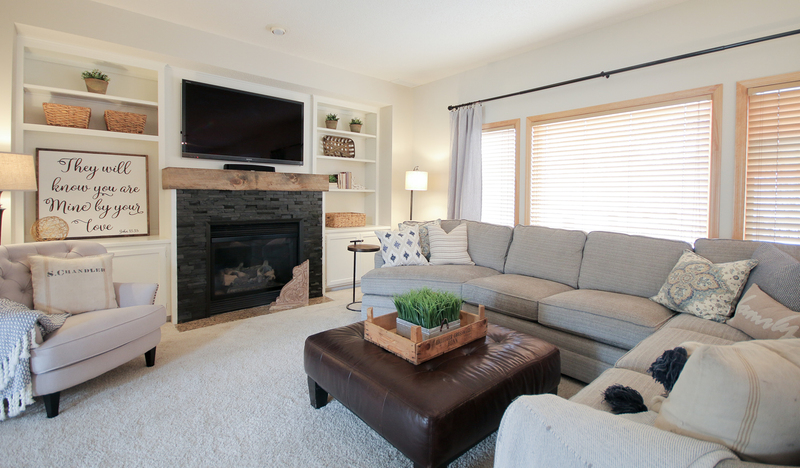 Christie wanted the modern “Farmhouse” style integrated into her space. She was tired of her existing decades-old decor, and it didn’t lend to that desired style in any shape or form. We immediately knew that we needed to brighten up the space. 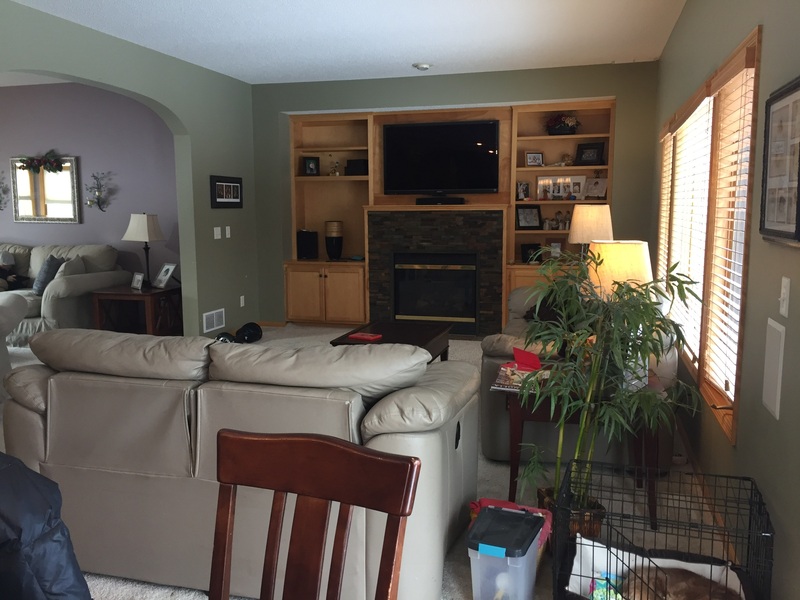 In order to flood the room with light, we painted the cabinets and trim white throughout the kitchen, as well the living room bookcases that flanked the fireplace. We also included the small desk area in the kitchen as we passed by with the paint sprayer. We are avid addicts when it comes to Benjamin Moore Dove White (OC-17). That pretty dove never fails us! 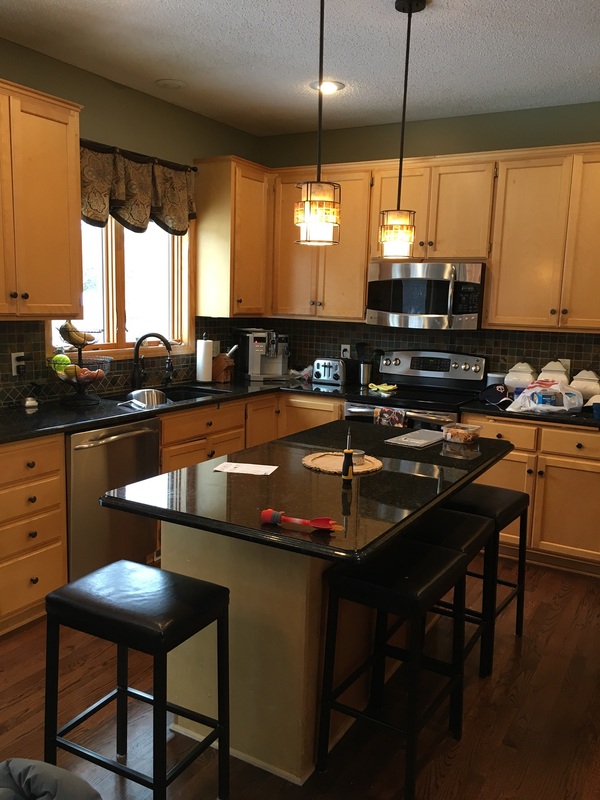 To complement the white cabinetry, we also chose to demo her existing kitchen backsplash and replace it with our personal timeless favorite: white subway tile. Choosing a light grey grout (Dorian Grey from Home Depot) gave the kitchen a touch of dimension. A beautiful grey fabric for the cornice over the kitchen window softened and warmed up all of that white. 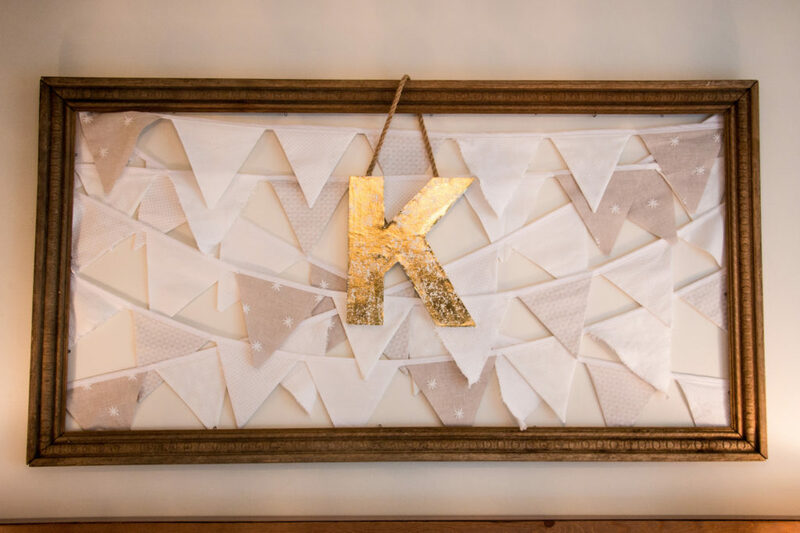 This was made by our local favorite, Karna Rice of Grace Inspired Interiors. 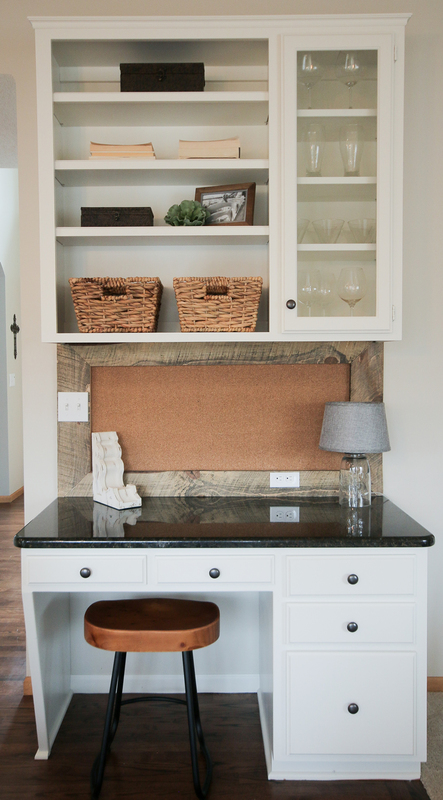 This grey fabric tied the intention of the grout color together beautifully. 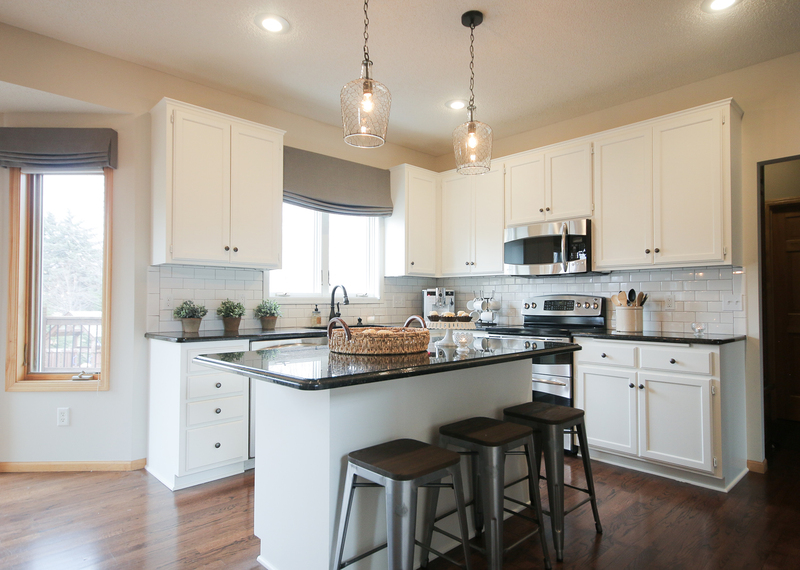 The white cabinetry against the white subway tile and subtle grey grout provided an incredibly dramatic change. The living room and kitchen in Christie’s home is a completely open concept. This meant we had to work to marry the two spaces together well, tying in colors and textures for a unified feel. 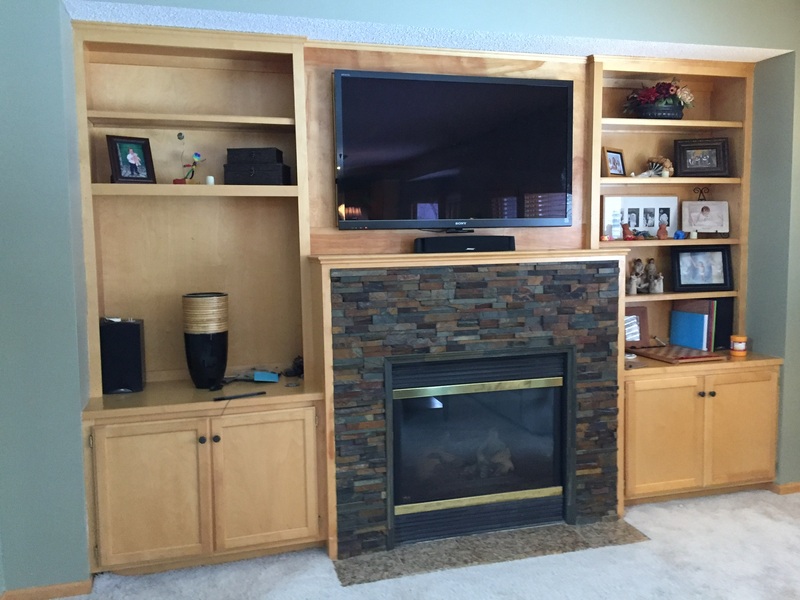 In addition to painting the bookcases, we made the bold decision to paint the existing fireplace stacked slate! 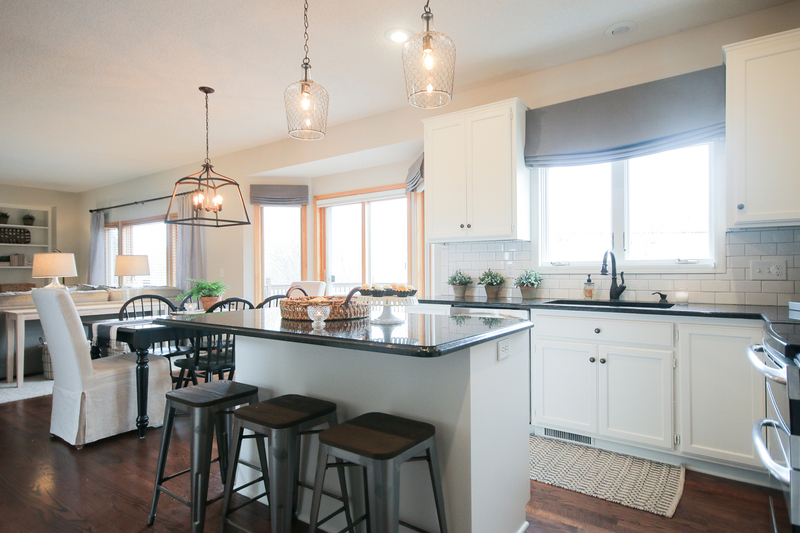 Our color choice was a slate gray by Sherwin Williams, which popped generously against the white cabinetry, and was also a nod to the grey grout in the kitchen backsplash. For the mantle, we used wood flooring from Metro Woodworks to make a cap that we built to fit like a sleeve over her existing mantle. 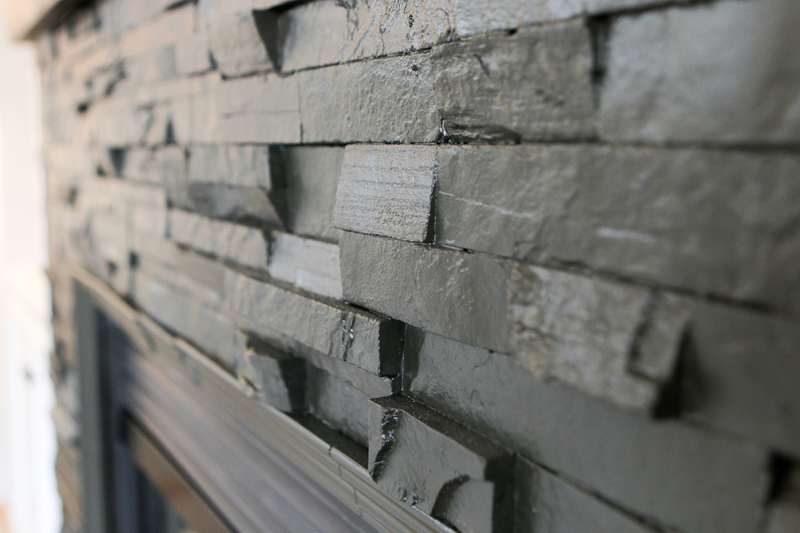 That fabrication meant no demo needed and no risk of damaging or losing the beautiful slate tile we had just painted! Lastly, we gave every wall in all three spaces a fresh coat of Edgecomb Grey (HC-173), a warm Benjamin Moore color providing a perfect neutral backdrop for the furniture and textiles. 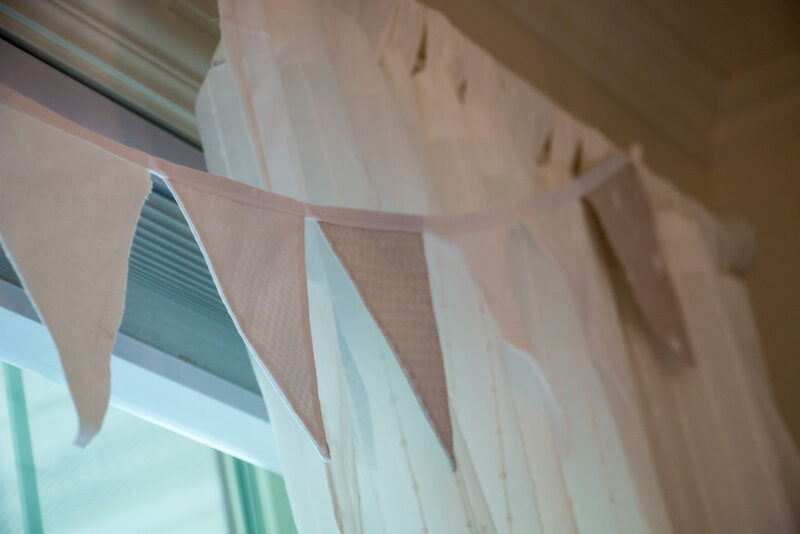 We added long, linen drapes to soften the edges of the windows. The front living room was full of overstuffed furniture that no longer served a functional purpose in Christie’s home. Removing most of that furniture opened up the space, allowing it to breathe. 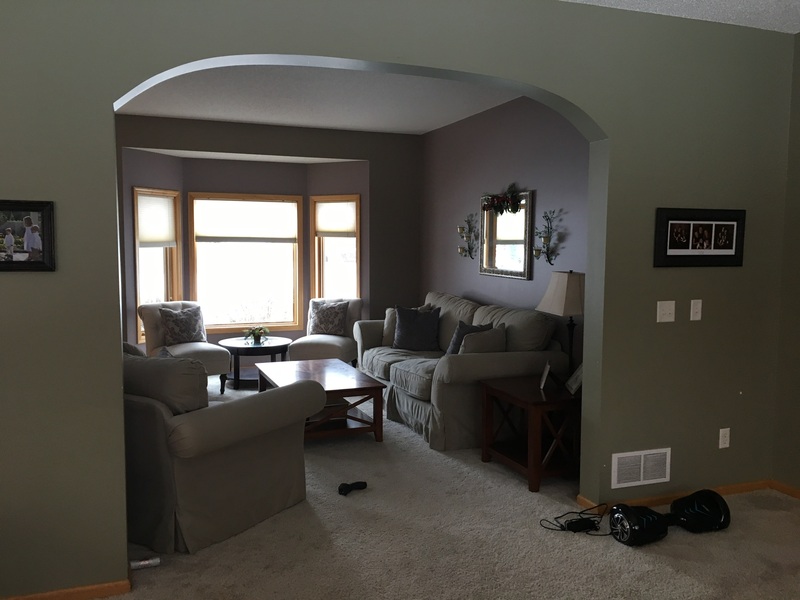 By keeping the paint consistent throughout the main level, the formerly dark, crowded room is now a bright, cheerful extension of the family room. We tied the drapes back with vintage rope we picked up at an antique store. Paint, tile, and fabric: It’s amazing, the massive impact that these design decisions made. Christie’s dark, tired space is now a light-filled, beautiful reflection of her own personality and warmth. Stay tuned for more details on Christie’s design…coming soon! If you missed ShineUP Episode 2, you can catch it here. Follow and like us on Instagram, Facebook, Pinterest, and Twitter! 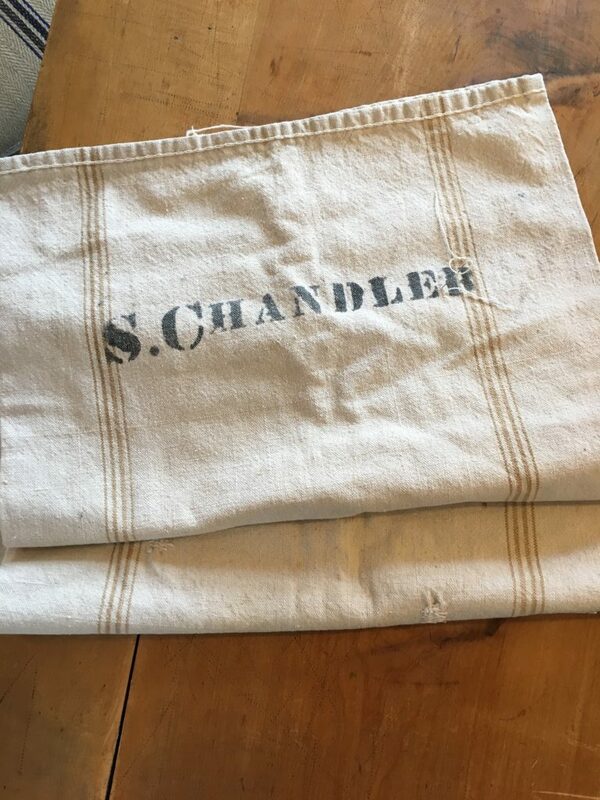 It’s a grain sack pillow, girls, and it’s soooo easy and inexpensive to make! 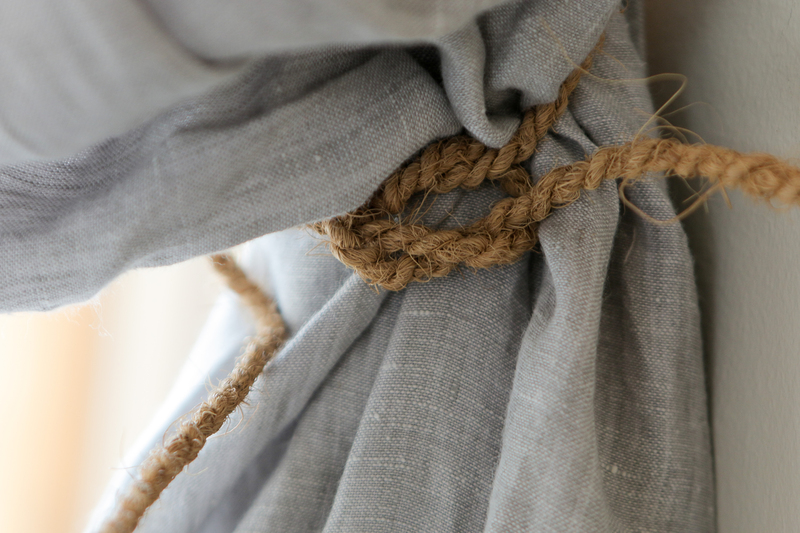 All you need to do is head to your local antique store to find a well weathered sack. We found this one at “Shop 501” in Chaska, MN for only $12. The distressing and graphic print on it is perfect for creating a vintage, farmhouse feel. 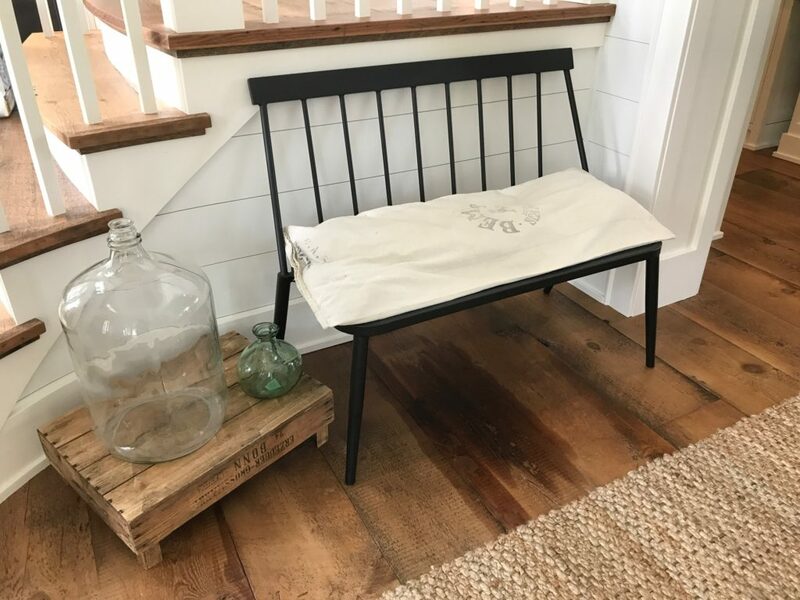 This one makes a great seat cushion for one of our absolute favorite benches from Target. Drooling? We are too. 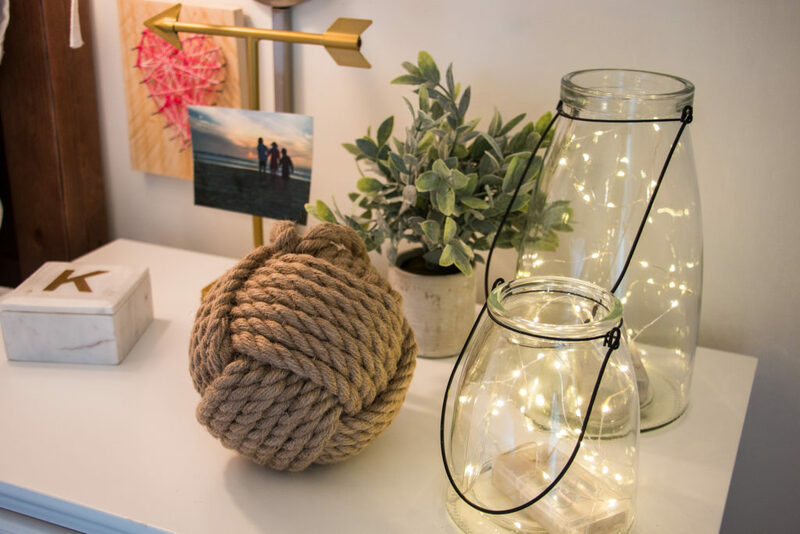 This heavenly little landing spot is something Jessie created for her entryway. One last idea for grain sack pillows: they make a beautiful accent for your bed. Just one can make a stunning impact. This one in Jessie’s bedroom is made from an antique, European sack found at Piccadilly Prairie in Edina, MN for $80. A little pricier, but when you consider what you would pay for several accent pillows to decorate the bed, the investment is worth it. 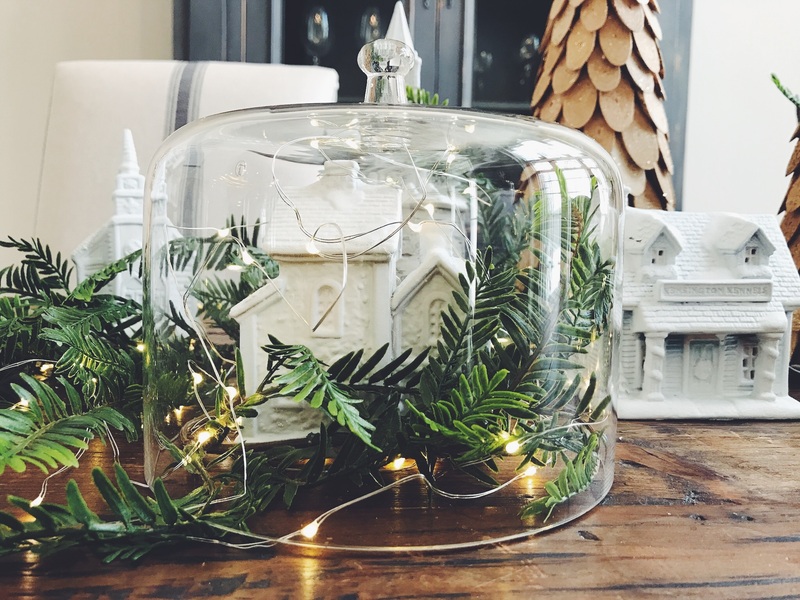 So, don’t be afraid to think outside the box when decorating your home. 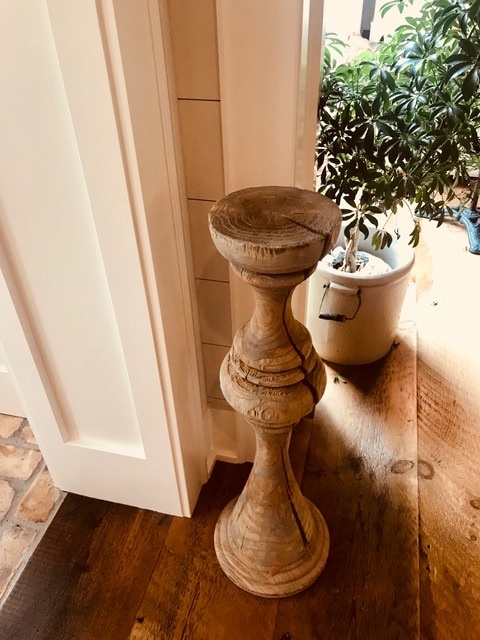 Sometimes the most unusual items can go a long way in adding character and personality to your space. We can’t wait to show you all of the other design details from our next ShineUP makeover project. We’re just about ready to share it with you all! Stay tuned! ShineUP episode 2 premieres next week! Ladies, can we all admit that sometimes, getting dressed for a night out can be a bit overwhelming? Often, the thought of deciding on an outfit is enough reason to just stay home. 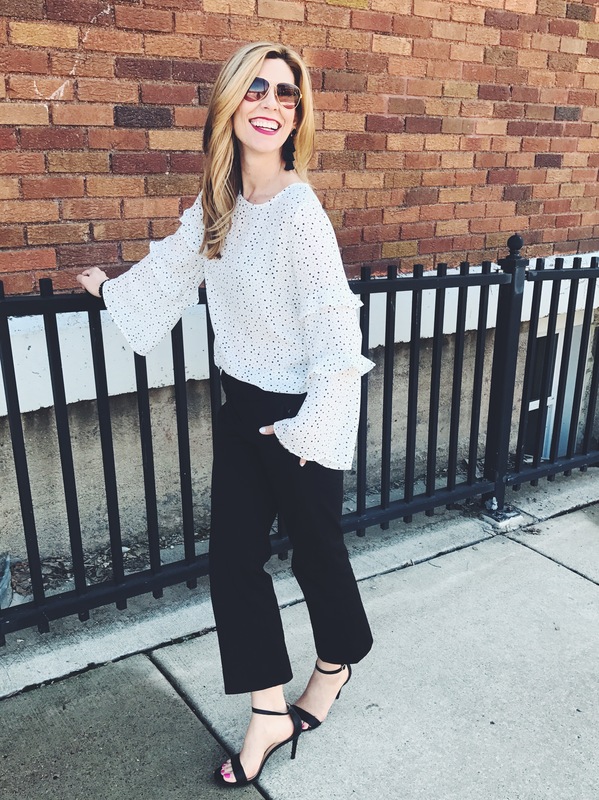 As we ponder our closets, we search desperately for an option that makes us feel confident, current, cute, and most of all, comfortable. Tall order? Yes. Impossible? No. We believe the best solution to the “getting dressed to go out” problem is a killer kimono. 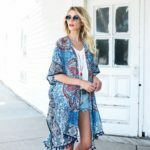 We are soooo glad that kimonos have been everywhere this season. From florals to stripes, we love them all. They are universally flattering and throwing one on is an easy way to add elegance. However, there ARE a couple of guidelines we like to follow in order to make styling these a cinch. Next thing to consider: showing some skin! That’s right, kimonos are best worn with a little décolletage. Exposing this area can make all the difference in balancing out the wide sleeves and bold patterns. We think this v-neck cami from Gentle Fawn is perfection. 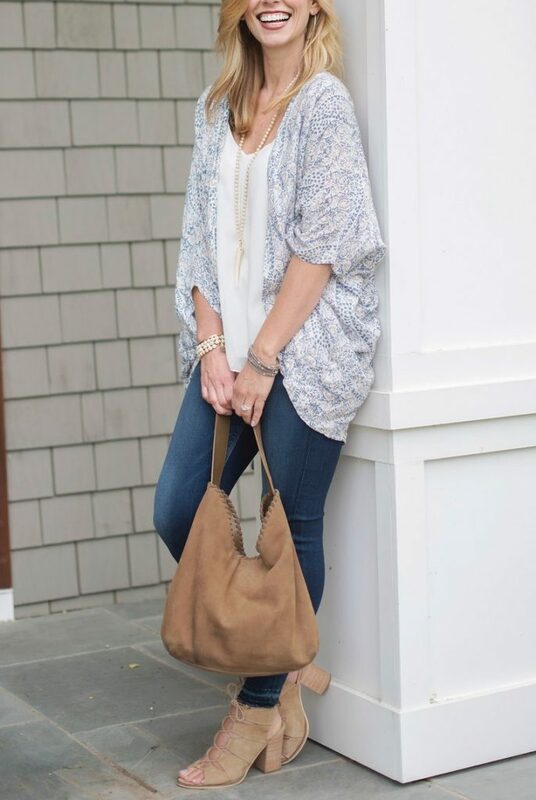 One last note: although kimonos are great for summer, they’re going to be hot for fall as well. Think knit fabrics, velour and even quilting. 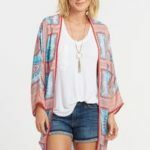 The trend is here to stay, ladies (lucky for us), so style away and don’t be afraid to get your kimono on! Abbie here, talking gallery wall design. 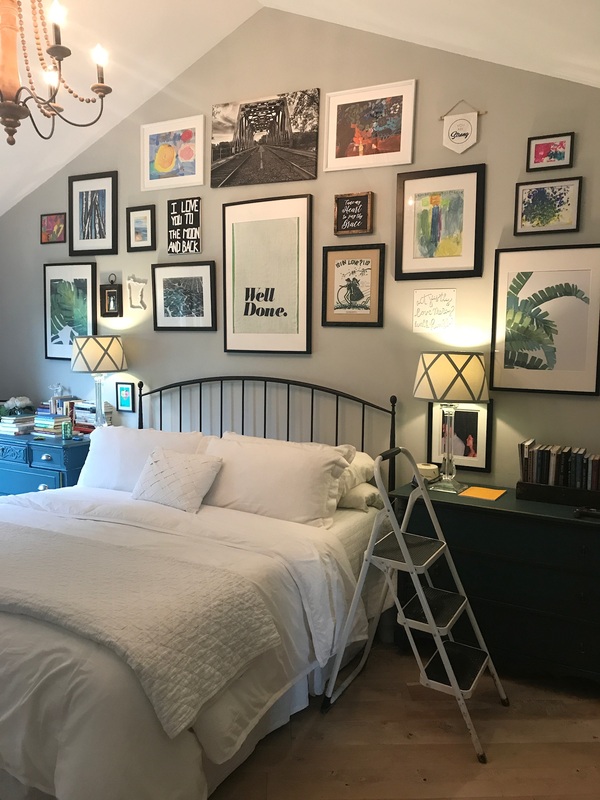 My love of gallery walls is well documented, and recently I borrowed some inspiration from my mom to create a gallery wall in my master bedroom. My mother is an excellent designer and home stager. She has always had a great eye for proportion and balance amidst a display of cool things around the home. 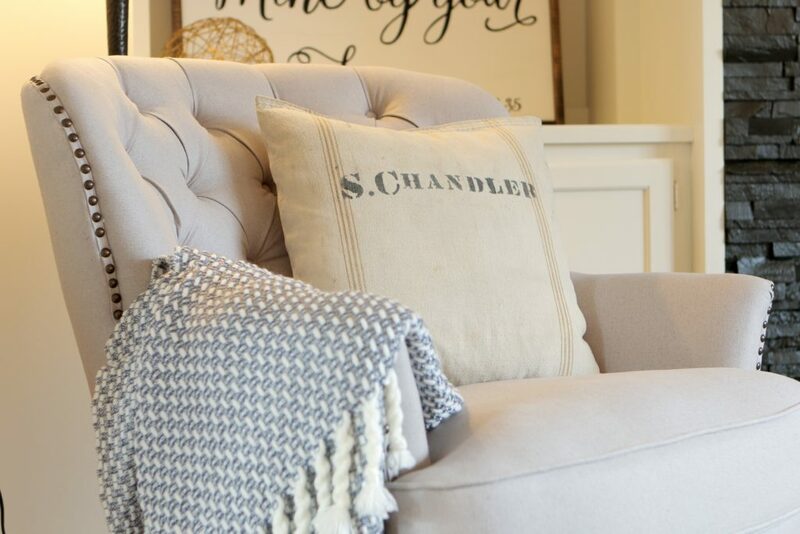 Every upholstered piece of furniture in our home would change seasonally with a slipcover or throw pillow. And if something stands still long enough, she’ll paint it! She describes a comfortable home by saying: “your home should rise up to meet you.” Your living space should be a source of comfort, peace, and ease. “Home” is very much a place and a feeling. 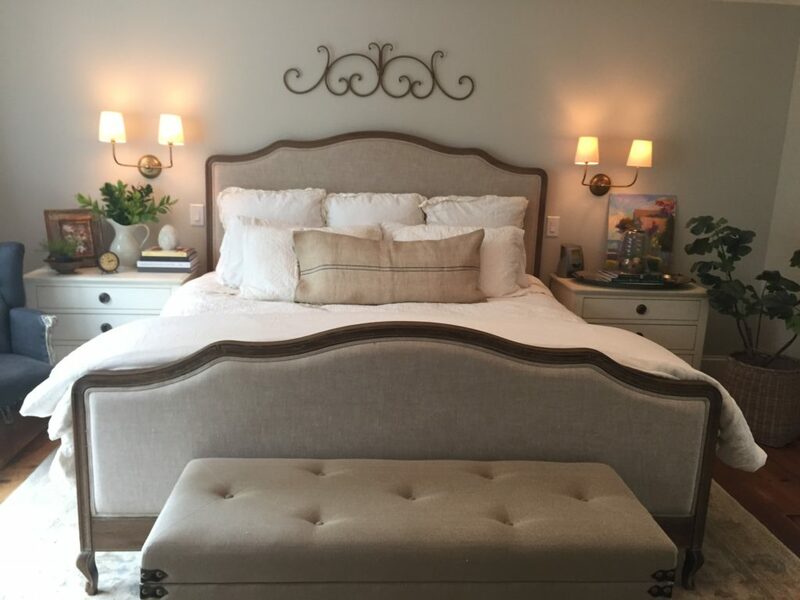 I put my mother’s words into practice in my master bedroom. I have a very high, pitched ceiling that I literally had to rise up to meet (i.e. one foot on the bed frame and the other on the tippy top of the ladder). I decided to create a gallery style wall above my bed, which was otherwise a tall, vast empty space. My love for a black and white palette mixed with pops of color provided my general design inspiration. 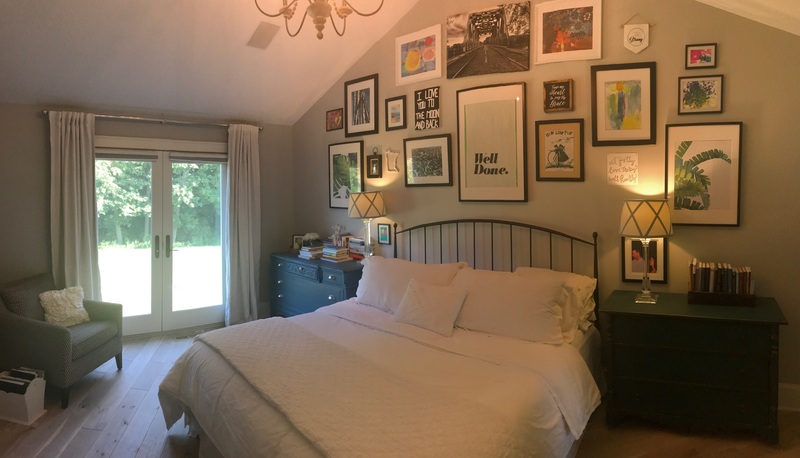 To give credence to what matters most to me, I used random prints around the house and my children’s framed artwork from school. I scurried up the ladder, found my center of the room, and began building a gallery that felt somewhat balanced. I worked left to right, back and forth putting prints where they felt best. There was no real rhyme or reason, but my children’s school artwork served as my pops of color. Black frames from IKEA, Target, and even the Dollar Store (gasp!) provide a crisp framework for these beloved pieces. I also placed a few meaningful statements that spoke both to my marriage and my life as a mom and friend. The act-love-walk sign from Magnolia Market got a quick coat of white spray paint–this message to my soul is one of my favorite little pieces in the room. This wall is now truly a reflection of my style, which is casual and eclectic, with a nod to the modern farmhouse. I repurposed dressers I rescued out of a bank-owned foreclosure, and brought them to life with Annie Sloan chalk paint. My acrylic bedside lamps are from Target and will virtually never go out of style. 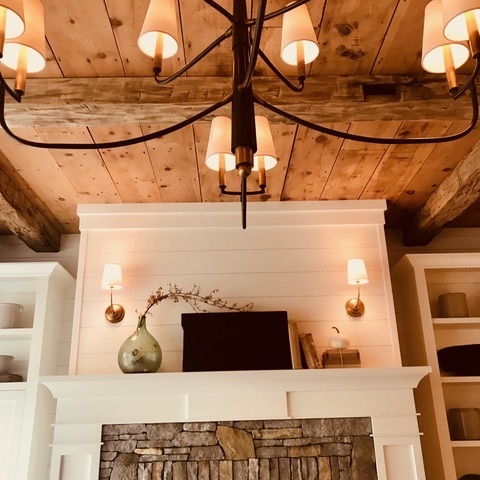 The all wood chandelier, all white bedding and curtains from both Pottery Barn and Que Sera (in Excelsior, MN) are more timeless classics that anchor the room. The end result is a space that speaks to both my personality and my heart, and I absolutely love it. I feel at home in this room. In summary: when building a gallery wall, find what appeals to you. 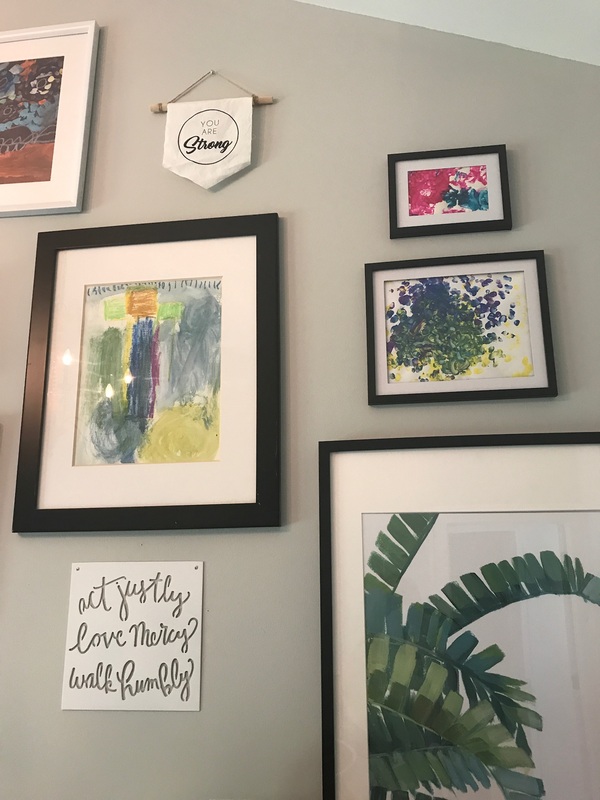 Frame your children’s art for a massive money saver and completely meaningful print. Find words that speak to your life. And make sure the space rises up to meet you! Hello girls! Today, I’m excited to talk about one of my favorite subjects: beauty! Let me start by saying, I’m no expert. But I’ve always loved makeup, hair and style; what can I say, I’m a girly girl! I love experimenting with new colors, new trends and new products, and today I’m sharing my basic, everyday beauty routine. 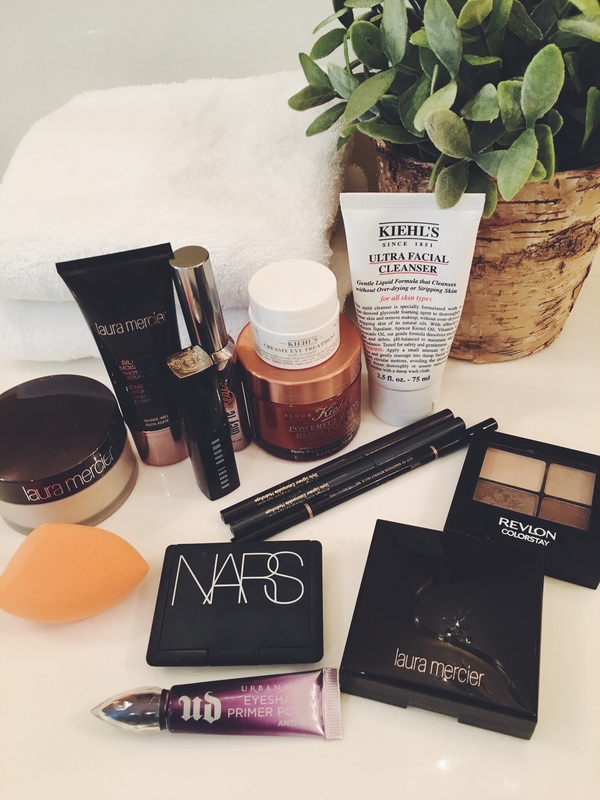 Here’s a look at the products I can’t live without! First things first…skincare. 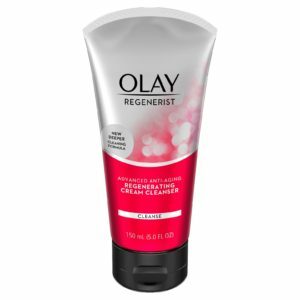 I don’t really do anything fancy on a daily basis, just a good cleanser and a great moisturizer. I’m a big fan of Kiehl’s. It helps me prevent two things: breakouts and breaking my budget. 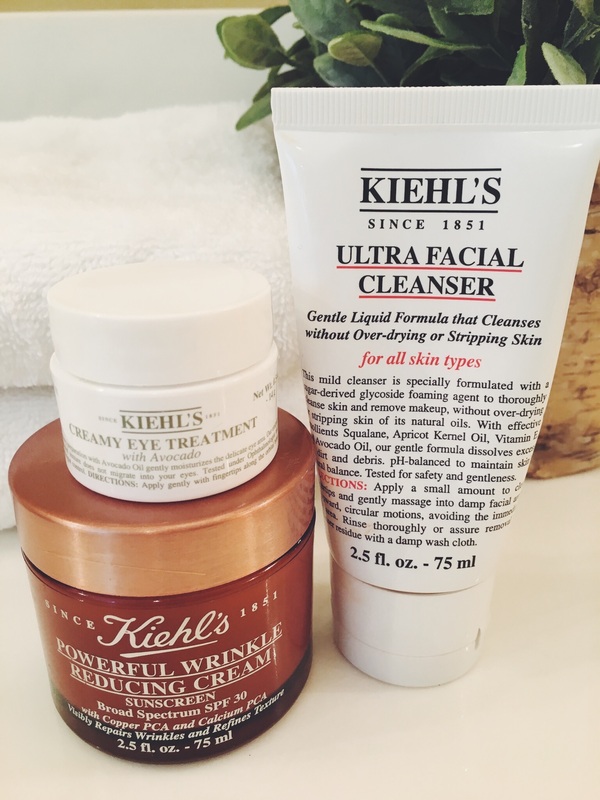 Morning and night, I use the “Ultra Facial Cleanser,” the “Powerful Wrinkle Reducing Cream with Sunscreen” and my absolute favorite, the “Creamy Eye Treatment with Avocado.” I can’t say enough about the eye cream. It seriously is the very best eye cream I have ever tried (and I’ve tried a lot). It just does a great job at moisturizing. Next, I use a good foundation. If you’re not using one, you should. I’m always a bit perplexed when girls tell me they don’t use foundation. For me, it is the base on which to build from. Would you build a house without laying a foundation? I think not! The same goes for our faces. 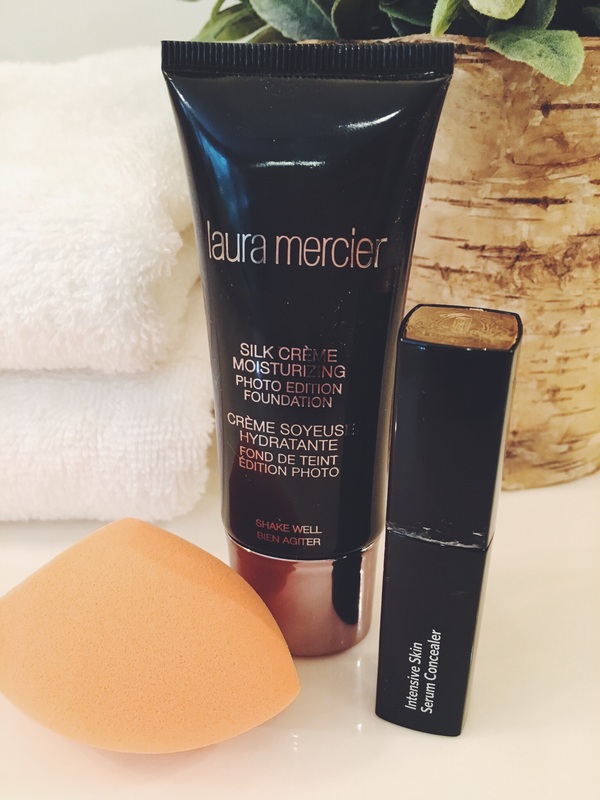 Right now I’m using Laura Mercier’s silk creme moisturizing photo edition foundation. I love it because it just melts into my skin, evens out my skin tone and covers all my sunspots. To apply it, I spread dots all over my face and blend them in with a damp makeup sponge. I love this one by Real Techniques. Next, I start with a primer on my eyelids. I like this one by Urban Decay. It helps prevent eyeshadow creases and keeps the color lasting all day. Right now, I’m loving this eyeshadow palette by Revlon called Addictive Intoxiquant. 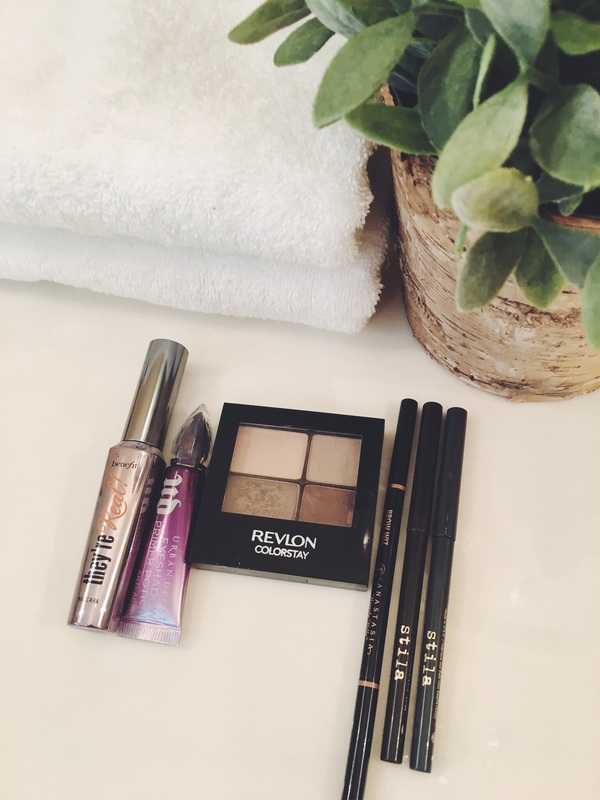 I love the neutral colors for everyday and I usually use three shades, the lightest for the brow bone, the midtone over the lid, and the darker brown for the crease. After doing my eyeshadow, I move on to my brows. I have really sparse eyebrows so I HAVE to fill them in. It makes such a difference. Brow Wiz by Anastasia in taupe is my go to. For eyeliner, these Stila liners are very easy to use. They glide on quickly and are easy to buff out with a smudger to give you a more natural look. Then, I apply mascara. Hands down, my favorite one is They’re Real by Benefit. To finish things off, I use this blush by Nars in “Dolce Vita.” Since it’s summer, I’m using bronzer daily to give me that sunkissed glow. This one by Laura Mercier called “Candleglow” is very subtle. Great for everyday. To set everything, I use a translucent powder. I bought this one by Laura Mercier last year and the container is still very full. There you have it, girls. My everyday routine. Pretty simple! It usually takes me five to ten minutes to breeze through. Because so many of you have asked about our beauty routines, we are going to be sharing a lot more of the products we love. Stay tuned! Next week, Jen, a former makeup artist, is going to show us how to kick things up a notch for a night out. We can’t believe it’s almost the Fourth of July! It seems like the kids just got out of school last week. If you haven’t had much time to plan for the holiday, we can relate! But not to worry, there’s still time to pull it together. Here’s a look at some our favorite patriotic pieces that will be perfect for your holiday parades and backyard barbecues. Nothing says American style like distressed denim. (Thank you Bruce Springsteen!) These shorts from Target are so comfortable and look like you’ve had them for years. We paired them with this great graphic tee from Evereve. Nothing is easier than a pretty, flowy, summer dress. 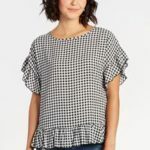 We love this one from Target and it’s a steal! Can you tell we love graphic tees? This one from Banana Republic’s Factory Store expresses exactly how we’re feeling now that the sun is shining! 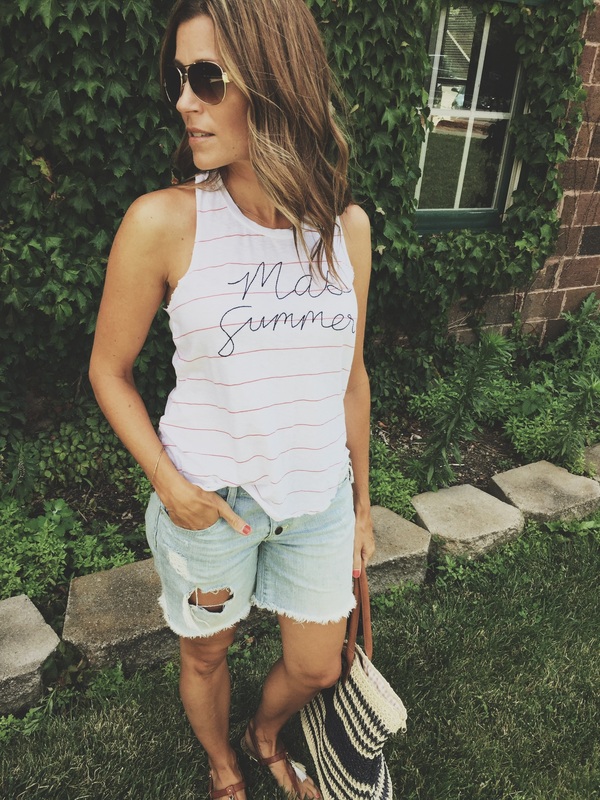 We paired it with white, cut-off denim shorts from Evereve and a cute pair of striped sandals from Target. 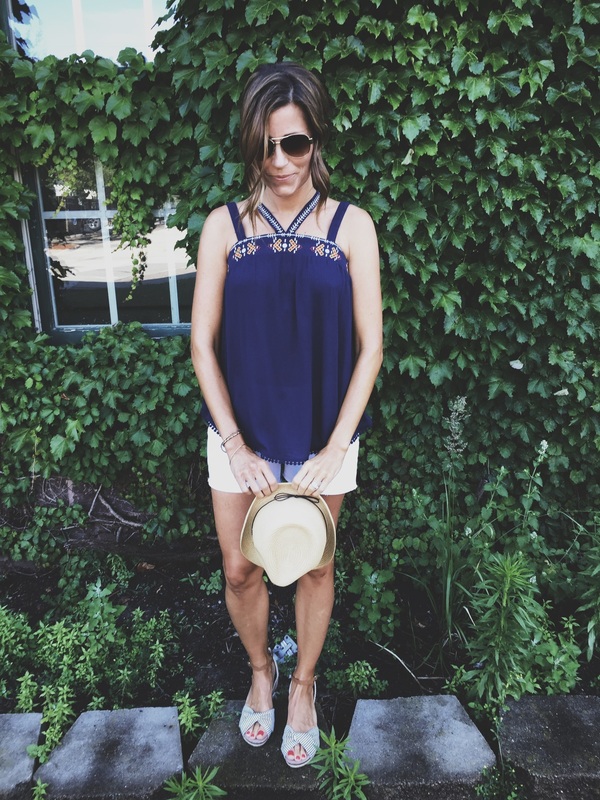 We are in love this flirty, little top…the straps are adorable and the embroidery detail gives it kind of a boho vibe. The blue color looks good on everyone! Here’s to parades, fireworks, and freedom. So grateful to live in this country where we’re free to pursue our dreams. Have a wonderful and safe Fourth of July, everyone! *affiliate disclaimer: this page uses affiliate links; all opinions are our own. Happy Monday, friends! Hope everyone had a relaxing weekend. We’re all full-swing into summer, and couldn’t be happier about the sunshine and freedom this season brings. Our ShineUP Crew has been hard at work, preparing to launch the second episode of our show. 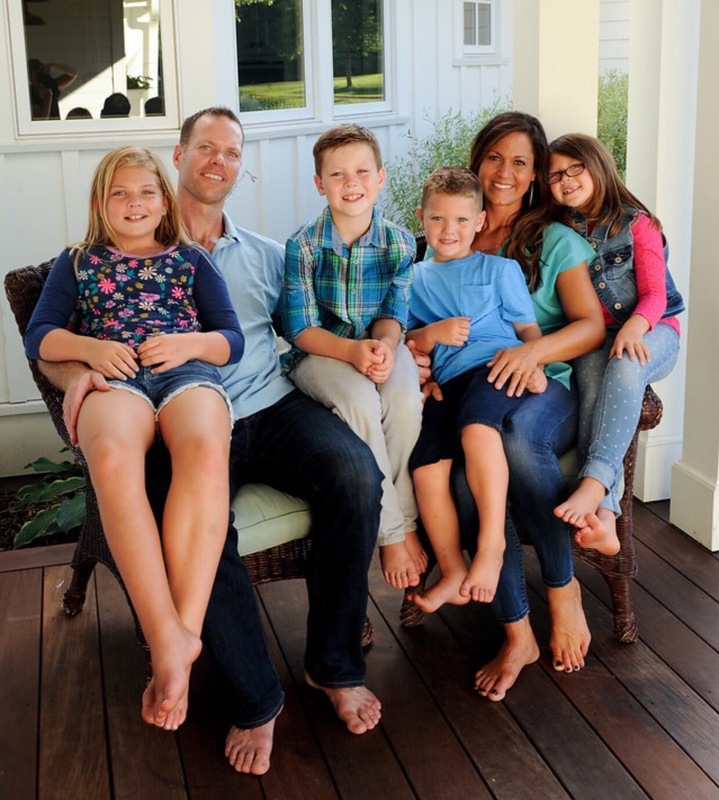 But before we do, we wanted to share a heartfelt letter from Nicole, our first ShineUP mom. As you’ll remember, we designed a music room space for Nicole, a special mom who is living with a painful, chronic disease. Shortly after we completed her design makeover, Nicole sent us this thank you, and we continue to be blown away by the power of beauty. The impact on her life is truly the reason we do what we do. Thank you, Nicole, for allowing us into your story, your home, and your heart. If you missed Nicole’s episode, you can find it here. It’s a story that is well worth your time. Hi girls! We’ve got Father’s Day on the brain, and one of the best ways to brighten your husband’s weekend is to go the extra mile with all the little things: making his favorite breakfast (be sure to include bacon! ), giving him time to relax, and last but not least, securing a babysitter so the two of you can slip away for much needed conversation and connection. In fact, sometimes the very best gift we can give him is to let him know he matters, he’s worthy of our attention and that he still gives us butterflies. So, here’s our suggestion- throw on some lipstick, grab a killer pair of heels, and slip into a flirty little dress like this one we found at one of our favorite boutiques, Willa June. The “Winslet” dress by Gentle Fawn is our latest obsession. Why? So glad you asked. We love that it gives the appearance of a slinky black dress, but trust us, it’s soooo comfortable and the fabric drapes in all the right places. It’s really a win win. As you’re dressing to impress him, style it with strappy heels and minimal jewelry. For another look (we ladies love layers) add a denim jacket or a long sweater vest like this one by Tart. If you prefer color, here’s the same dress in a beautiful sandalwood hue. We seriously can’t decide which one we love more! And there you have it girls – permission to shop for something extra special this Father’s Day, as long as it’s all in the spirit of knocking his socks off! If you’re like me, you’re weekend is full, full, full! Soccer games, dance recitals, birthday parties, grocery shopping- I mean, the running never ends. The chaos is real. That’s why comfortable, easy, throw-on clothes are a MUST for us moms, but I’m reeeeally trying to leave the athletic wear for the days I actually exercise (or at least try to). So come on girls- we can do this. Casual CAN be cute. In fact, it’s my very favorite way to dress. These cargo pants from Sanctuary are a no brainer. They have just the right amount of stretch for busy days when we’re running all over the good, green earth. I have them multiple colors (army green, white) BUT- I happen to think the camo print is the coolest. In fact, a good camo print an easy way to show your fun, trendy side, while still keeping things kind of muted and neutral. Here, we styled them with a fun graphic tee (sold out, similar) from Willa June and this awesome hooded blazer (the hoodie zips out) from Evereve that I’ve worn at least two times a week since I got it. Finish with a great pair of fashion sneakers like these from Brooks, and you’re ready for a full day of mom hustle. All of us at ShineUP are really into the distressed denim look right now. We marvel at each others ripped jeans, as our kids ask us “Mom, why do you have holes in your pants?”. I love these AG ankle skinnies (similar), that are on constant repeat in my closet (thus the huge holes in the knees). Here we paired them with a great utility jacket and a Gentle Fawn striped tee from Willa June. 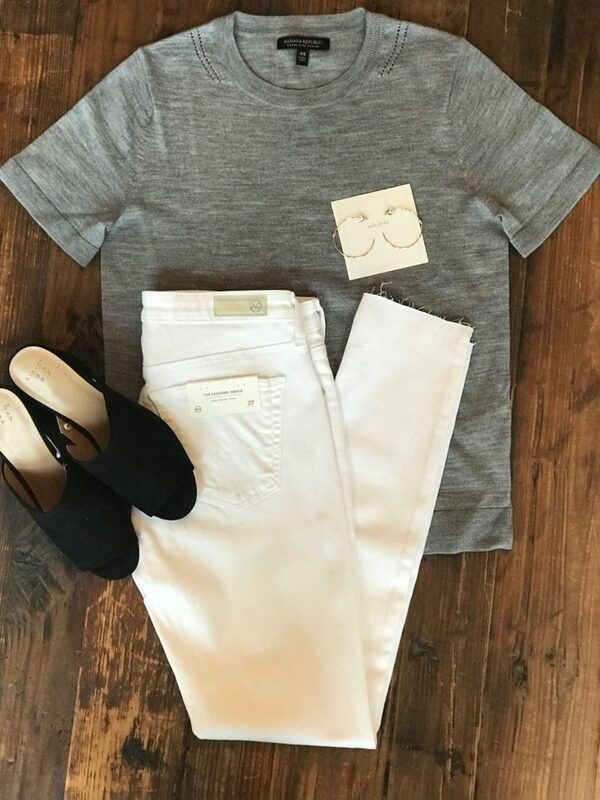 To finish things off we added a simple necklace from The Giving Keys, a tote we love from our girl Joanna Gaines, and cute pair of converse sneakers. Effortless, yet totally pulled together to give you that coveted, pintrest “cool girl” kind of look. By the way, this is Jessie’s dog Jack. Isn’t he cute? He is the best encourager ever with his constant stream of kisses. Good boy Jack! These are the looks that will put an extra pep in our step as we bounce around town feeling all powerful and stuff. We got this! Yoga pants, stand down. It’s time to #makegoodchoices. I would not trade in any children (at this particular moment!). I am in awe and I truly do appreciate the vast differences in personality amongst my brood of four lively, strong-willed children. I have four children. That’s just A LOT. Okay?? My last was born at 10 pounds 8 ounces. And yes, that big boy came out after his shoulders got stuck. Good times. I think I get it now, you guys. At least things seem a little clearer to me after 10 years of this multi-faceted job. 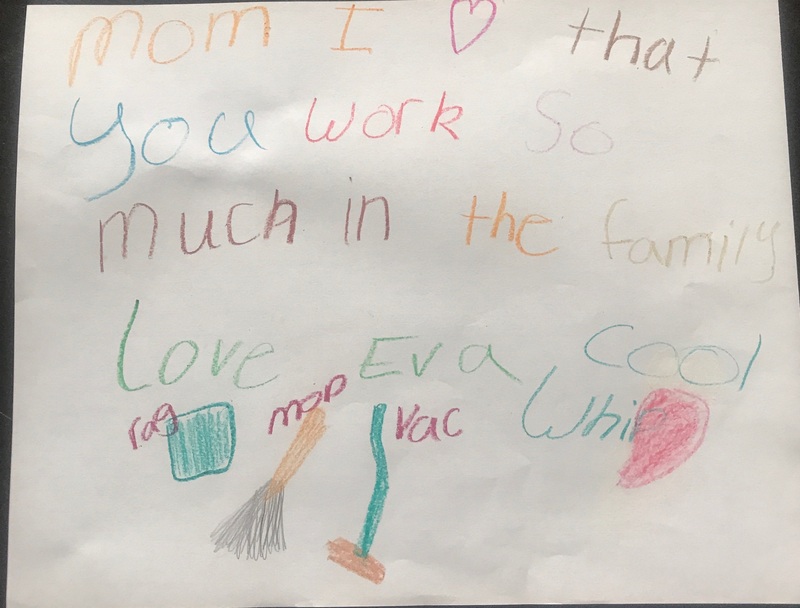 This mom job was pitched to me as “the best thing that’ll ever happen to you.” Moreover, people told me it was “the most rewarding experience this planet offered.” If perhaps you laugh and have these foggy synapsing brain receptors firing at the sentiment of those messages…then a BIG, HUGE “ME TOO” is coming straight outta my mouth!! I had NO CLUE that motherhood would be as challenging as it is. I had NO CLUE that, in reality, 75% of the time we are on a massive learning curve/teachable moment around here while 25% of the time there’s lighthearted, meaningful interactions to cherish. This job is tough people! Truth be told there are days that I just want to either scream or be completely silent out of exhaustion as I power through the minutes to bed time. There are days that I happen to hug a little one and my heart thinks, “this IS a wonderful life.” But, 75% of the time I feel under qualified, under valued, out of my capacity to tolerate the madness. There are the fights, the tears, the “that’s not fair” struggles and every mom’s favorite, “we’re bored” pronouncements. Then there’s the company of on-lookers that remind you to enjoy it ALLLLL because it’s disintegrating before our eyes. To that, I rebuttal with this: maybe the point isn’t to enjoy it all now – because that’s impossible – but rather to feel comforted by the fact that there’s a day coming that we’ll look back with 75% fond memories and 25% “how did I make it through all of that?” memories. In other words: There’s A FLIP FLOP IN SIGHT for those very challenging, present tense ratios we’re enduring! Sometimes feeling joy in the midst of being a mom is just difficult to summon: you feel tired, the house is filthy, and you’re out of milk which means your ‘cereal for dinner’ plan fails and you have to actually make something before the 4 sports events that criss-cross in 5 minutes from now (was that a RUN-ON sentence?). Feeling overwhelmed? Yeah. Me too. Here’s the GREAT news: you have EVERYTHING you need. You really are ENOUGH of a woman inside to show up to the arduous task every day. I mean, you’re a sight to behold. All tired and stuff and mustering up one more french braid, one more cleaning of the pee filled sheets, one more breaking up of a fight…you got this. I do too. You get what you get and you don’t throw a fit. Your kids ARE who they ARE. Shaping their personalities and immature responses is like molasses pouring from a bottle. Sit back and don’t take everything so personally. They’re not as much a reflection of YOU as they are of THEMSELVES!! That’s good news!! Truly, miraculously, we are off the hook for the off the hook kids – JUST DO YOUR VERY BEST. I will too. No matter how many children you have – the whole show is just HARD. Hard. Hard. Hard. But have HOPE – the ratio of hard is slowly but surely flipping itself with every new day. That option to be on a beach someday sipping a bevy is nearer than you think. And one day, you’ll remember what mattered most… all the touching, impactful moments you got to be present for. To my fellow moms, working hard everyday, giving your kids the best you have, you are AMAZING. P.S.- Every now and again these kids come through for us with a nod of encouragement. They do see us. They see our efforts. They know what we do for them. And if they don’t – there’s always Cool Whip you guys. This season, romantic lace has resurfaced as a hot trend. 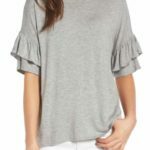 We love this top from Express, which flew off the shelves (this one is similar), paired with simple white AG skinnies. Perfect for dinner on an outdoor patio with the hubs this summer! No need to overdo the accessories with this, just a simple pair of earrings and some great heels, and you’re ready to hit the town. This next look is for when you need to kick things up a notch. We found this fun little dress by Gentle Fawn at one of our favorite boutiques, Willa June. The shape is so flattering; I’ve seriously worn it four times in the last 10 days! From graduations to weddings to date nights, it’s the perfect all-occasion dress. It hits just above the knee in the front, with a slightly longer length in the back. I adore this style, and get a million compliments every time I wear it. Pair it with a great necklace like this one from Willa June, and wedge sandals to complete the look. Pretty, fresh, and pulled together! Summer’s right around the corner, and that means grilled dinners, cold drinks, and lots and lots of watermelon! 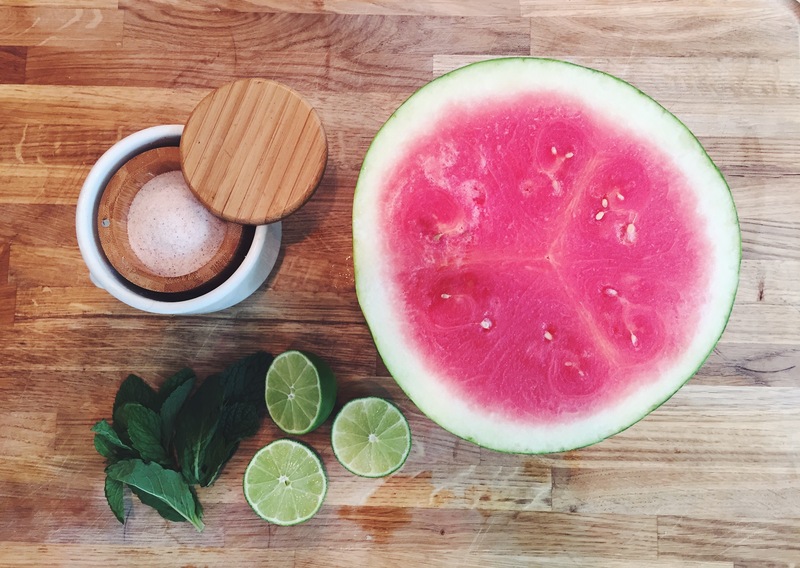 Today, we’re sharing our favorite way to serve watermelon; with lime, sea salt, and fresh mint. It’s a seriously addictive combination that will keep your family (and dinner guests) coming back for more! 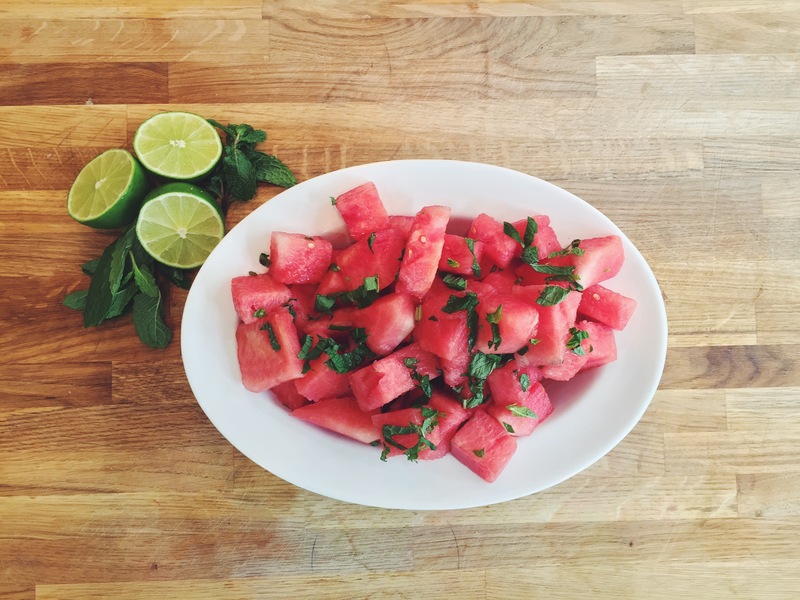 Cube your watermelon and place in a pretty serving dish, tossing with fresh-cut mint. Squeeze two lime wedges over the watermelon, and sprinkle with sea salt. Toss and chill, or enjoy immediately! 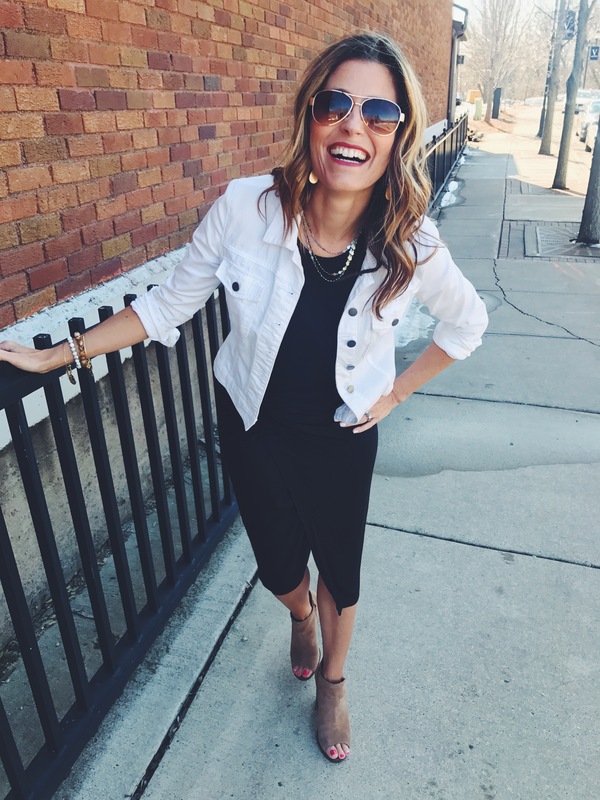 Meet Becky Quick: news anchor, mother, and the first in our “Moms Who Inspire” series. More than four hundred MILLION people across the world have invited her into their homes for business chat over breakfast. 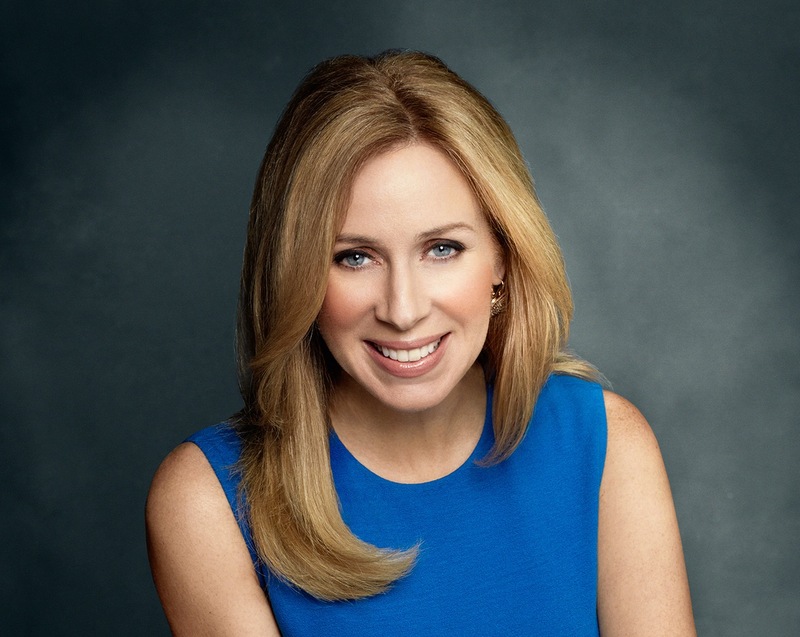 As an anchor on CNBC’s signature morning show Squawk Box, Becky Quick holds a powerful platform where she boldly banters with some of the world’s most influential people–Warren Buffett and Bill Gates included. If that’s not impressive enough, she’s also interviewed three U.S. Presidents, authors a regular column in Fortune Magazine, and has hosted panels at some of the most prestigious conferences, including Fortune’s Most Powerful Women’s conference. Inspired? Me too! But wait. There’s more. 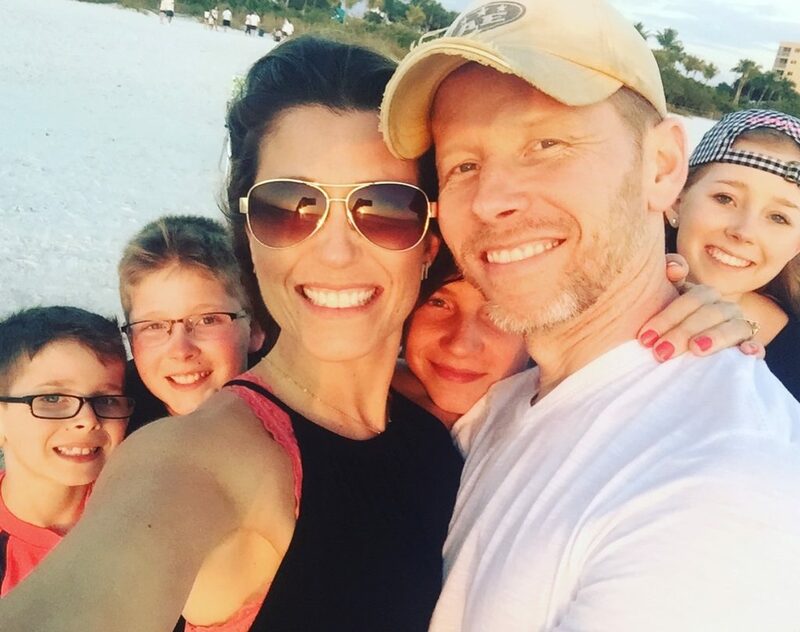 On top of her big-league career in the spotlight, her most prominent job is behind the scenes at home where she’s raising four kids, from baby to big, with her husband Matt. 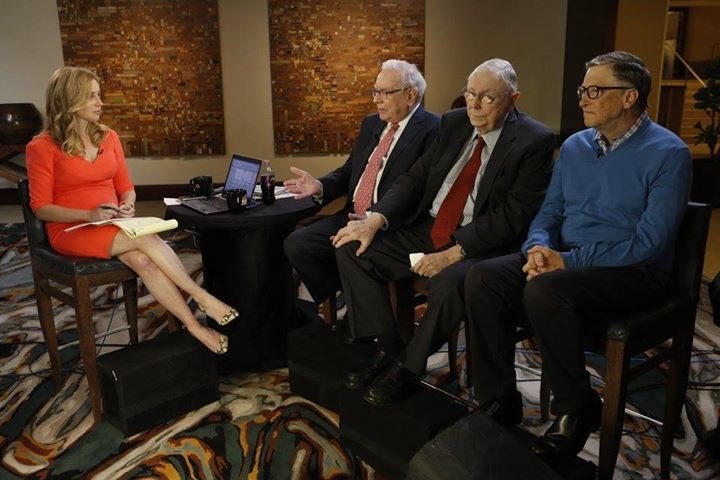 Recently, I caught up with her as she was traveling to Nebraska, family in tow, to interview Warren Buffett and other business leaders at the Berkshire Hathaway Annual Meeting. There in her hotel room base-camp, we sat down to talk about kids, dreams, and why motherhood is the best job ever. Thank you, Becky, for sharing your heart and encouraging us to dream big. You are a game shifter, an uplifter, and over all these years, you’ve never let me play small with my life. You truly are a “mom who inspires”! I’m so grateful to have you in our corner, now and always. Design gestures come in all sizes and at all price points. Some choices we make are imitation, and some are original from the trails in our own idea path. 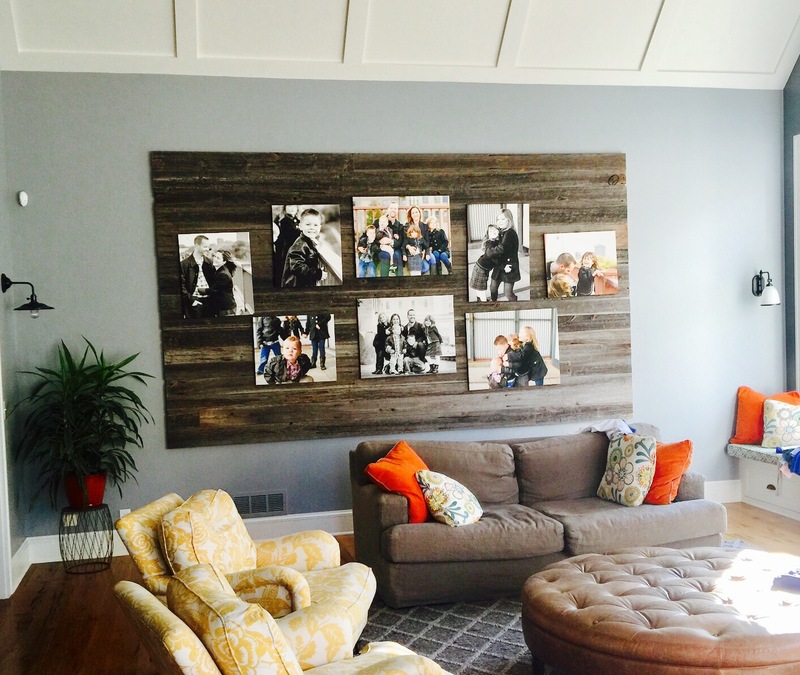 Today, I share with you my absolute, favorite idea for creating a stunning family photo wall. Here’s how you can recreate this in your own home. Head to your big box store and grab a handful of 2 x4 wood strips. You’ll use these in between the feature wood and the drywall to create a “floating” effect. 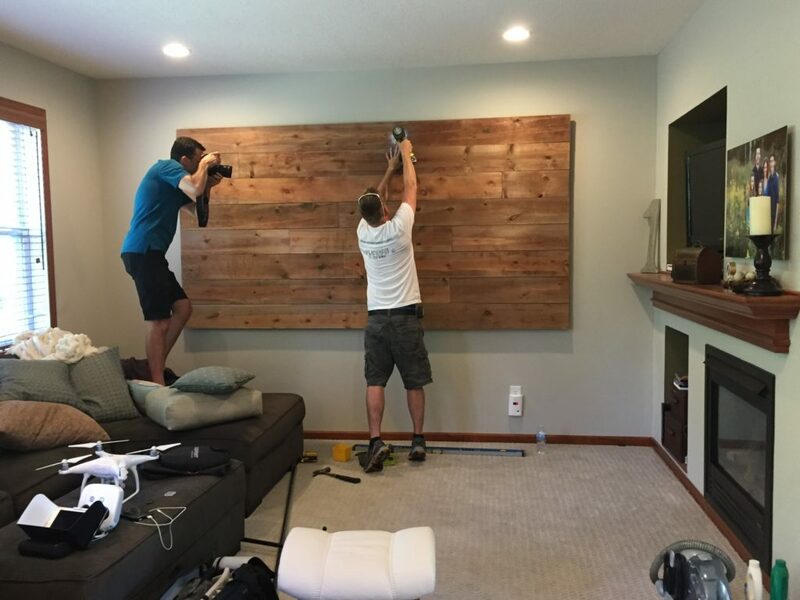 Install the 2 x4’s on the studs just shy of the height of your feature wall to ensure they’re hidden. 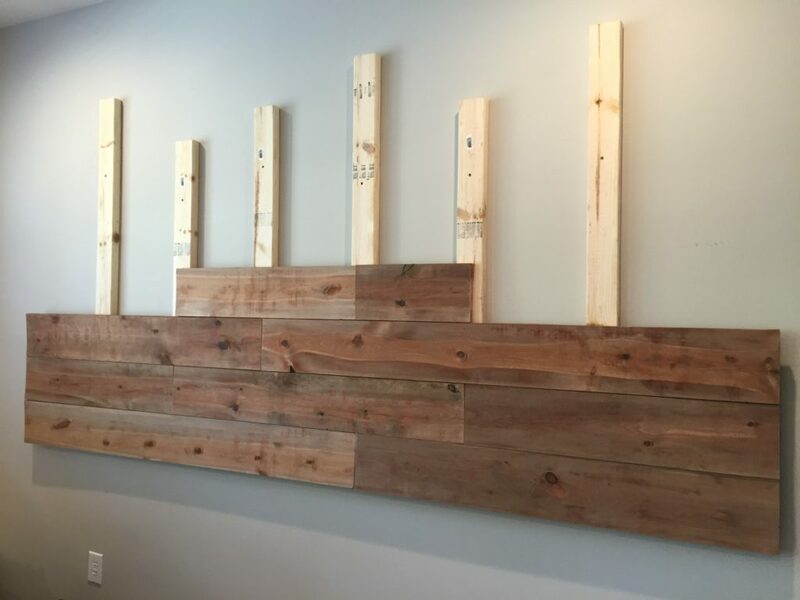 Next, decide on the pattern you want for your feature wood (we used weathered cedar at Nicole’s), and begin installing, utilizing the 2×4’s as your anchor for each piece. 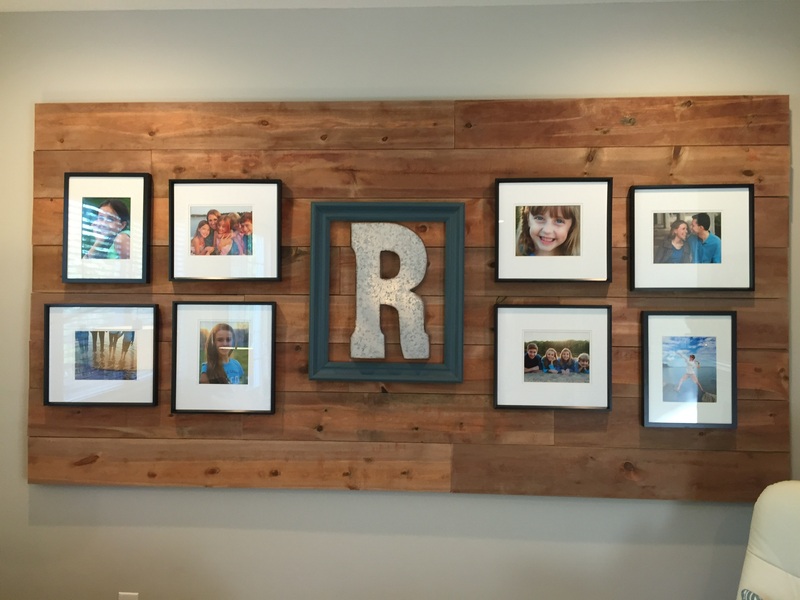 Once you install the barn wood, it makes a massive, eye-catching frame for what will become the focal point for your family photo display. 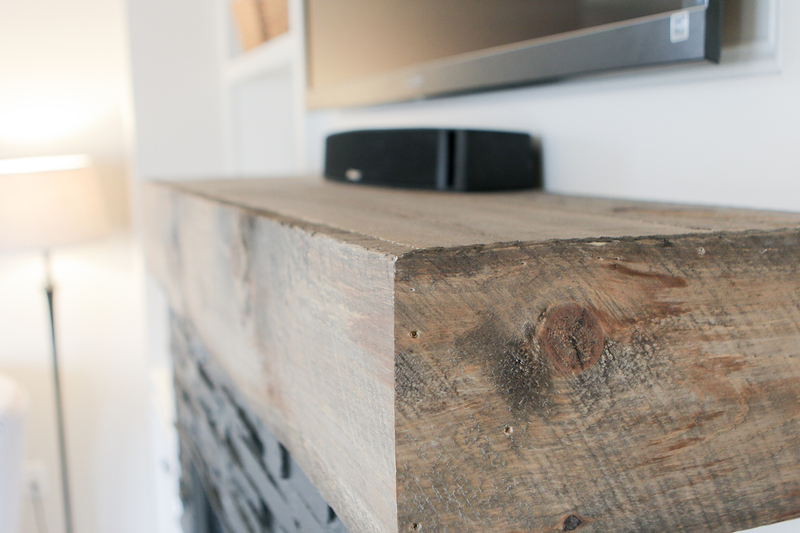 You can go high end or thrifty in order to create this reclaimed wood feature feel. 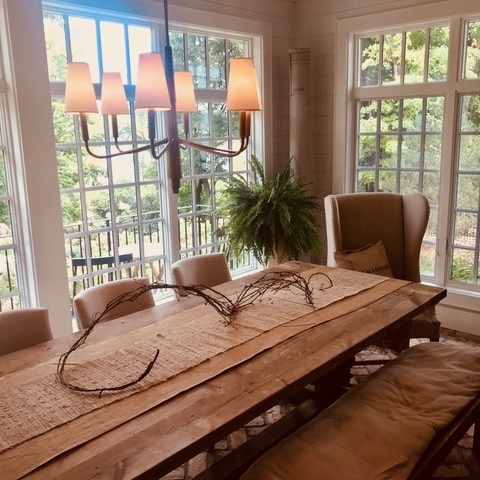 There are many places in your surrounding area that offer reclaimed wood in just the right color and style you’re after. 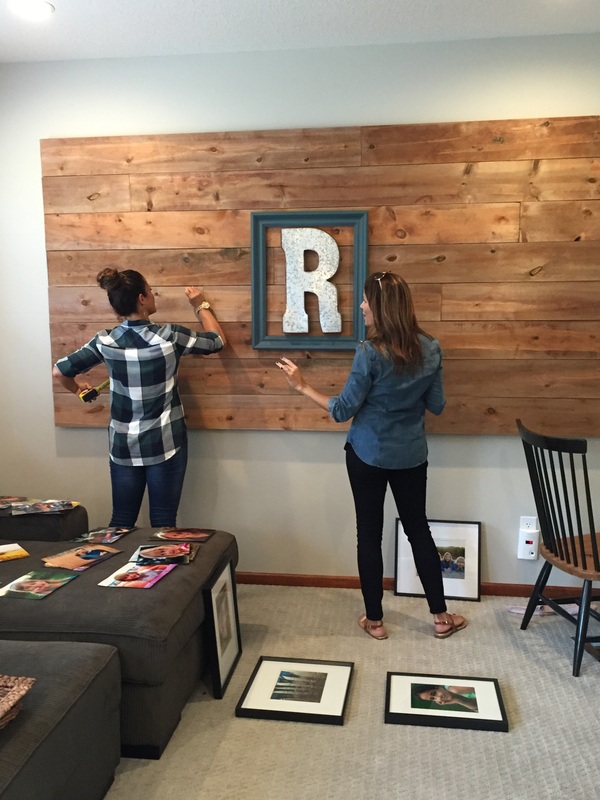 We love www.rusticrevivalbarnwood. Or, you can have wood decking cut in varying lengths to add to that “found” or reclaimed look. 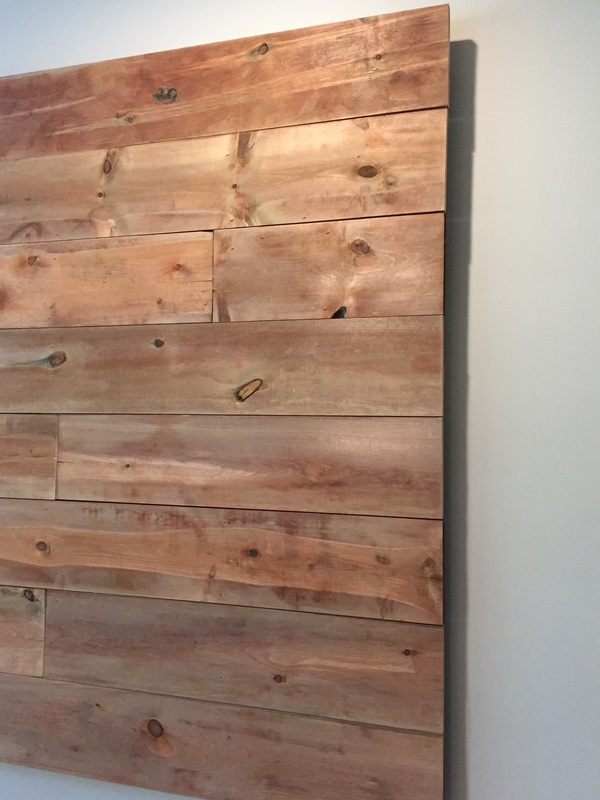 Once your wood feature wall is established, arrange your photos and anything else your heart desires in a way that speaks to you. 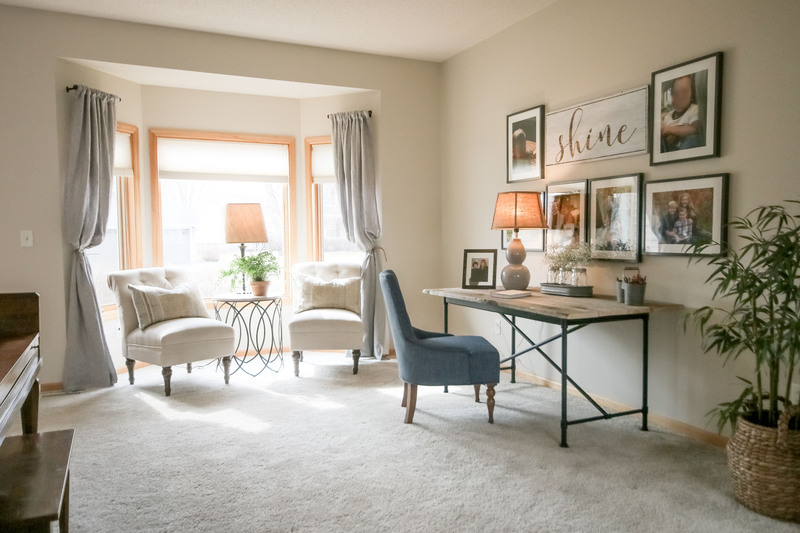 What was once a typical space will swiftly become a unique, warm WOW factor for yourself and guests alike. Bottom line, don’t be afraid to go big when it comes to making a statement with the greatest treasure in your home–your family! Shineup Living shared a post. Watch 👁 for our favorite Easter basket ideas 🐣. We hope to make your shopping a little easier this year! Thanks to The Jason Show for having us!!! If you have no idea what to buy this Valentine's Day ❤️, watch 👀our live segment on The Jason Show! We're sharing our top picks for gifts under $60!